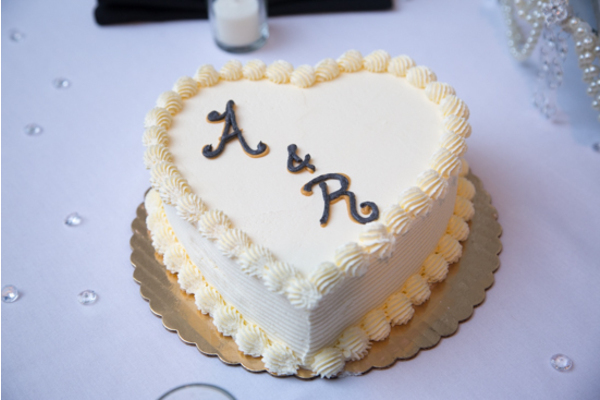 Congratulations to Alicia and Rob on their recent marriage! 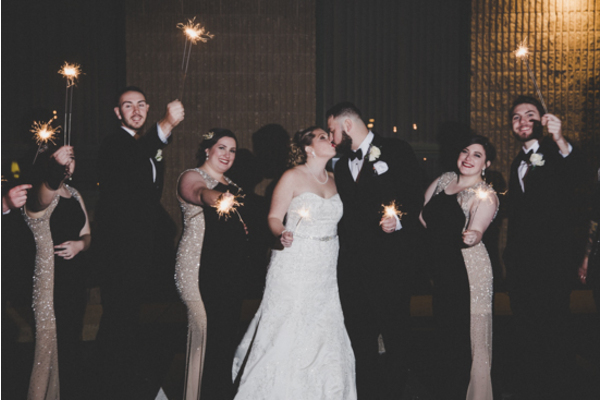 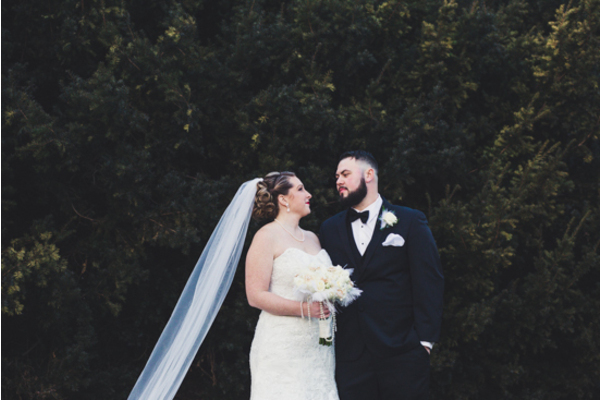 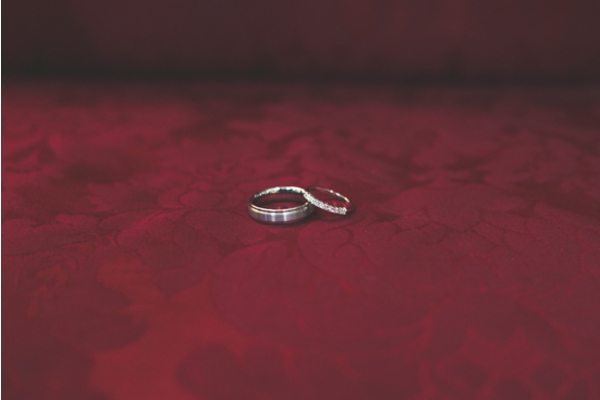 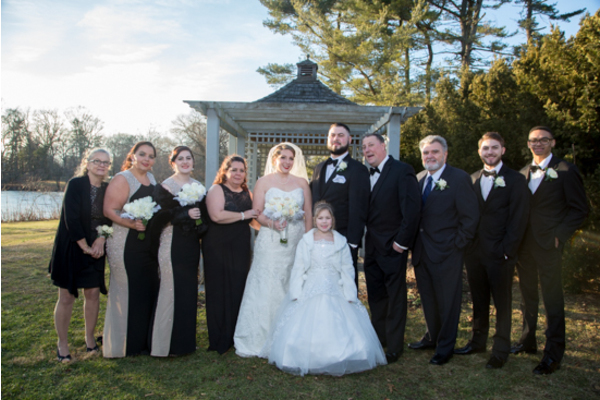 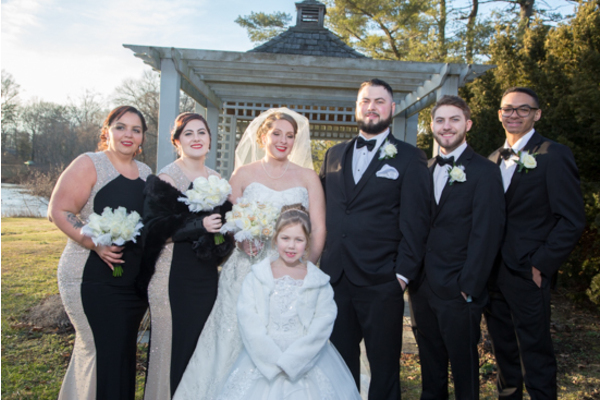 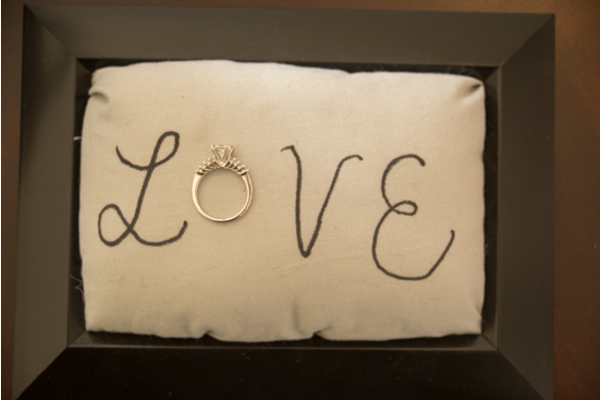 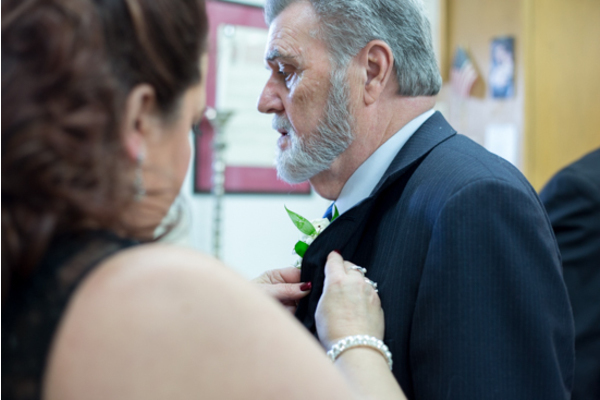 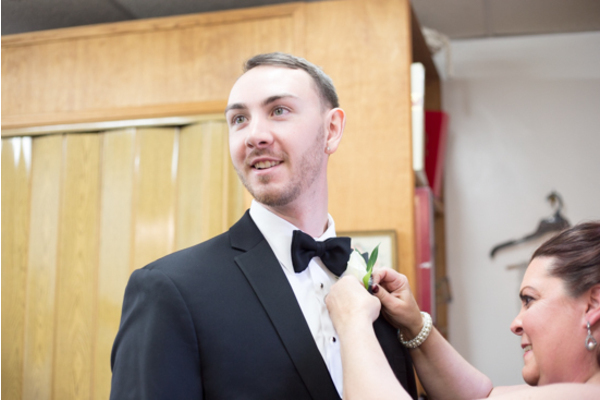 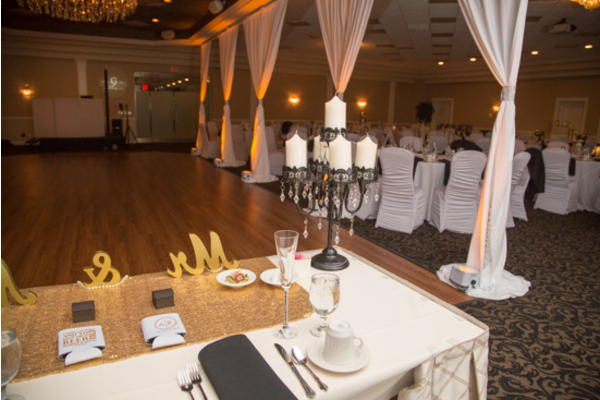 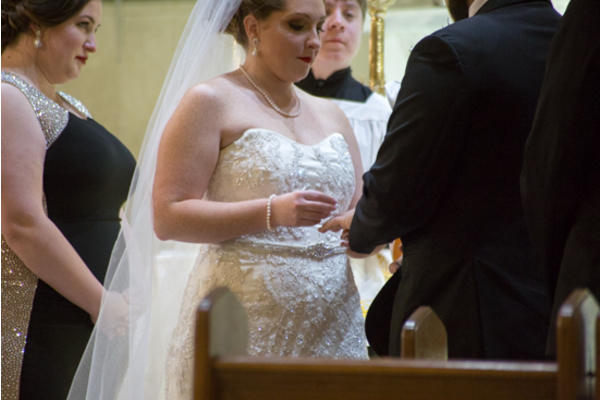 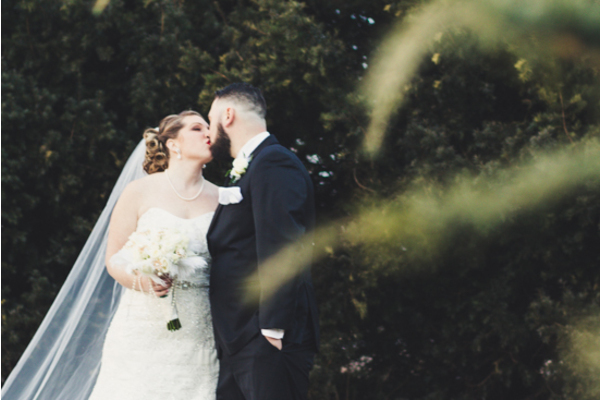 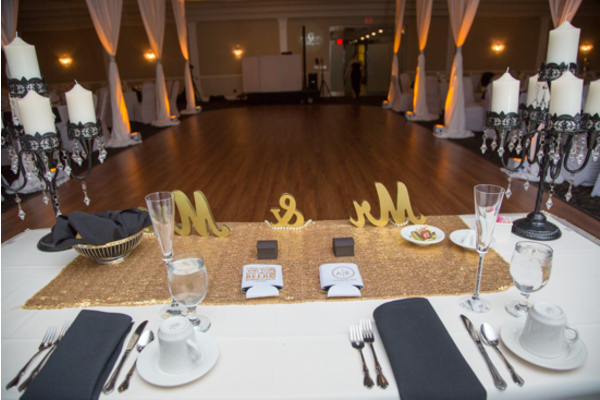 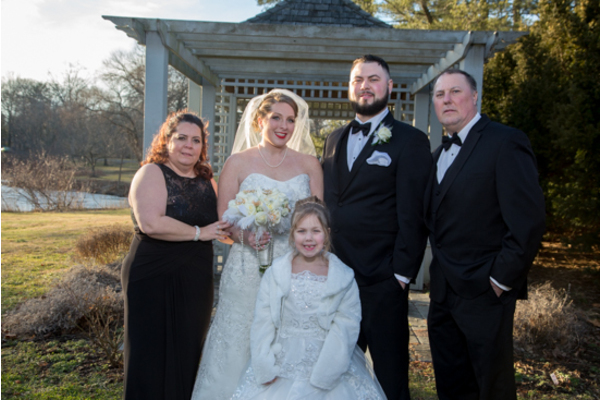 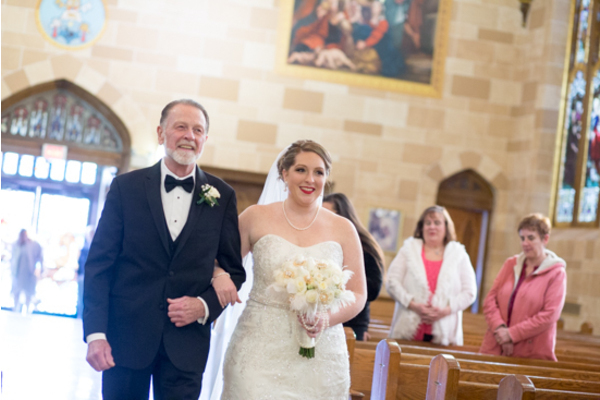 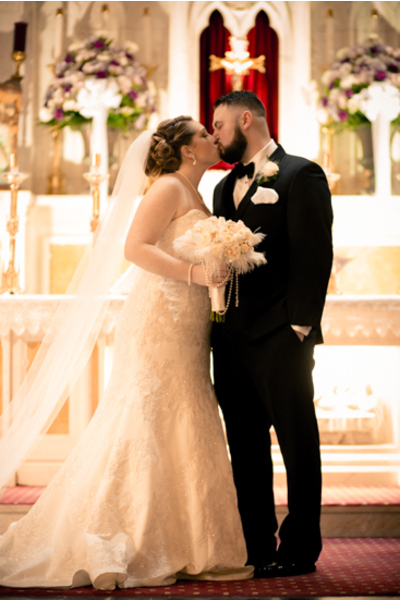 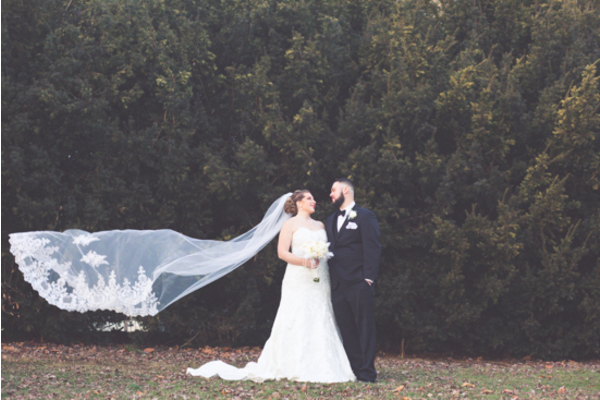 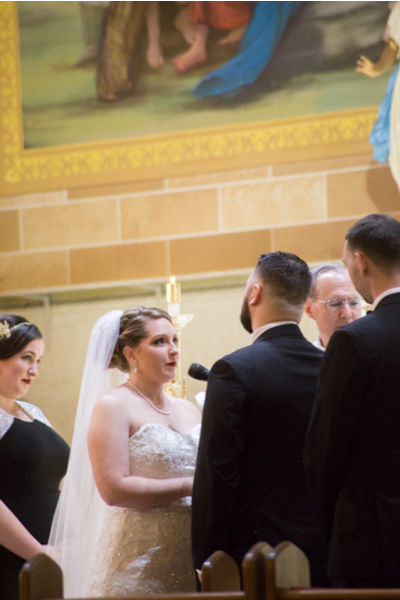 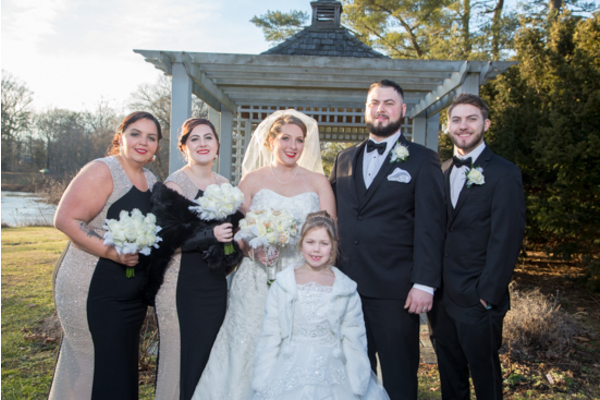 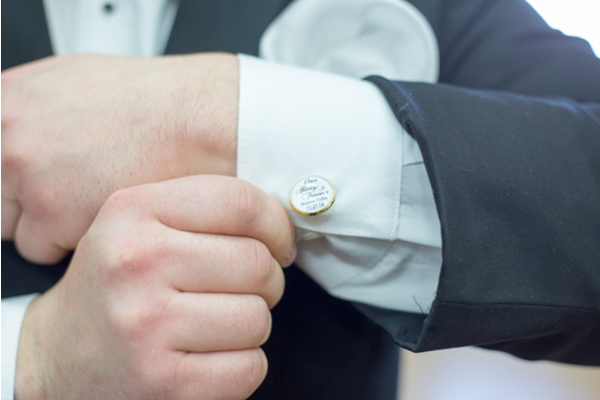 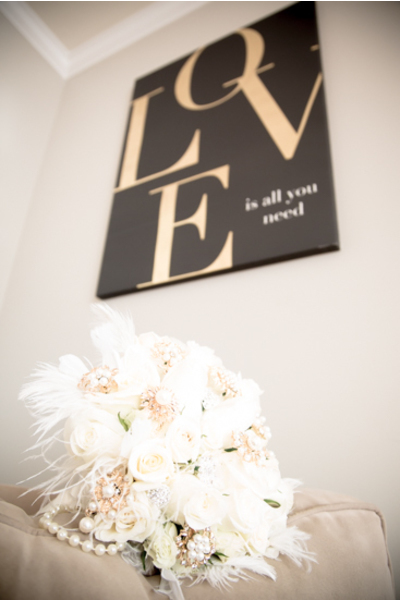 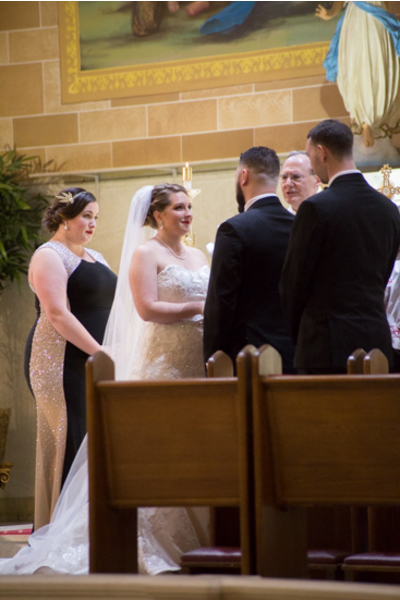 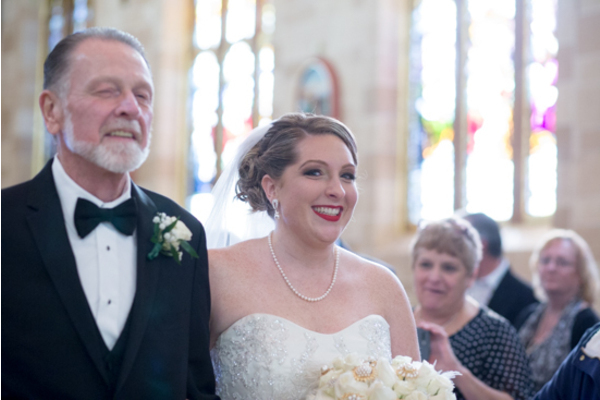 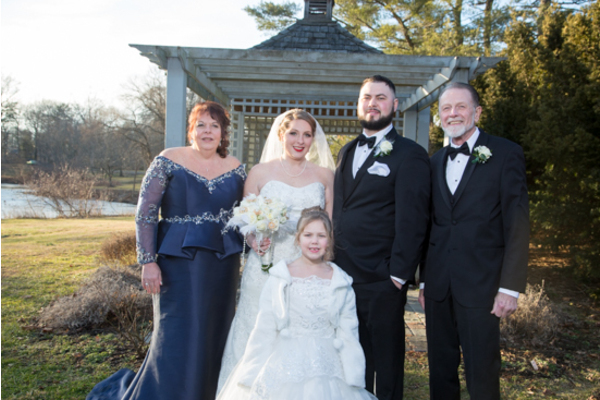 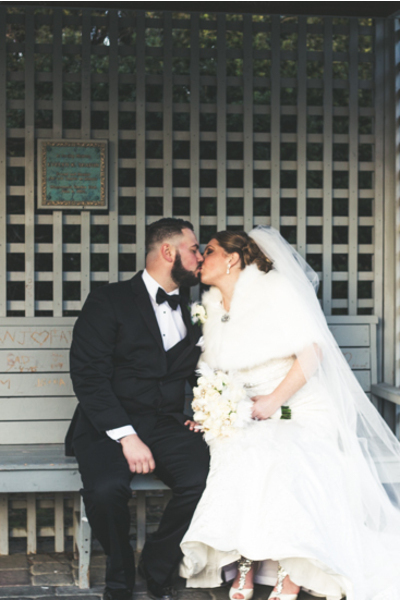 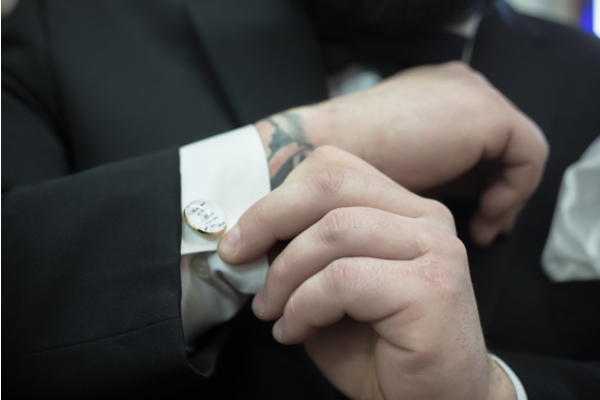 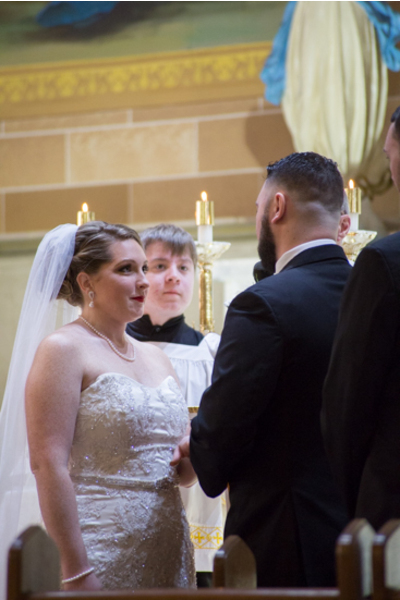 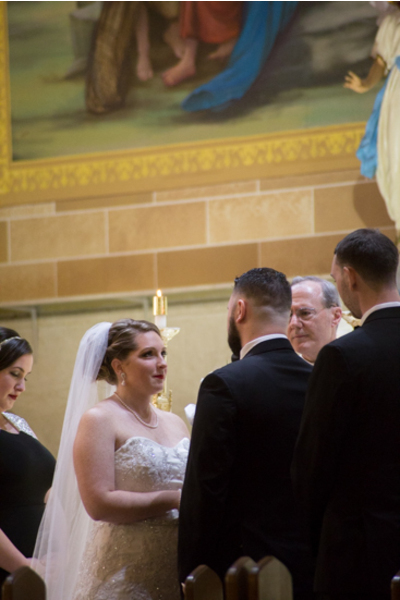 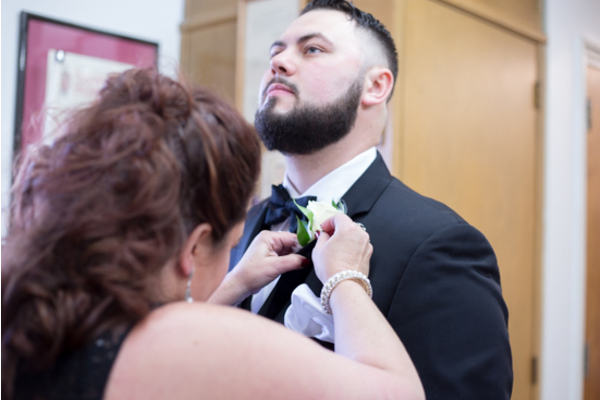 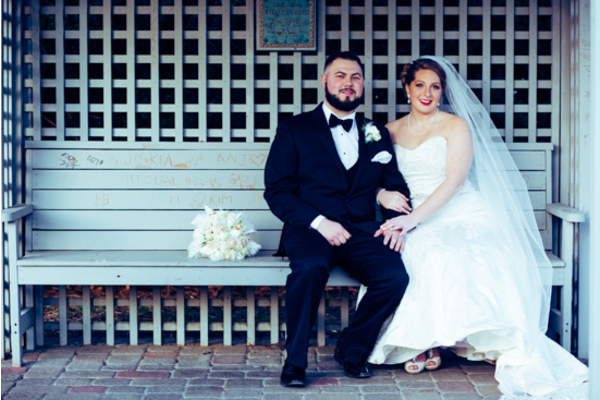 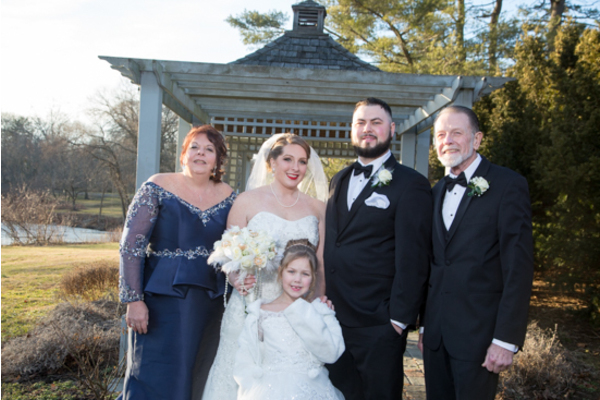 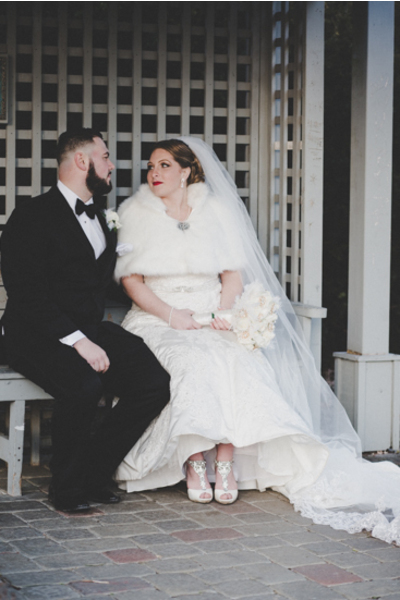 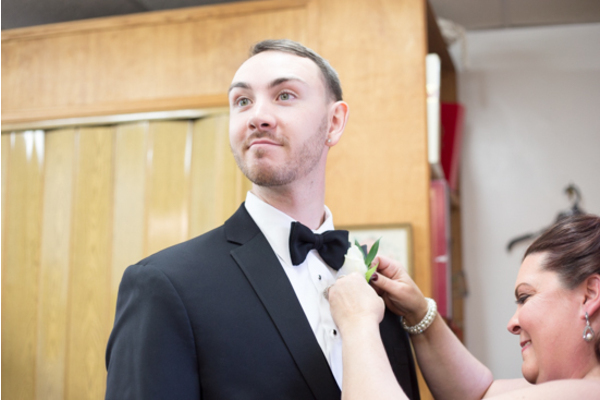 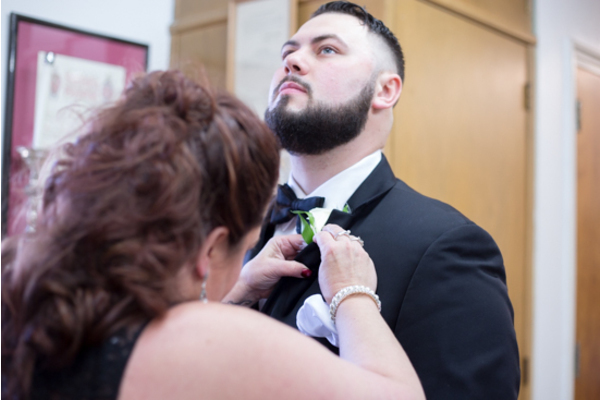 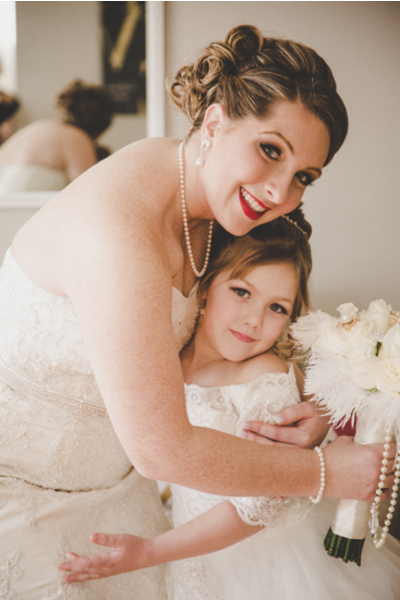 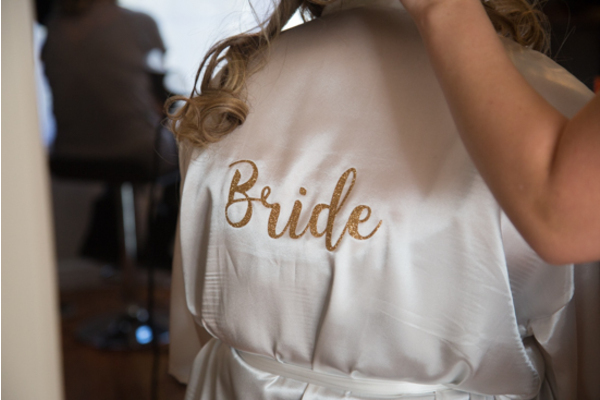 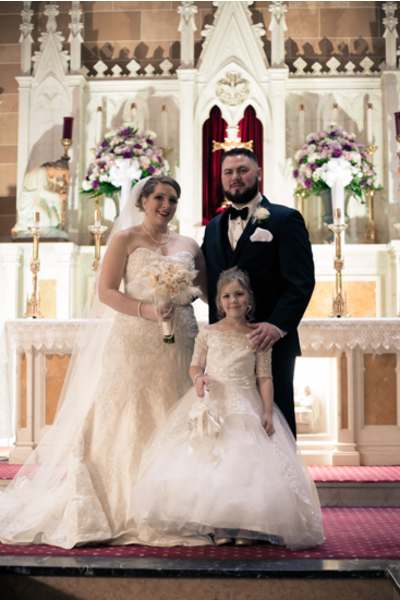 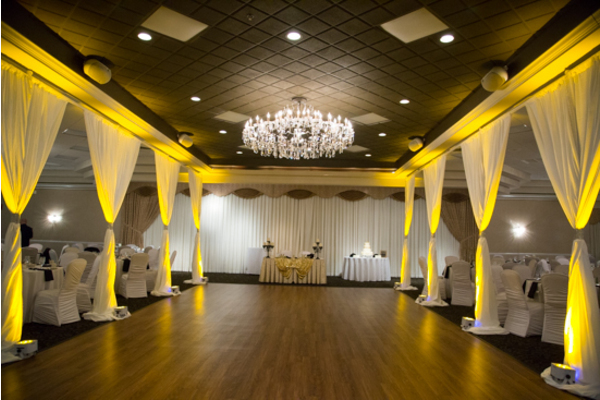 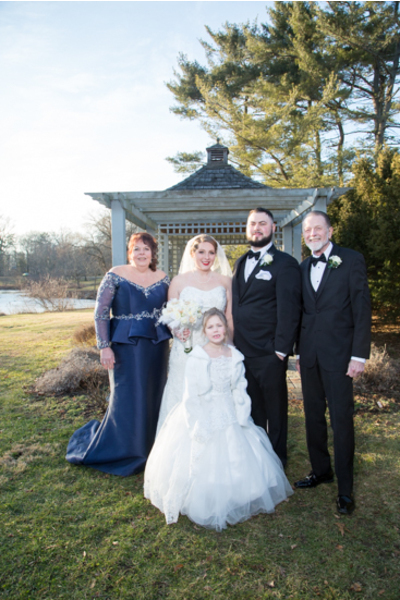 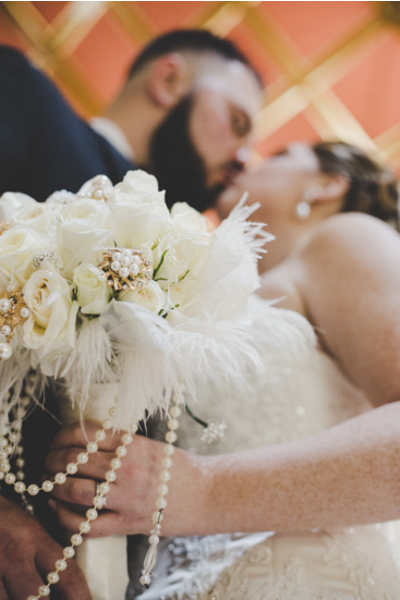 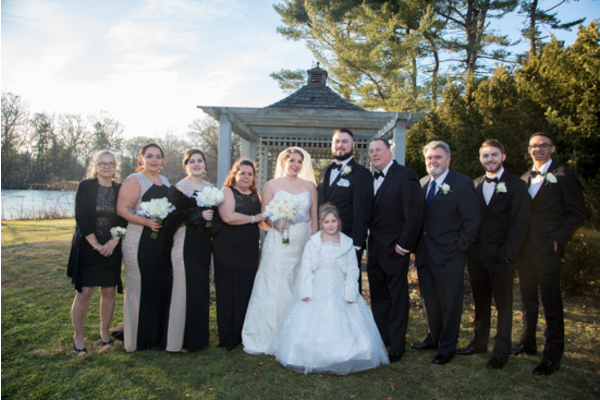 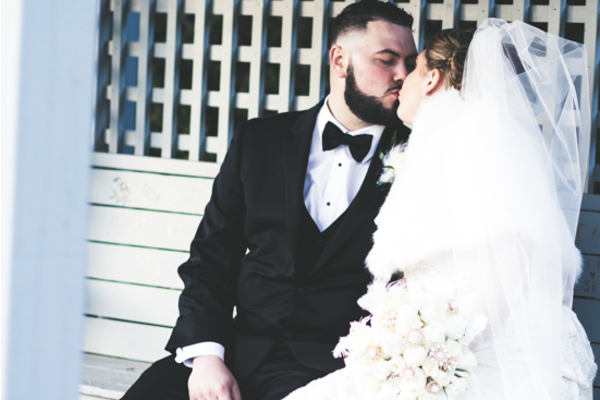 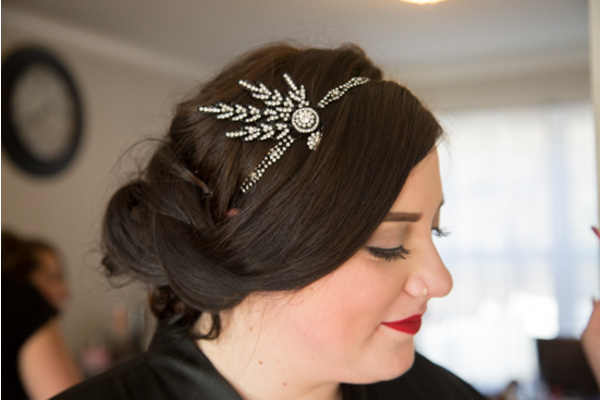 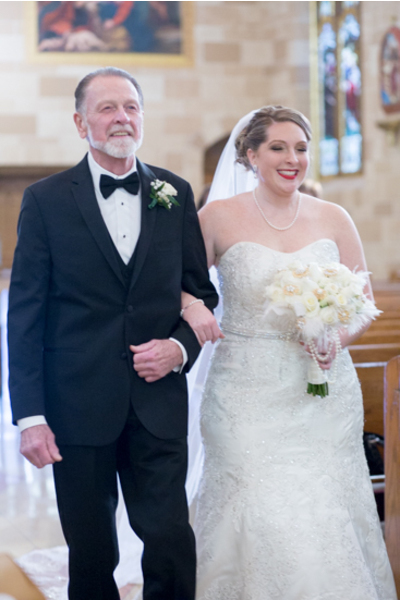 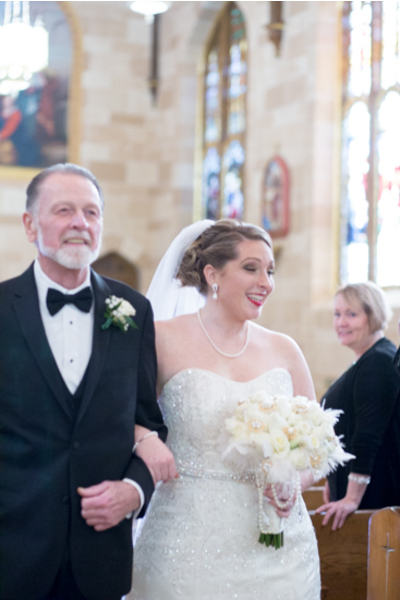 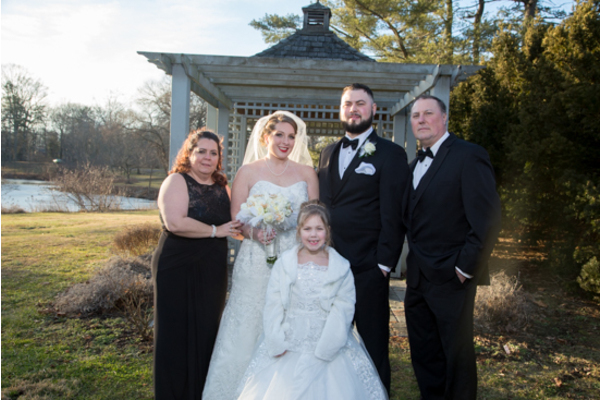 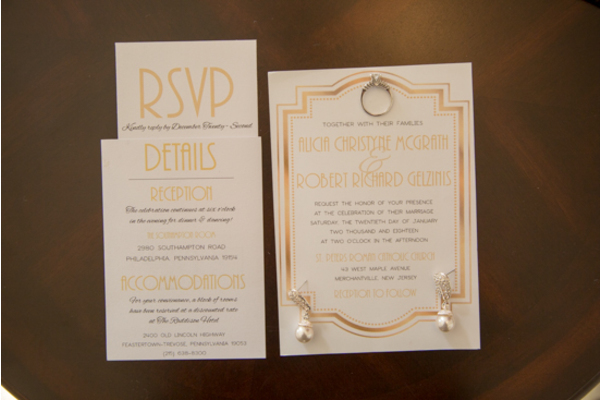 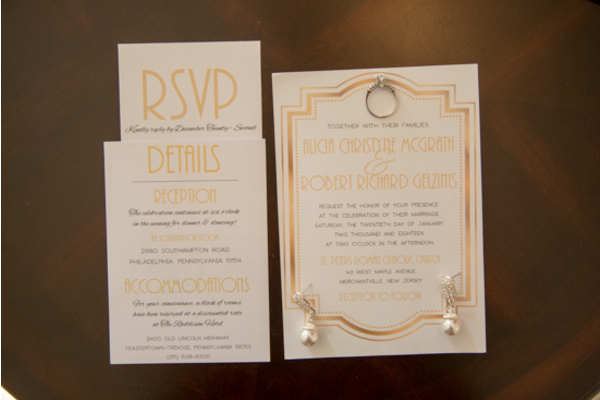 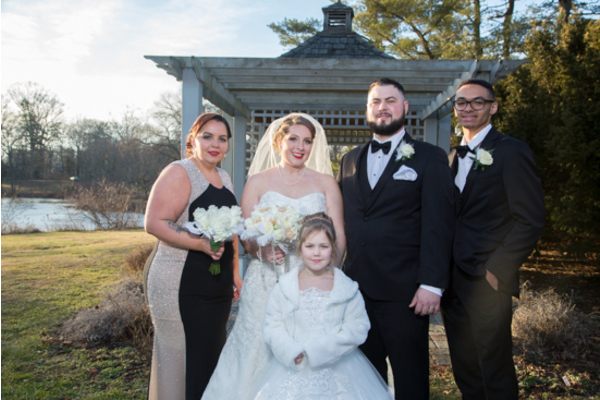 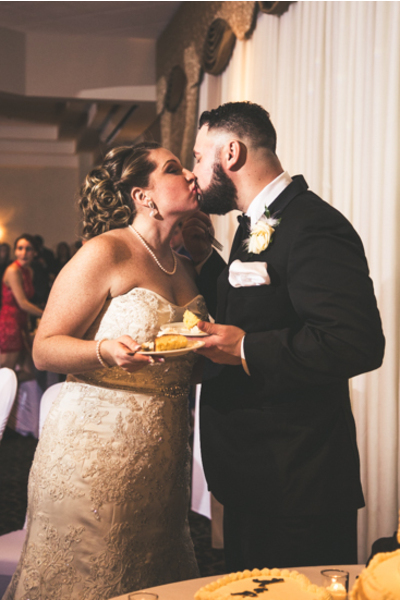 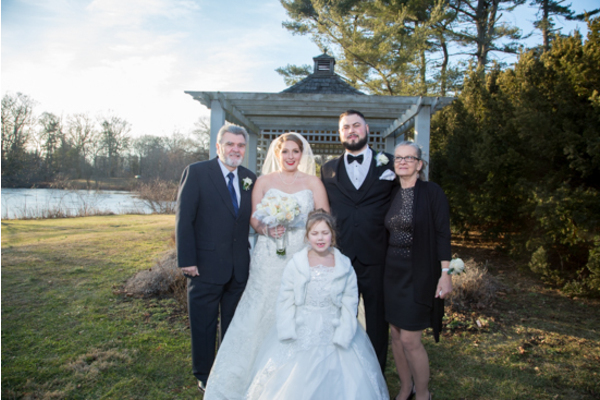 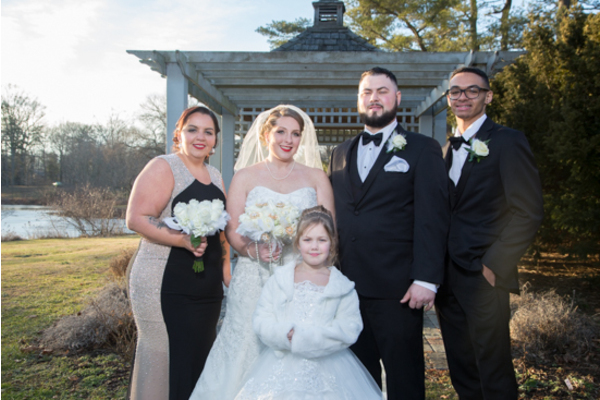 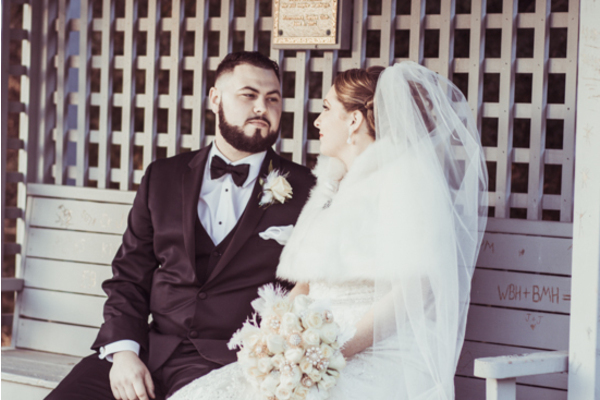 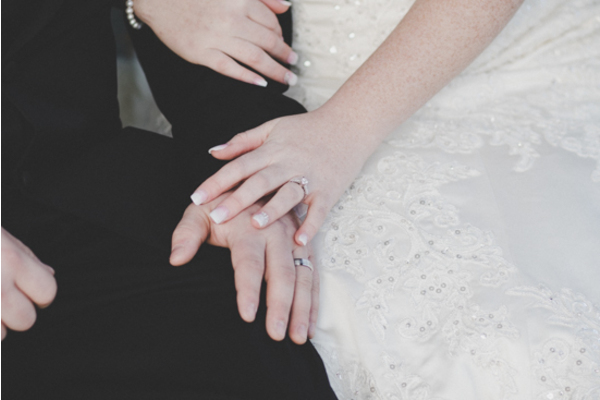 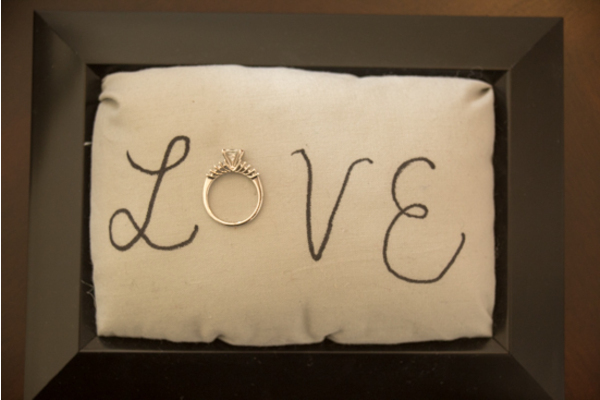 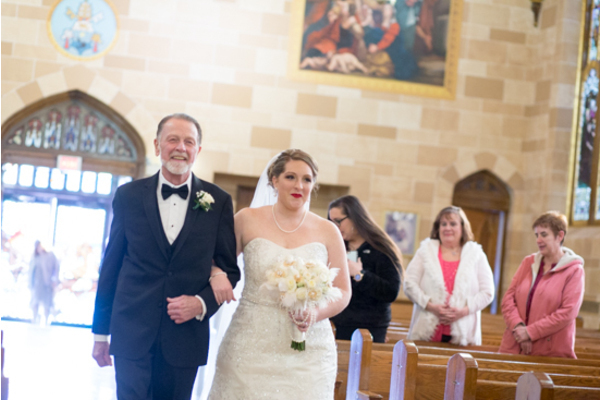 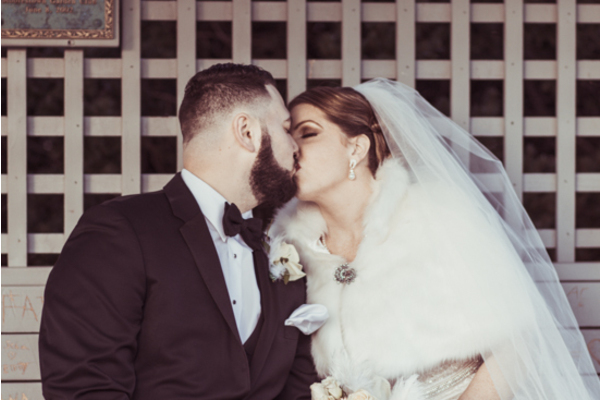 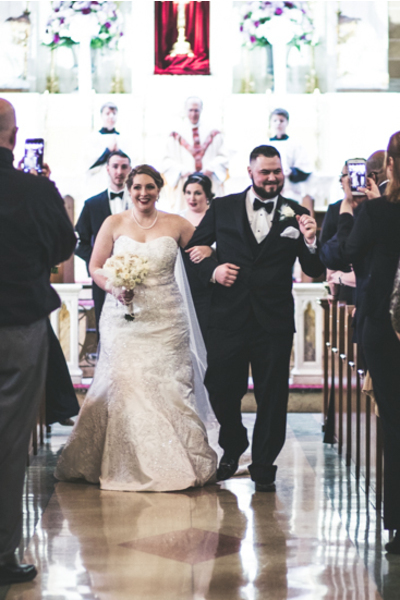 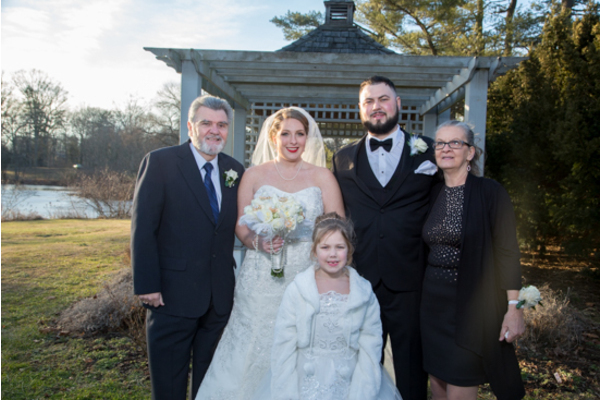 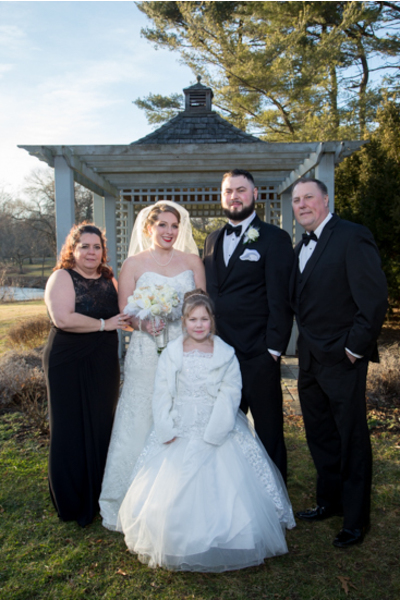 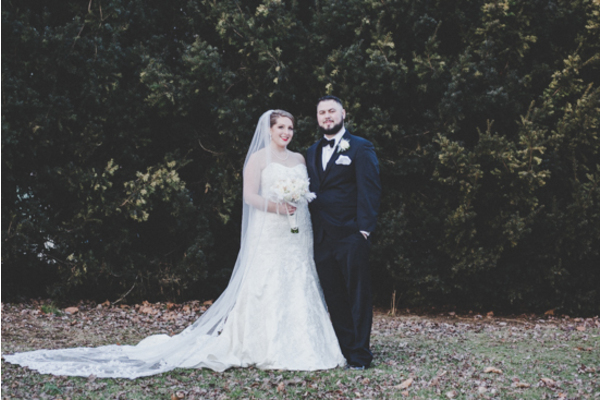 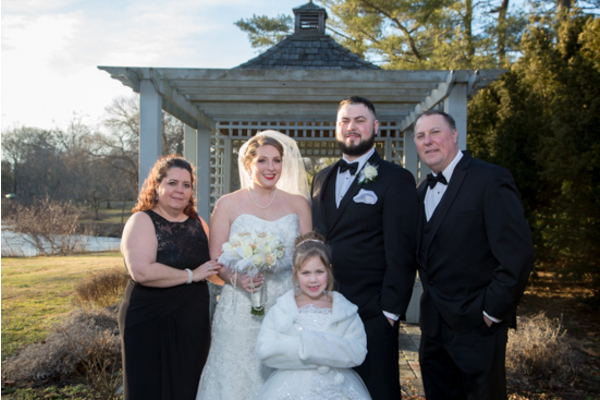 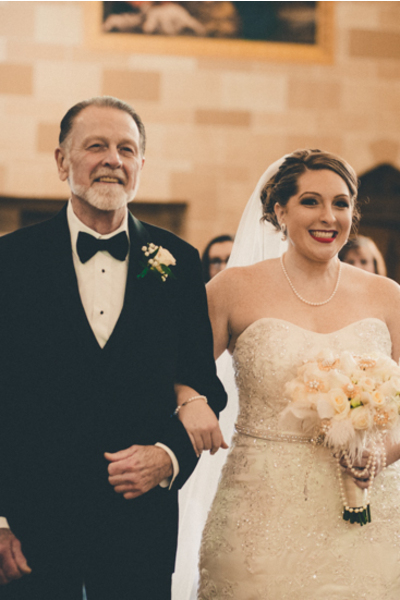 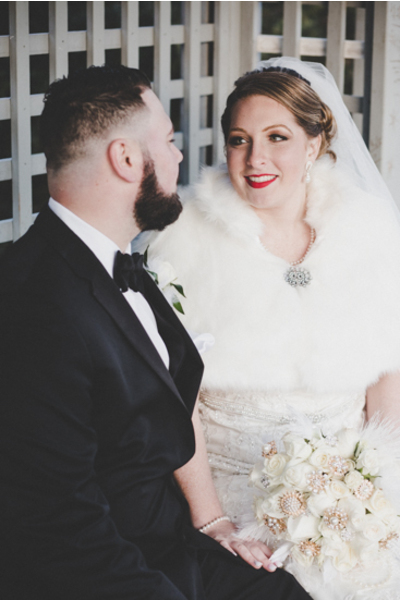 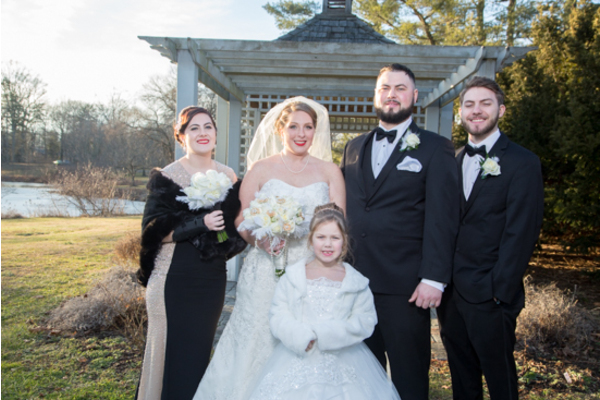 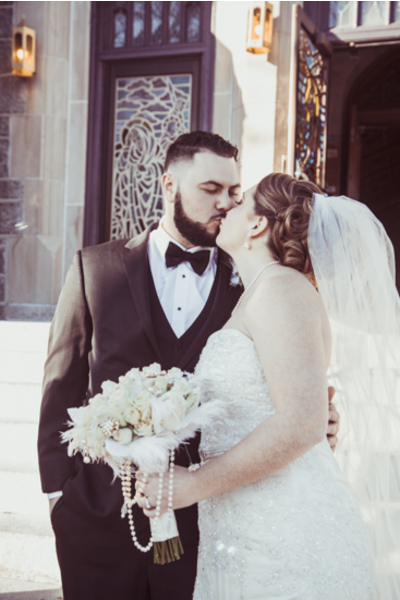 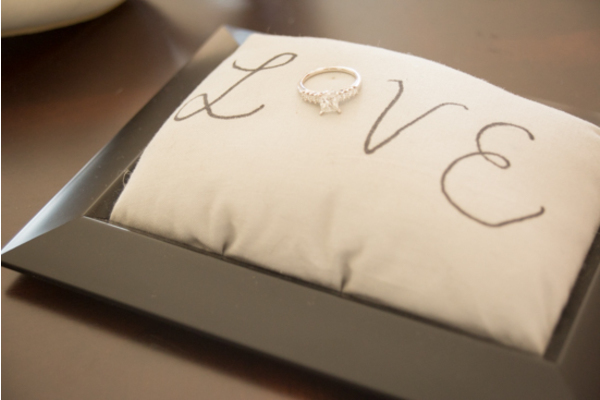 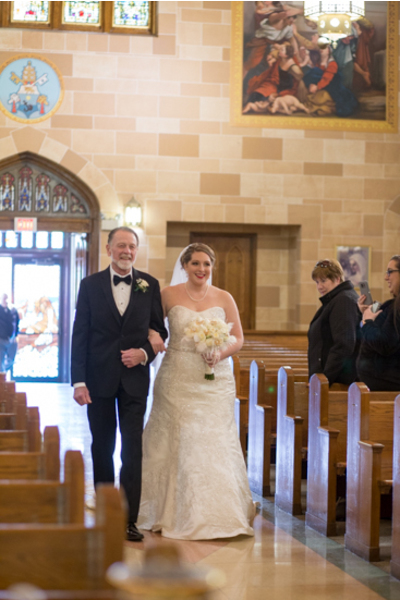 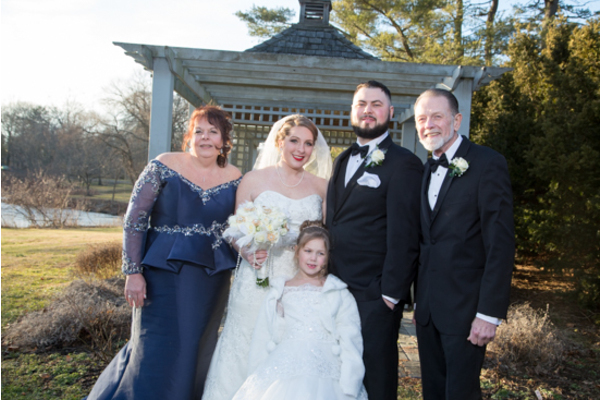 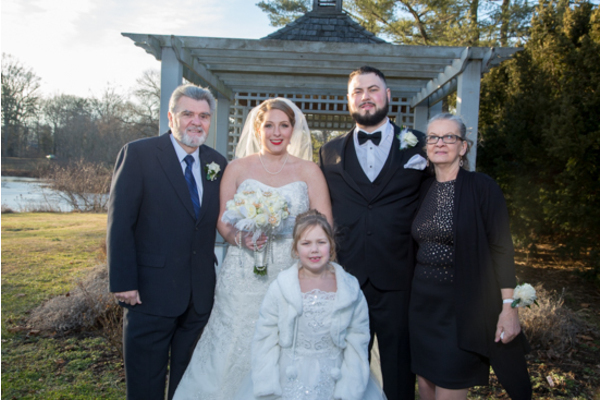 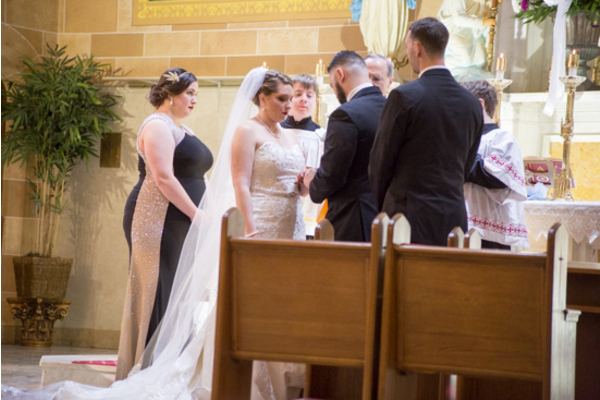 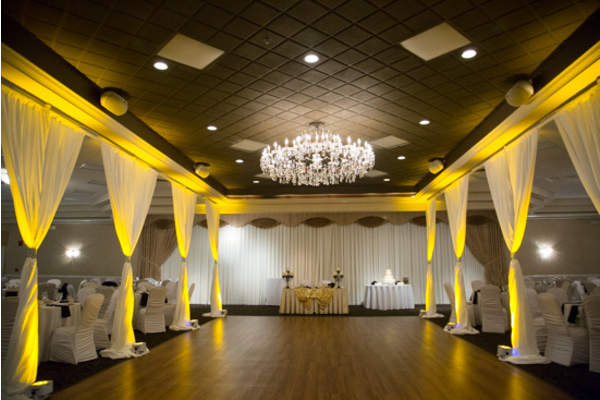 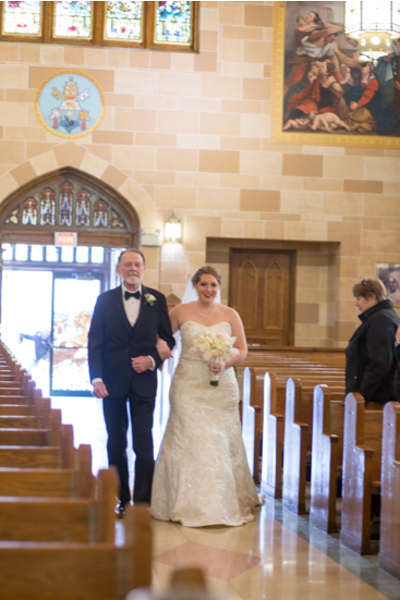 The two lovebirds exchanged their vows at the stunning Southampton Room in Philadelphia, PA.
Alicia’s magical day began with getting her hair and makeup done to perfection in her white silk robe that read, “Bride” on the back. 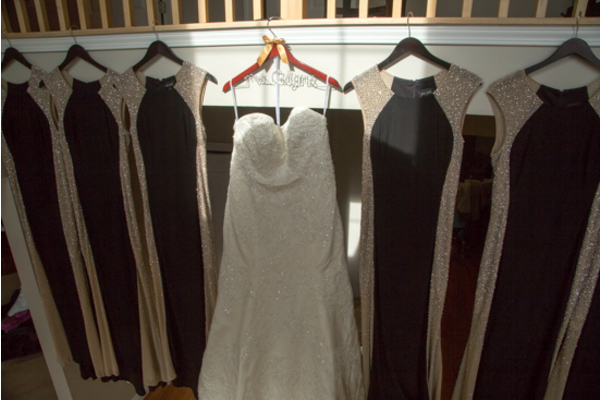 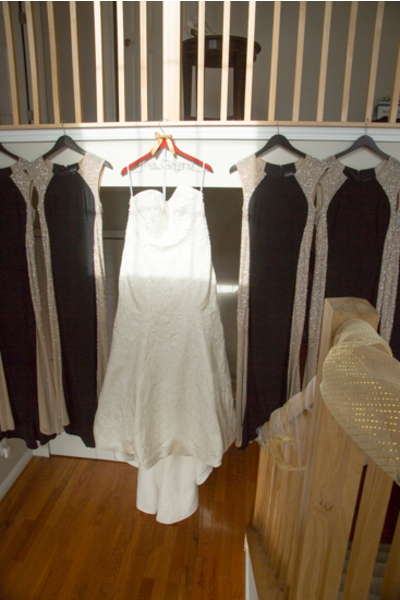 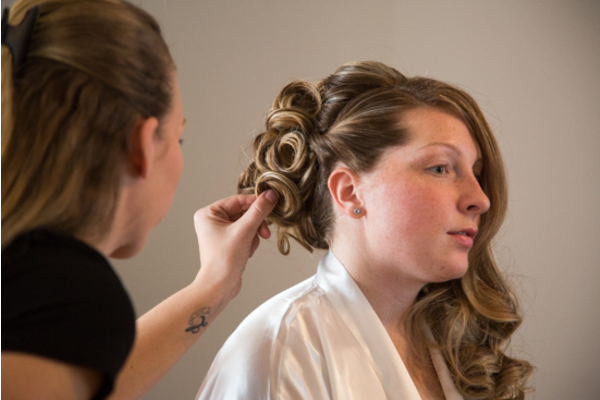 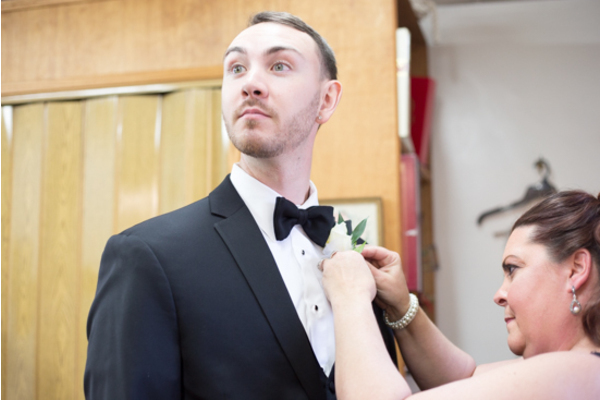 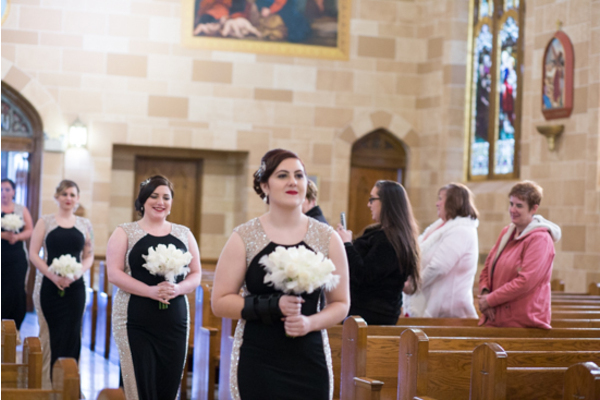 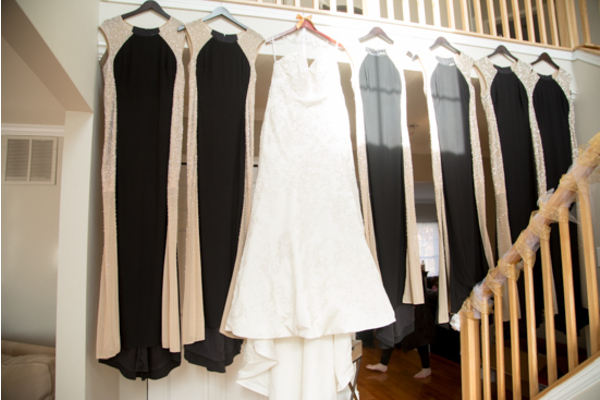 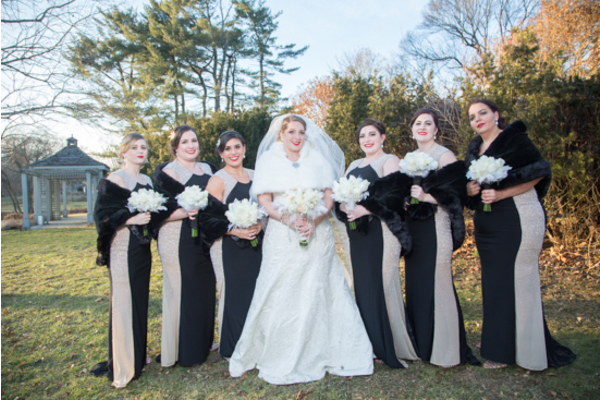 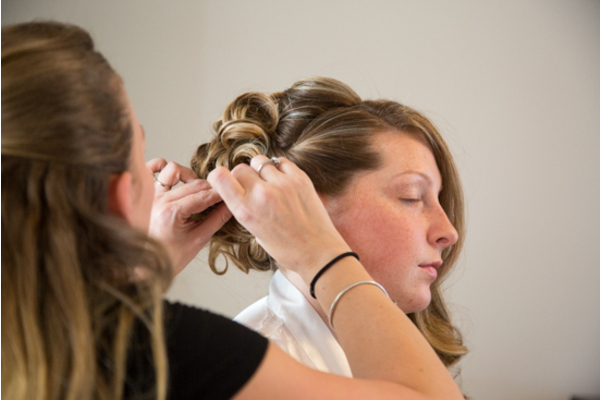 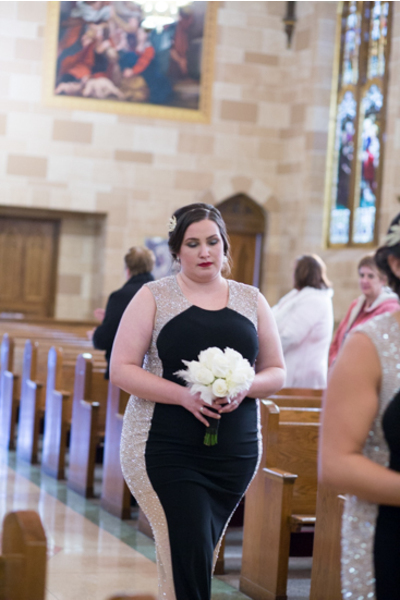 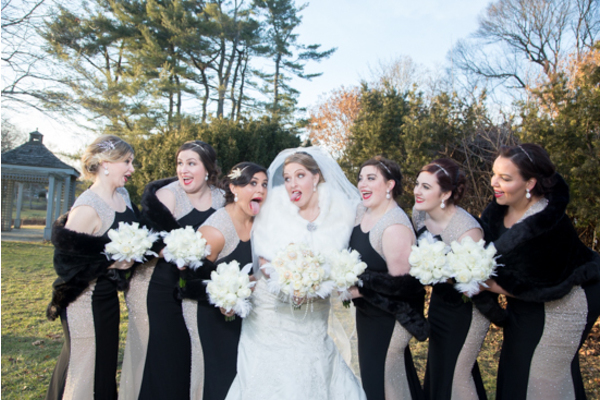 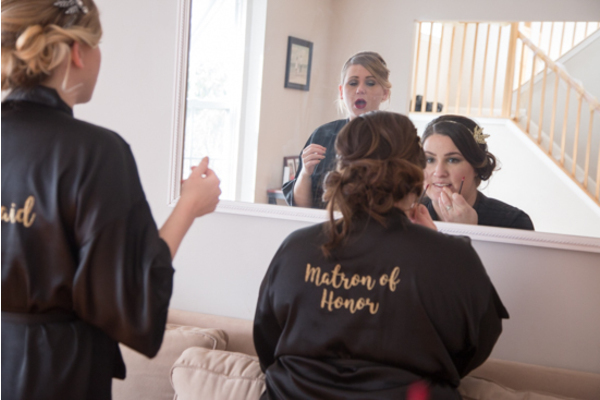 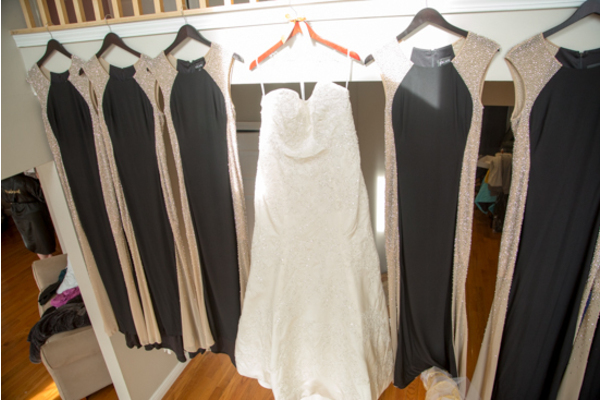 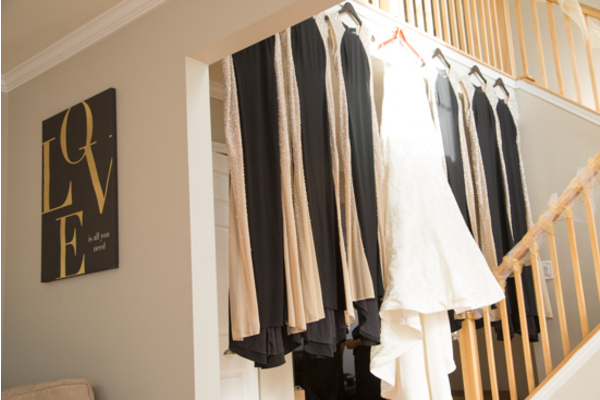 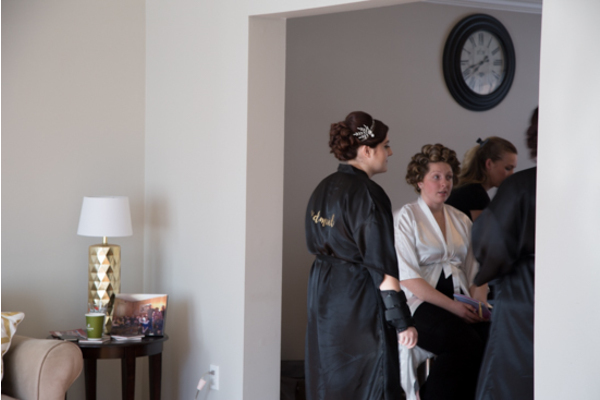 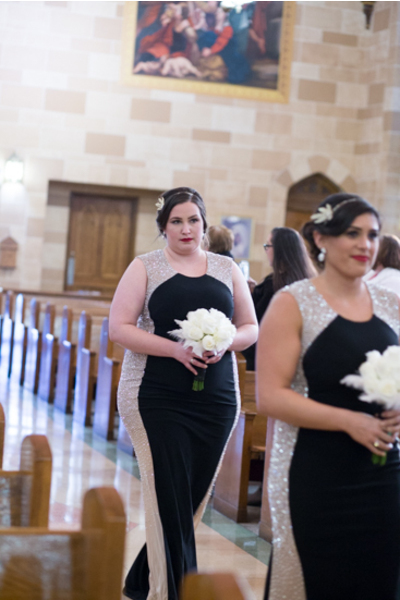 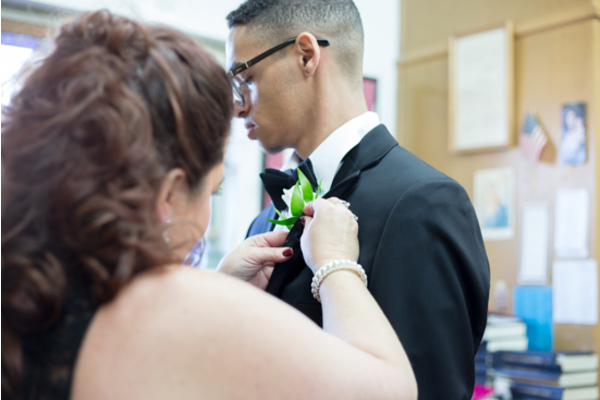 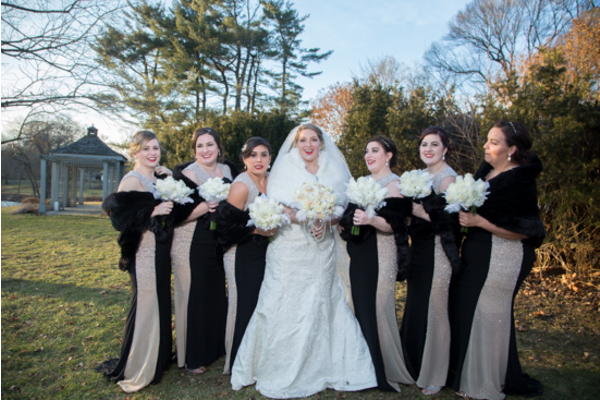 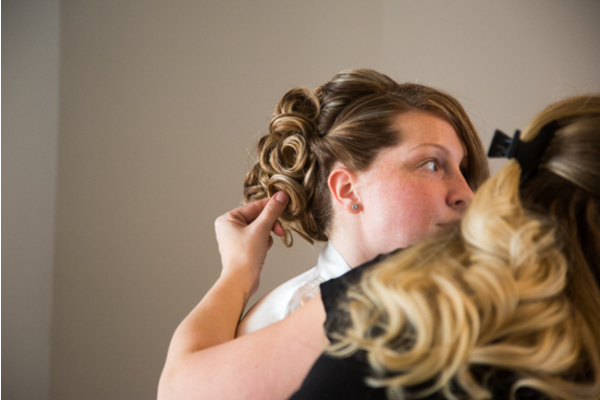 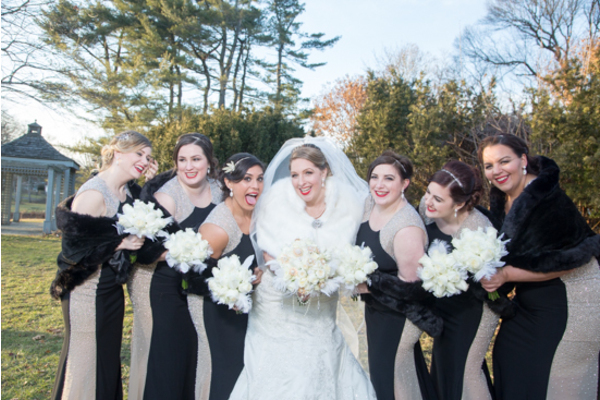 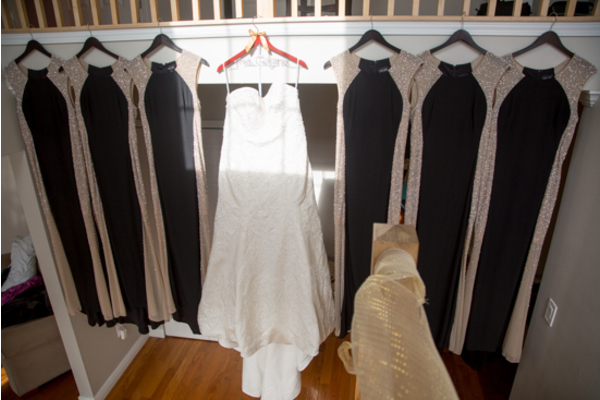 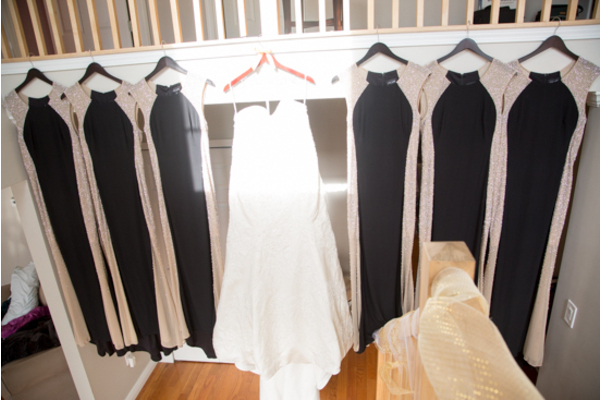 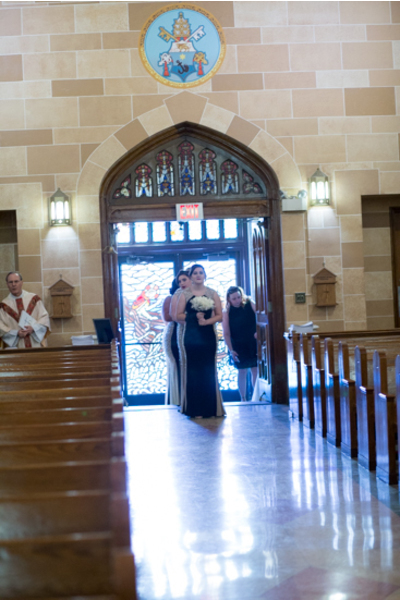 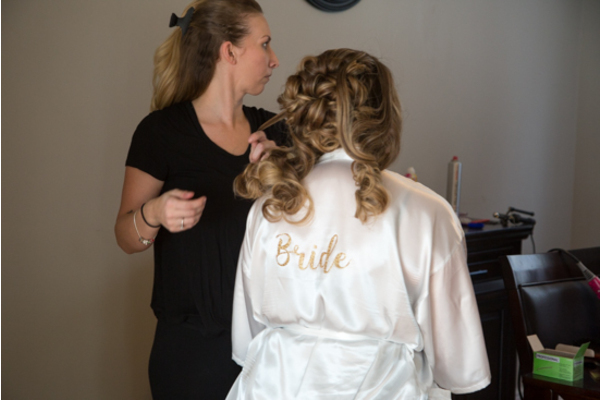 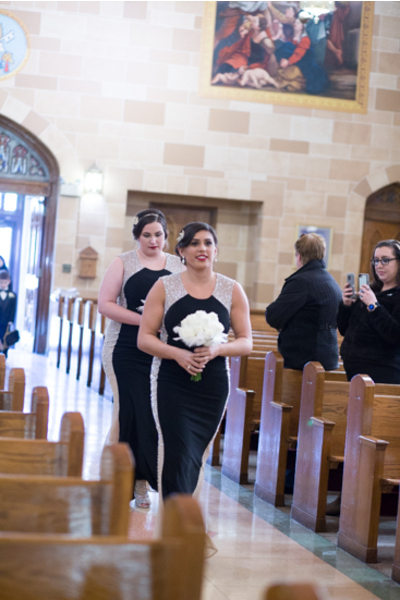 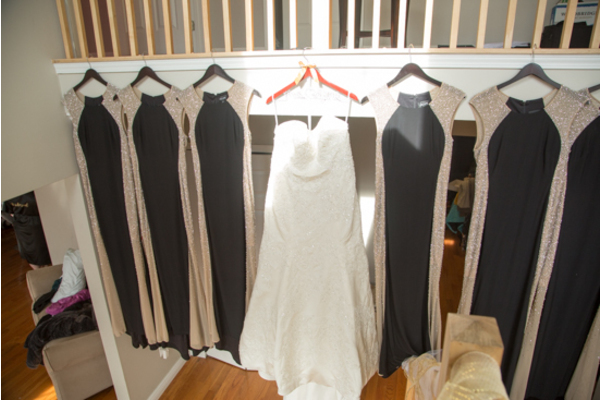 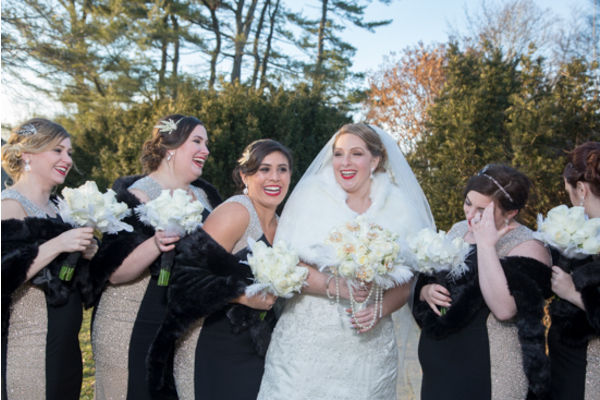 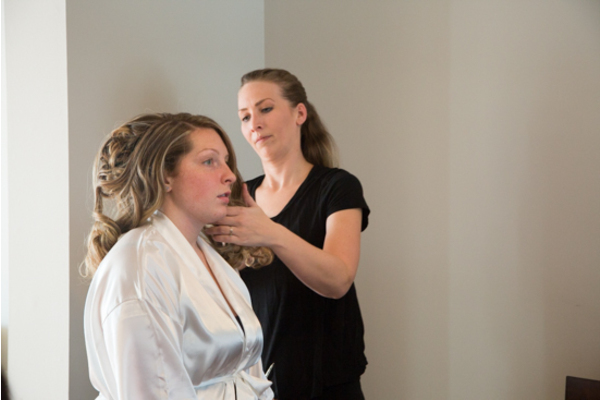 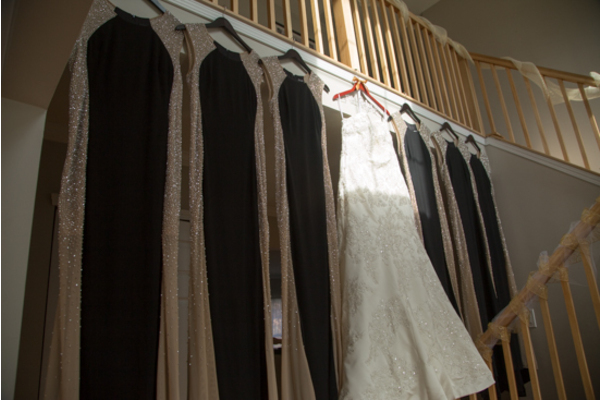 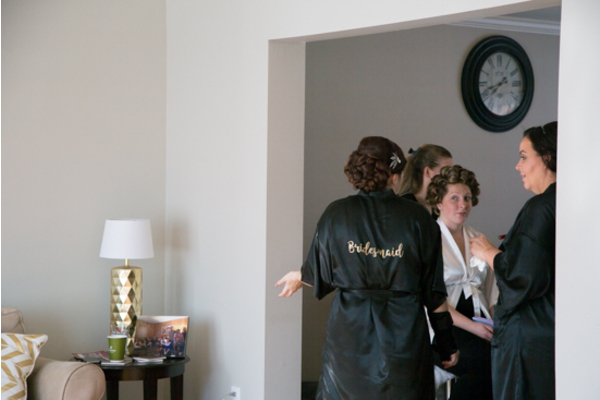 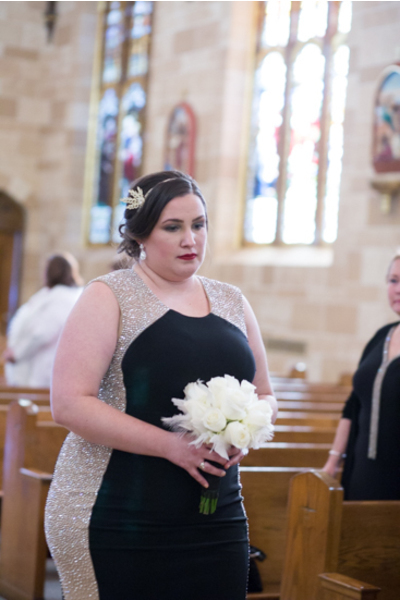 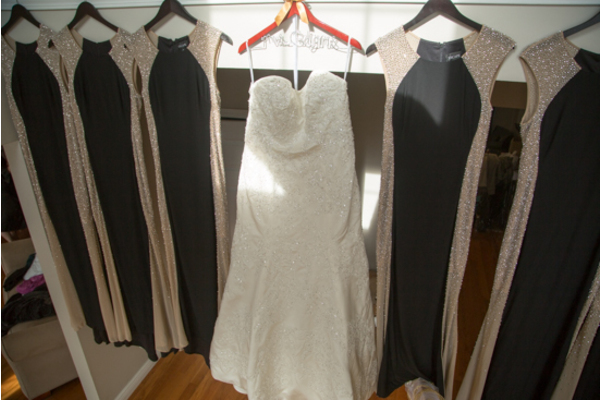 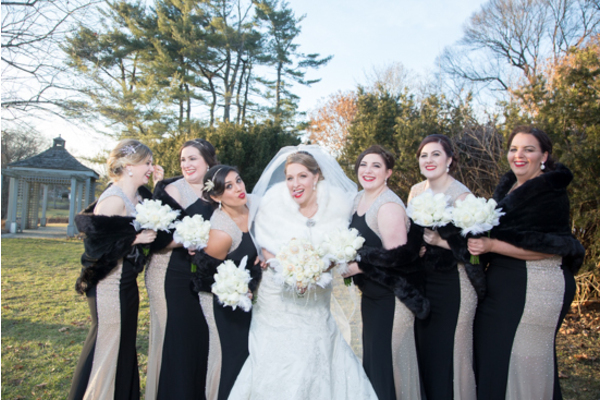 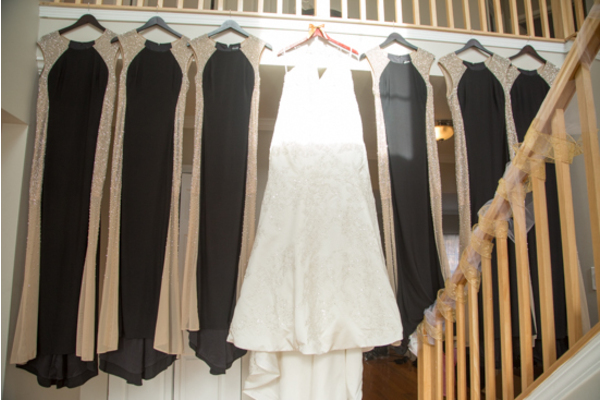 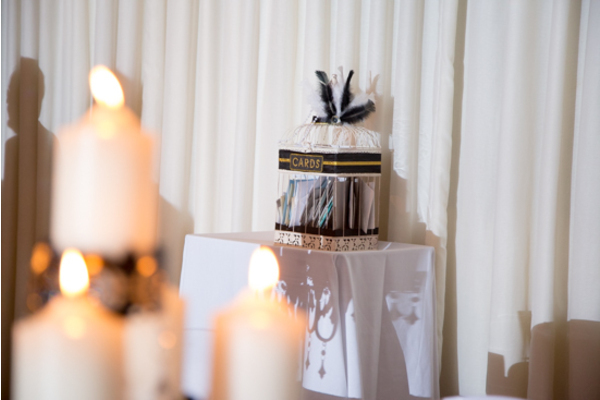 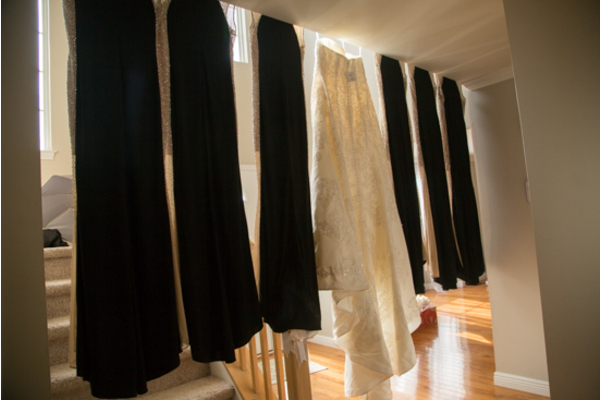 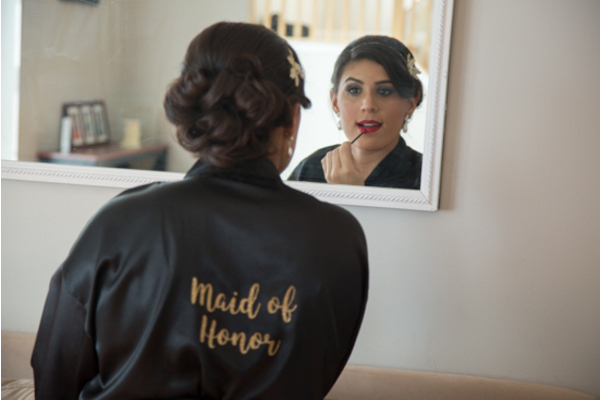 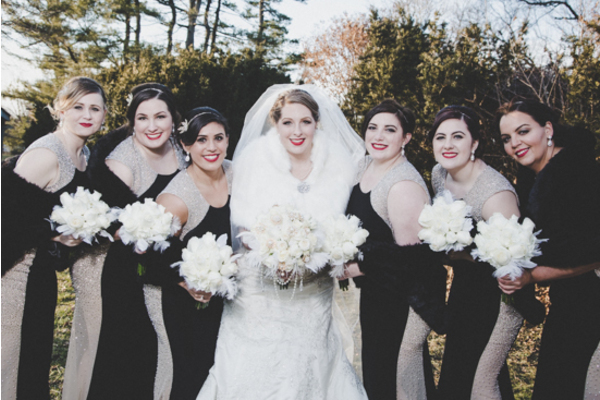 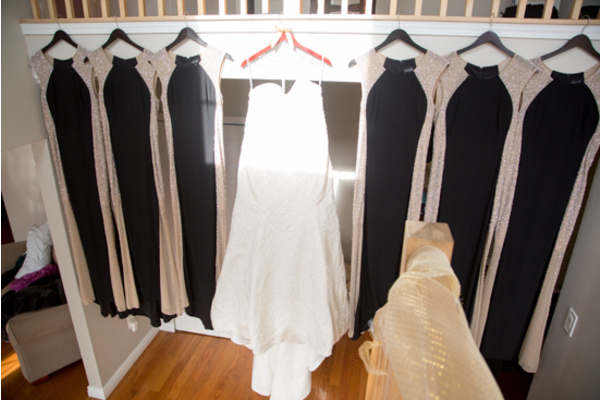 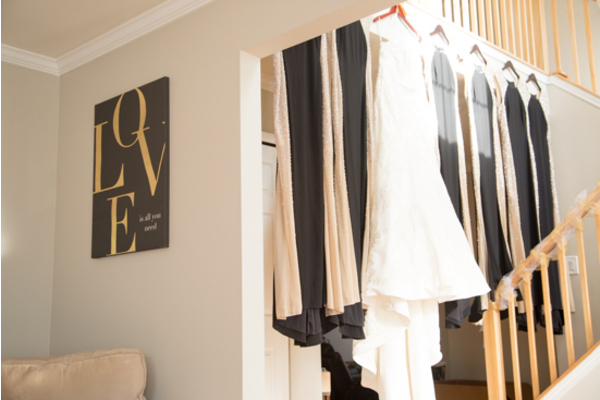 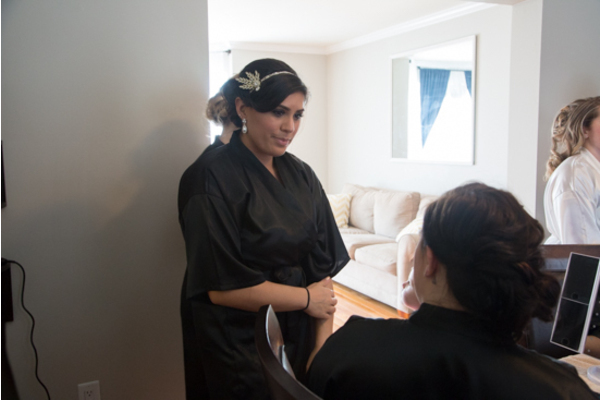 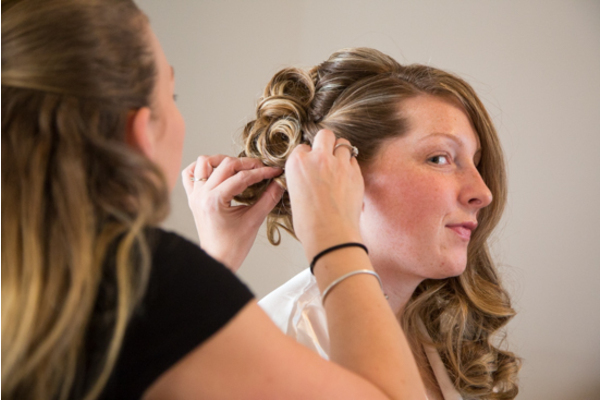 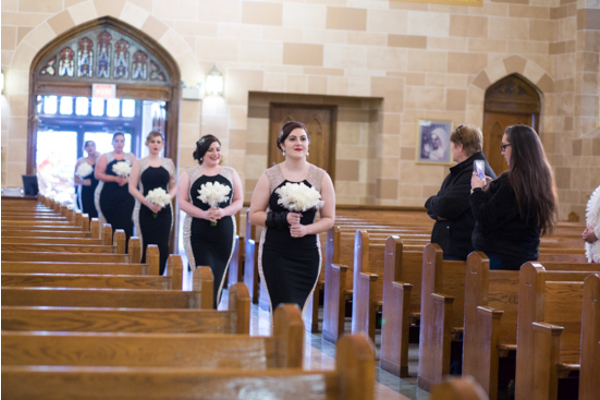 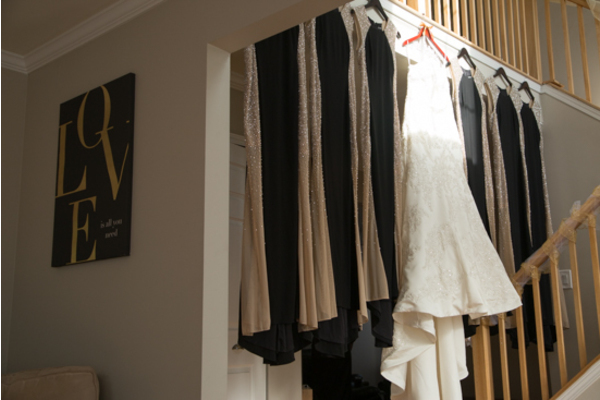 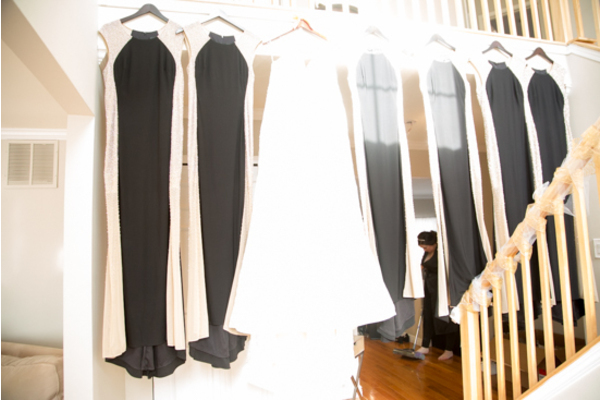 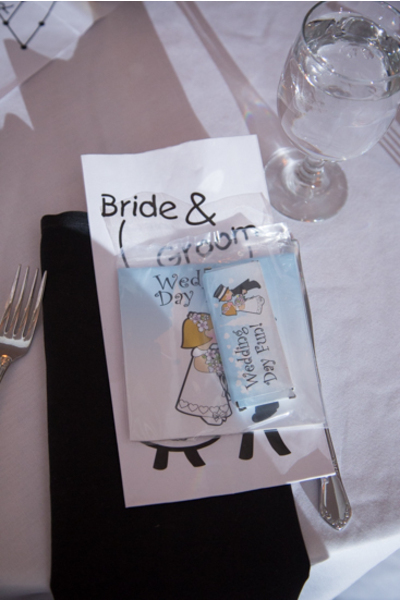 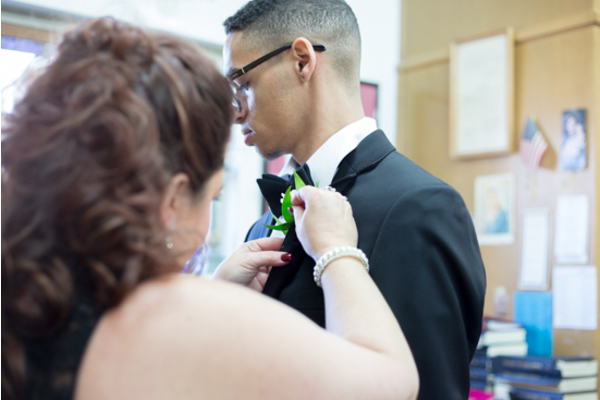 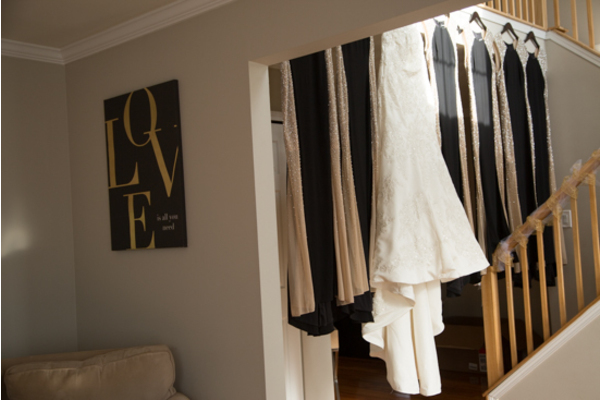 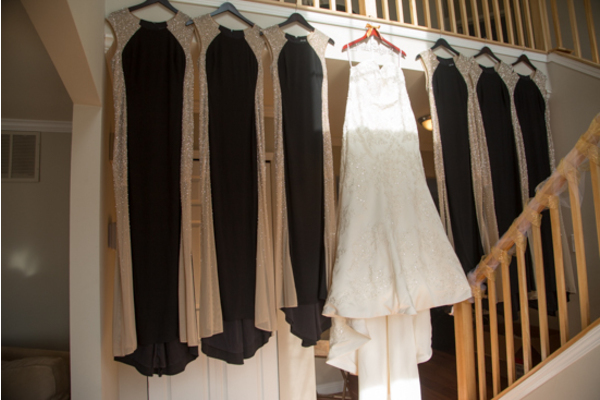 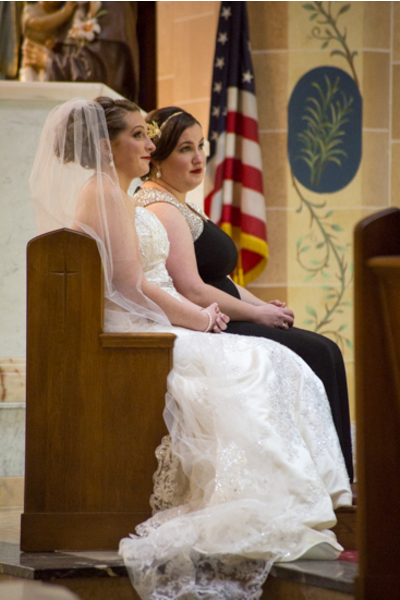 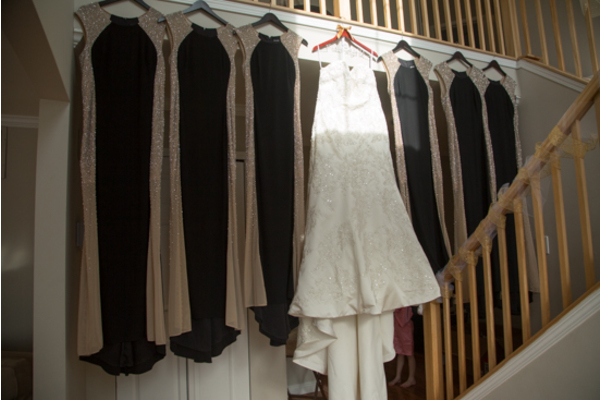 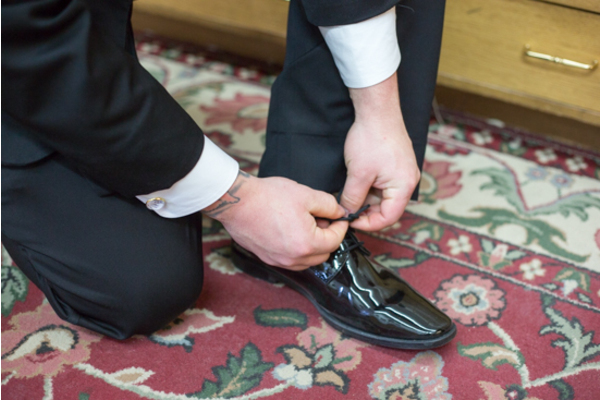 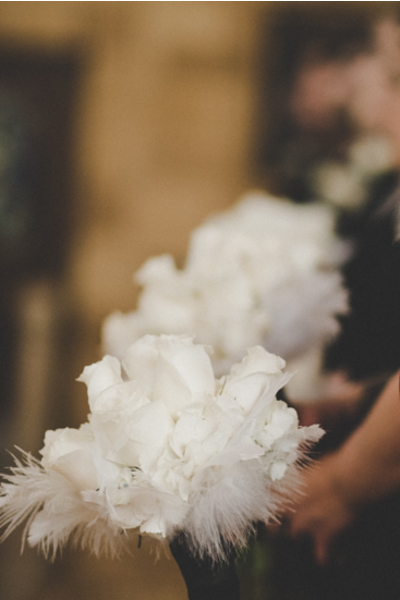 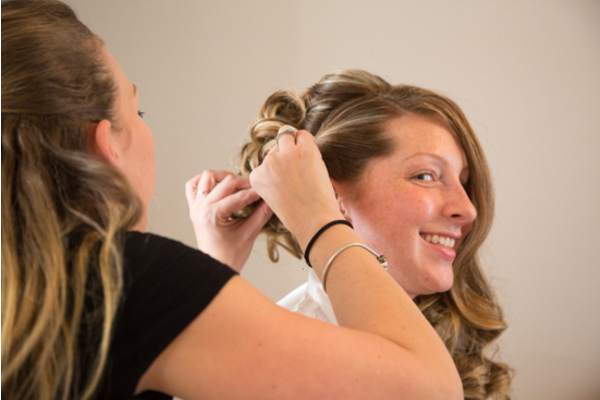 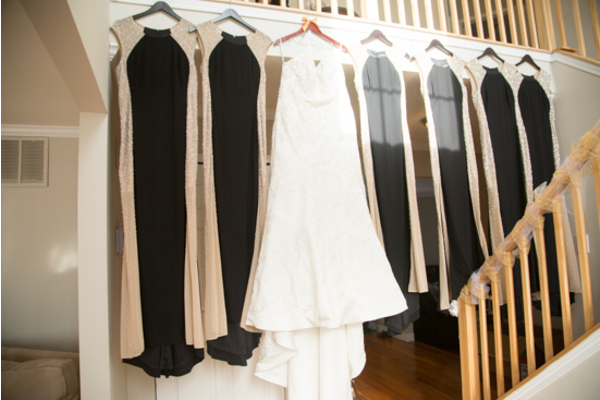 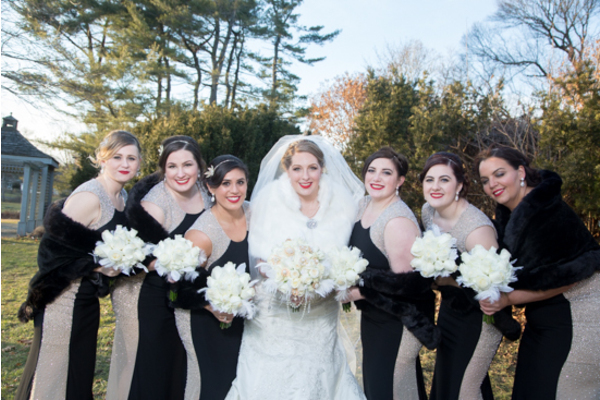 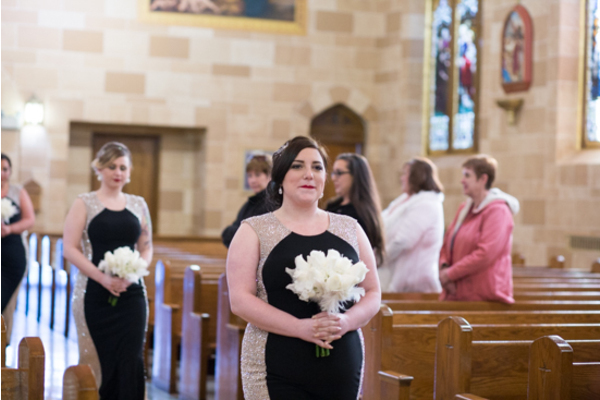 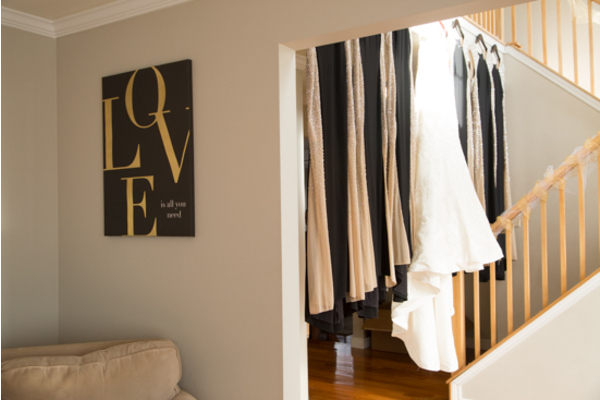 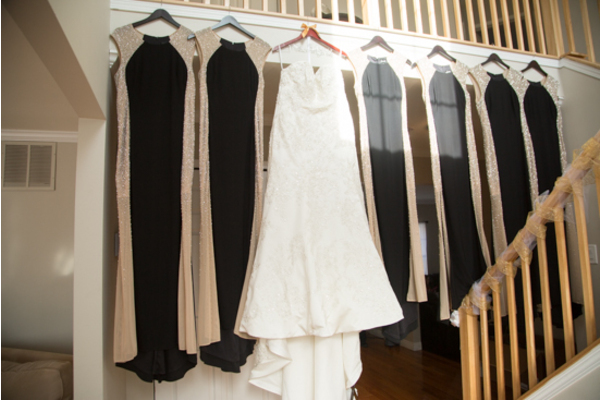 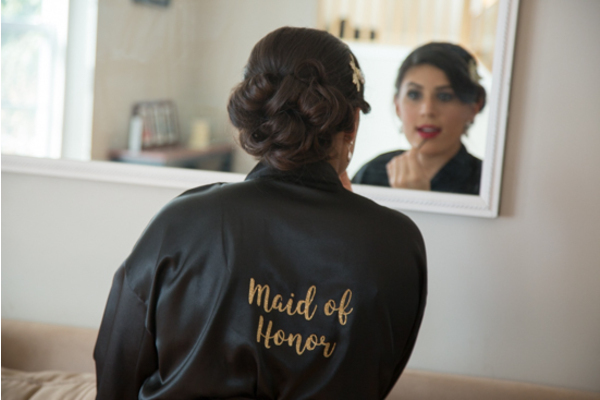 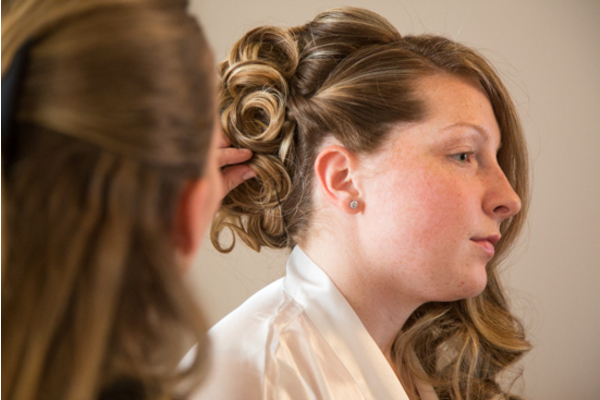 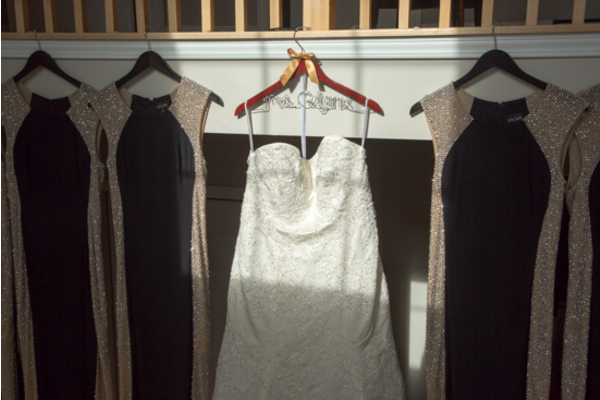 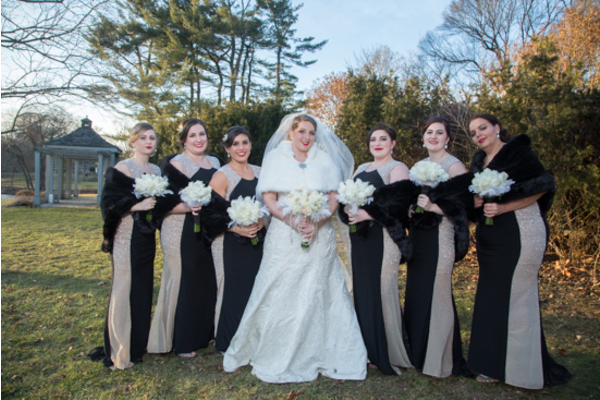 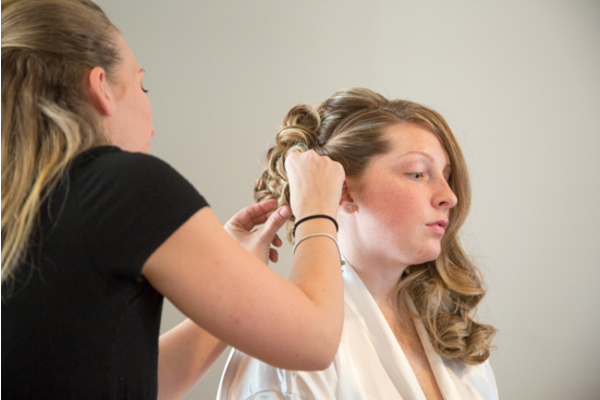 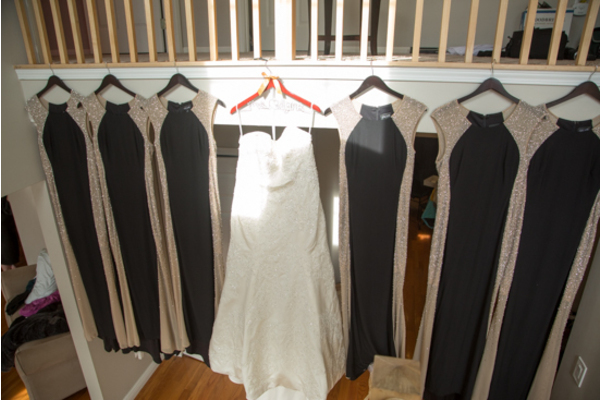 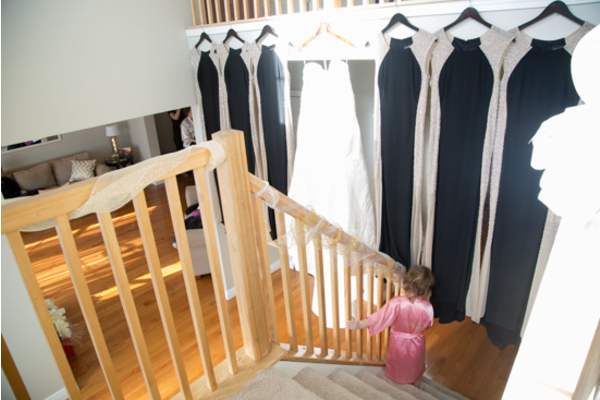 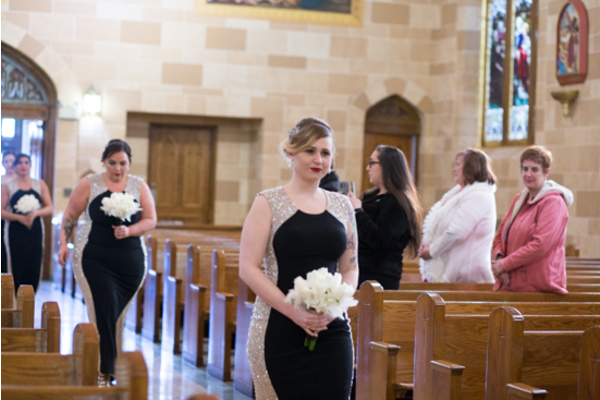 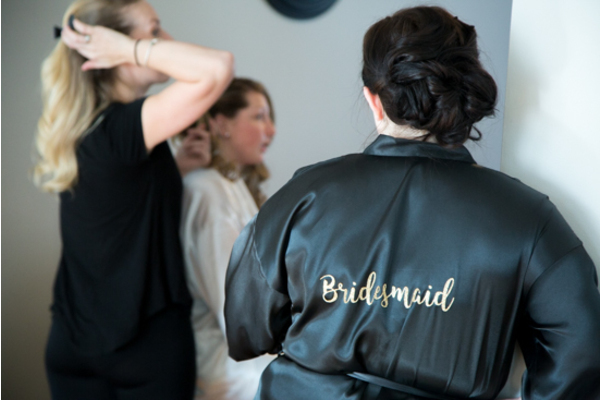 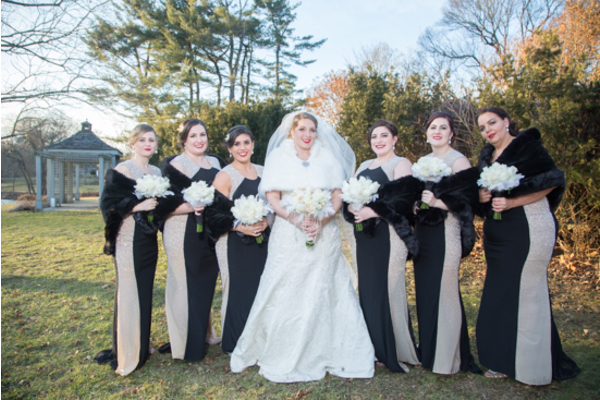 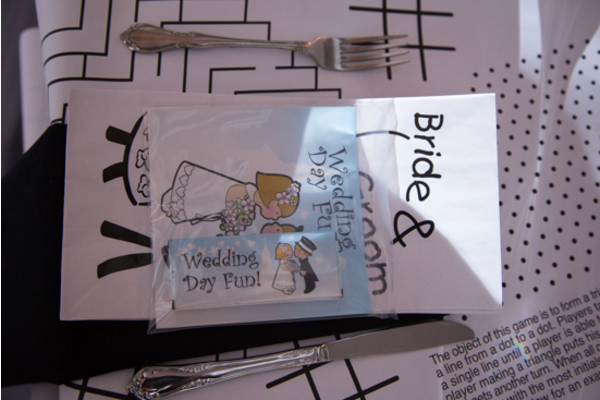 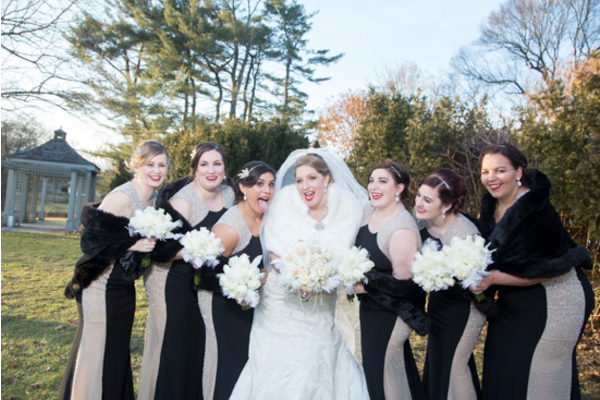 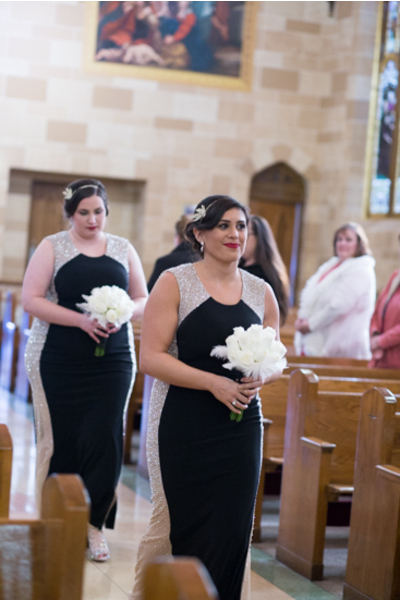 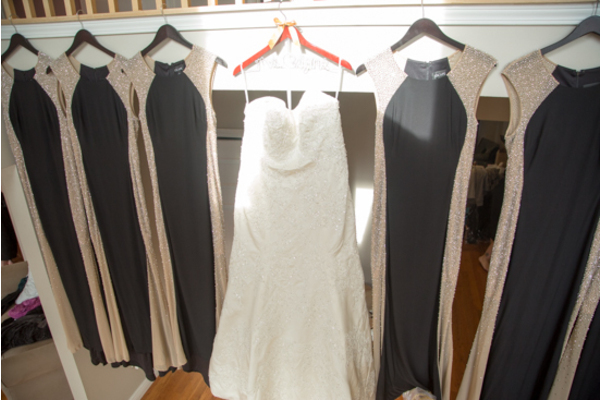 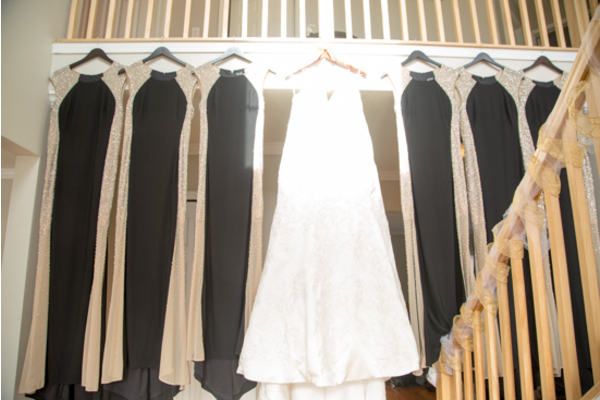 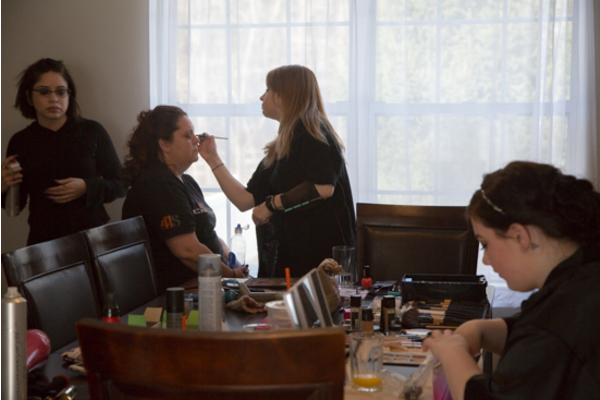 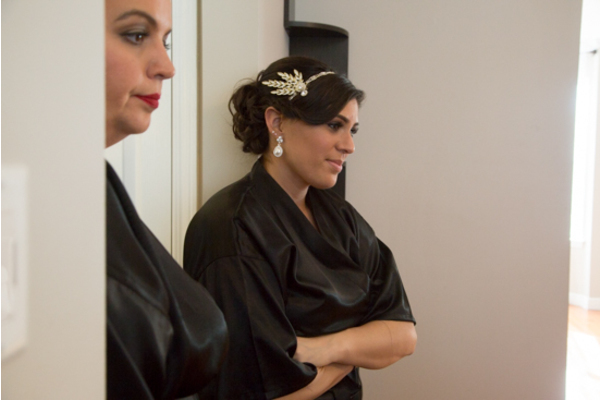 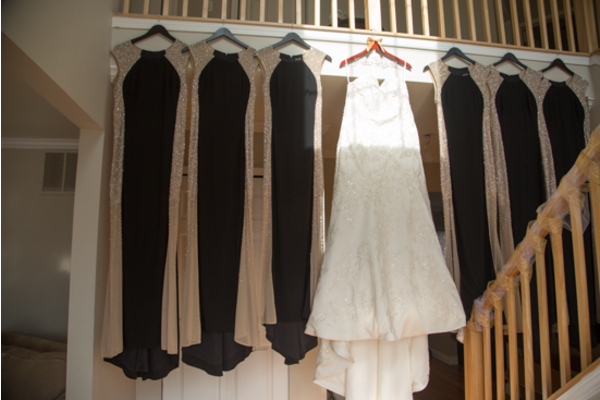 The bridesmaids dressed in black silk robes were ready to get this bride all dolled up! 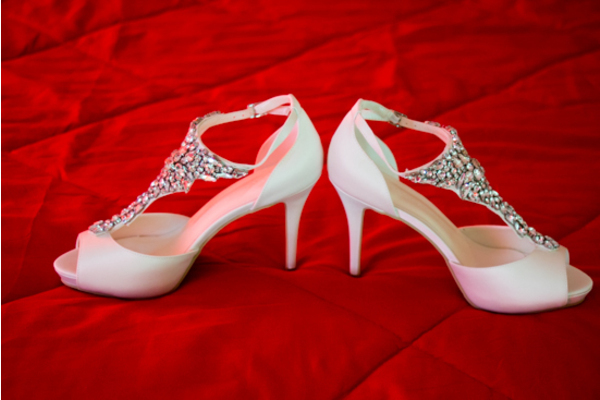 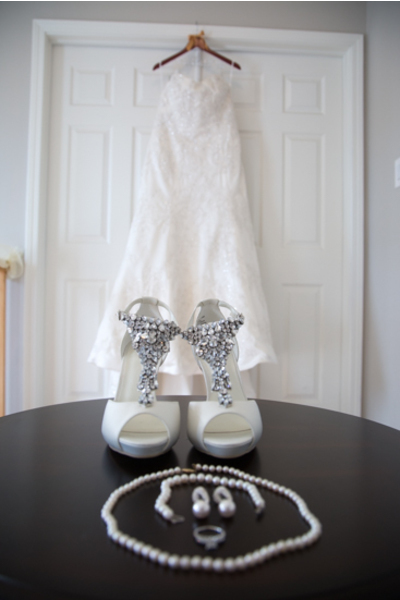 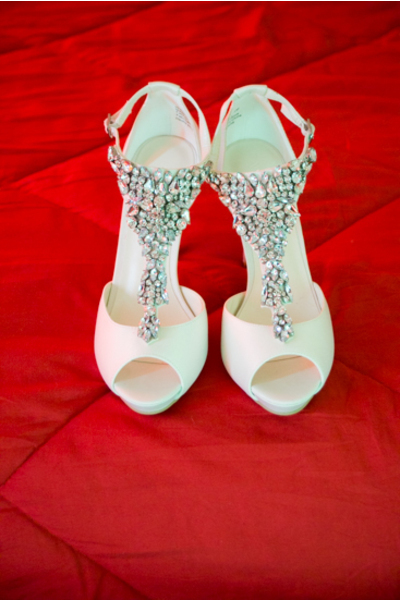 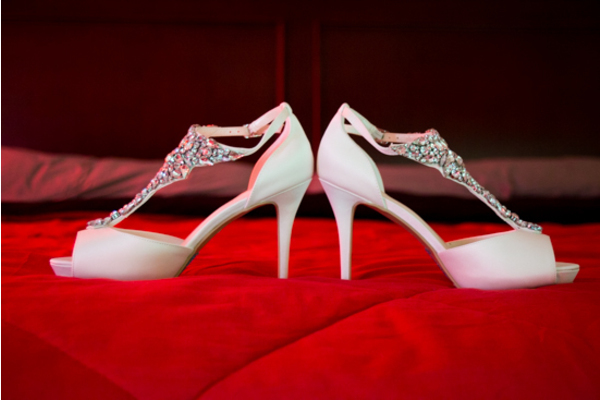 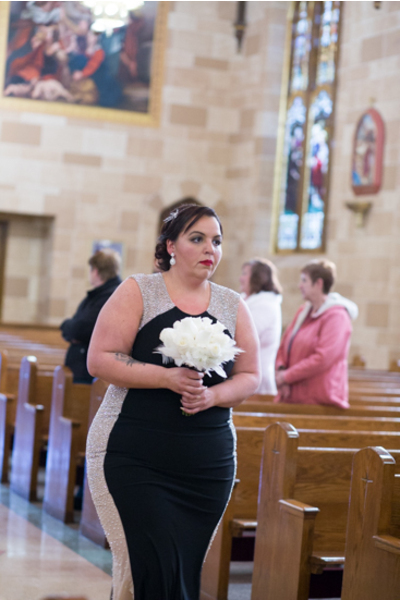 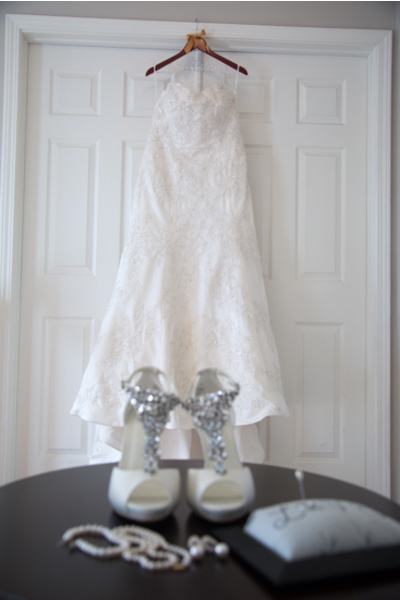 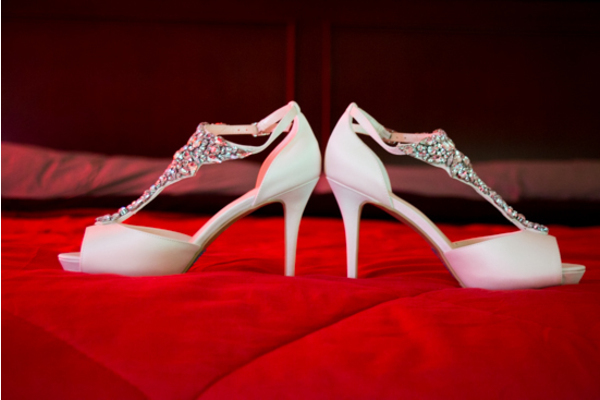 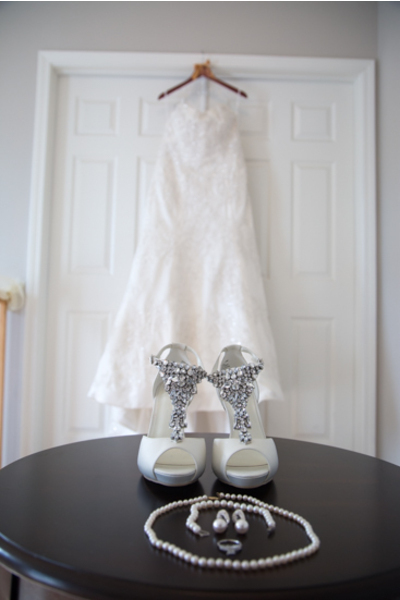 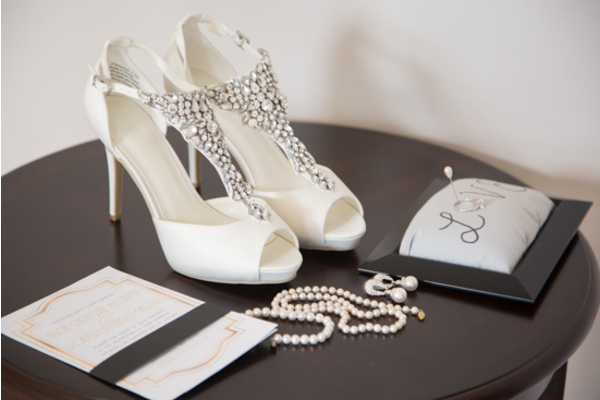 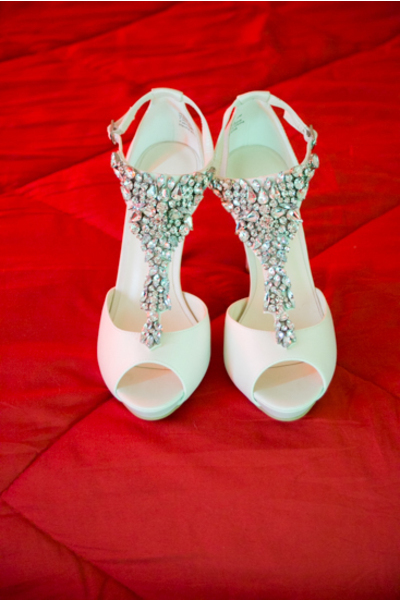 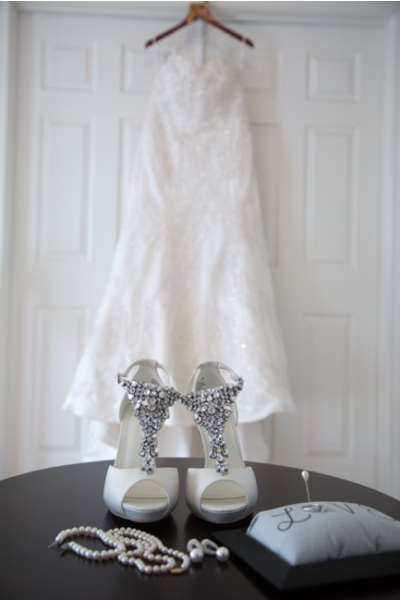 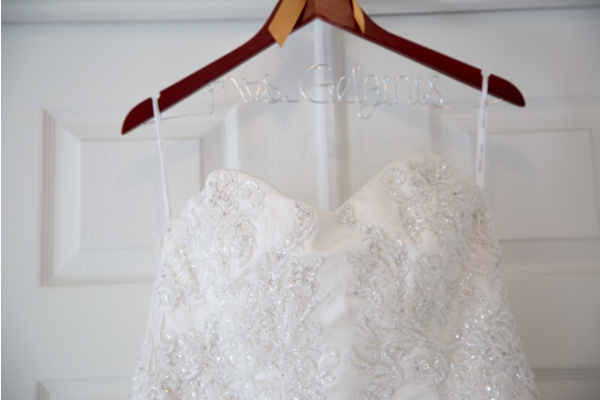 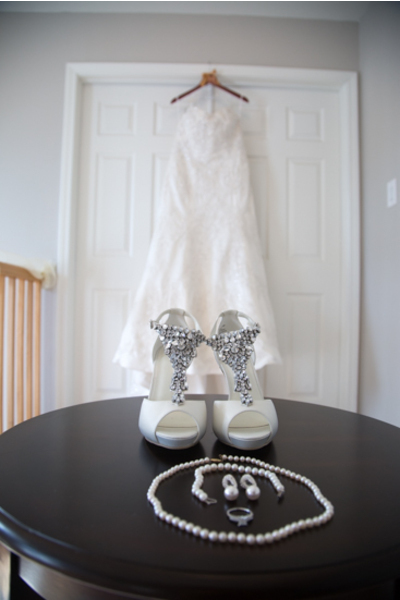 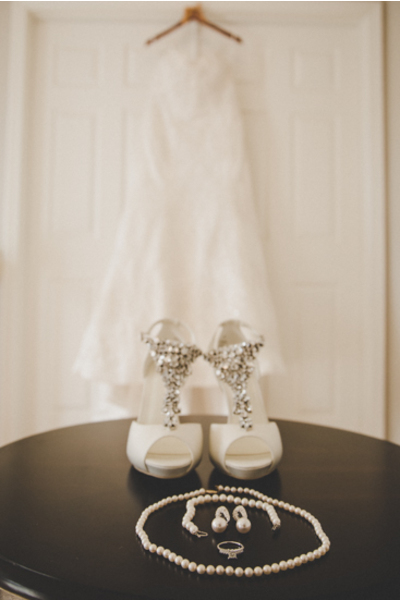 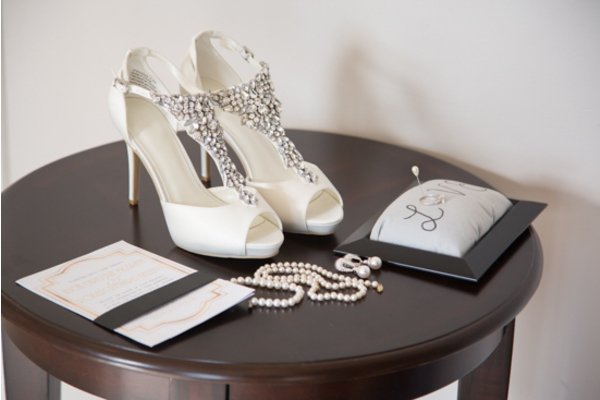 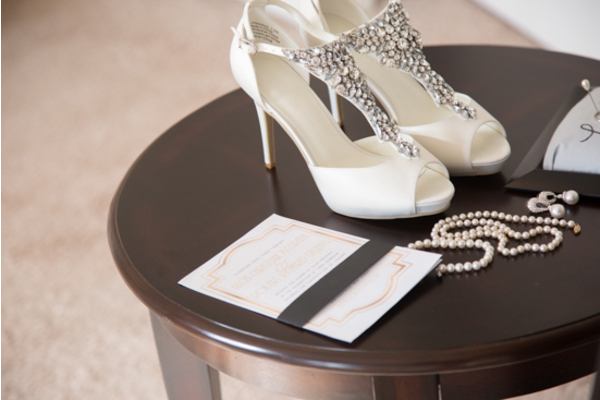 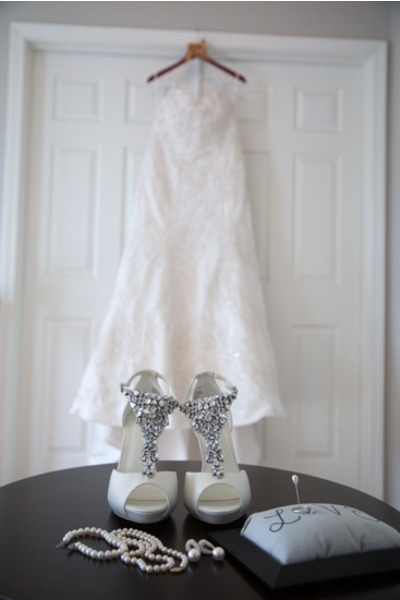 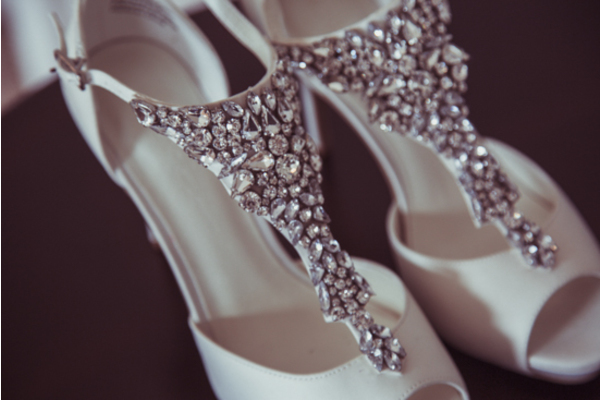 Alicia’s elegant sweetheart neckline gown and her silver sparkle heels made her light up the room. 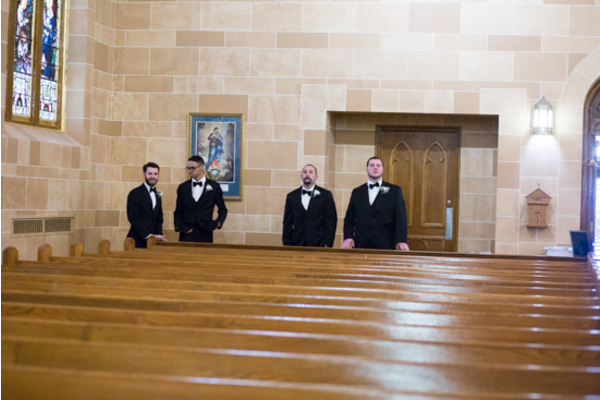 In a room nearby, Rob is looking his best awaiting to finally see his bride-to-be. 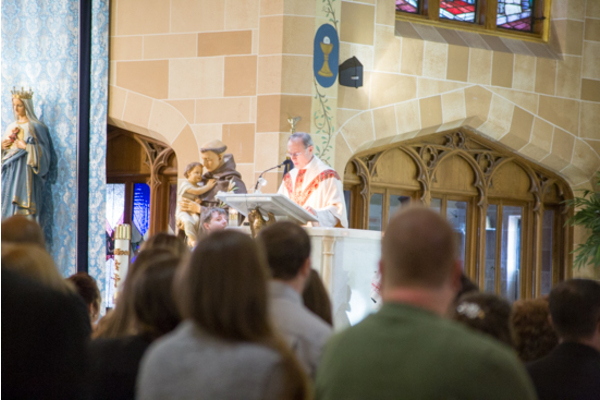 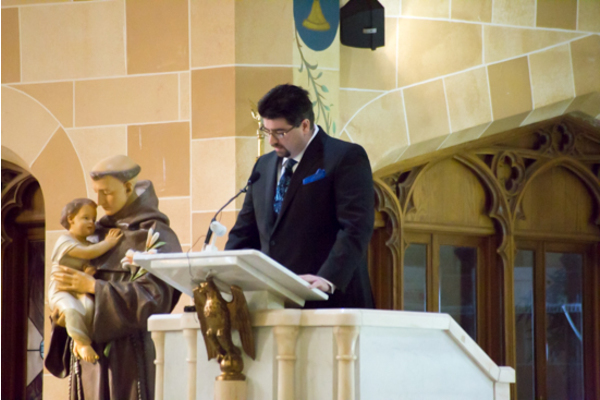 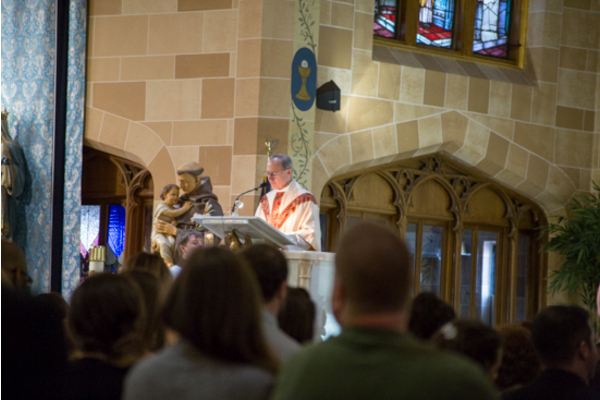 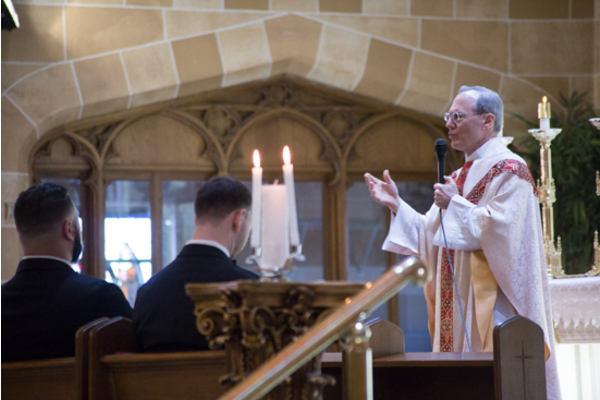 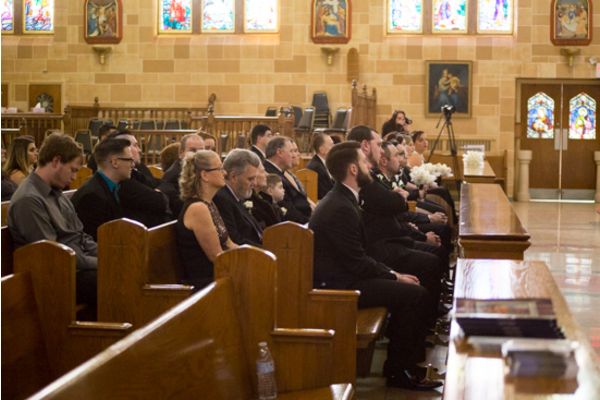 It was time for the ceremony to begin! 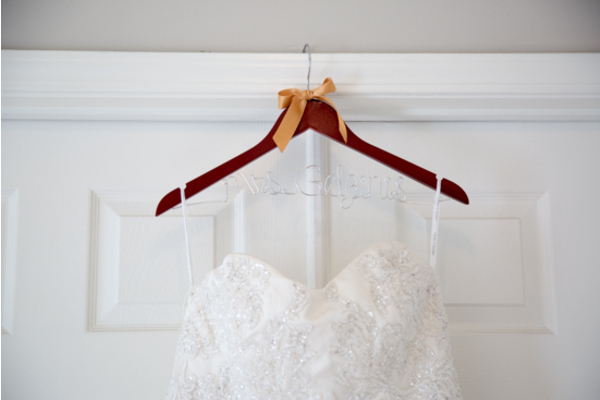 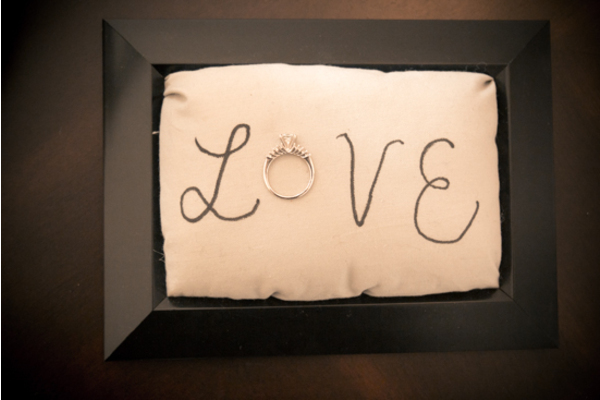 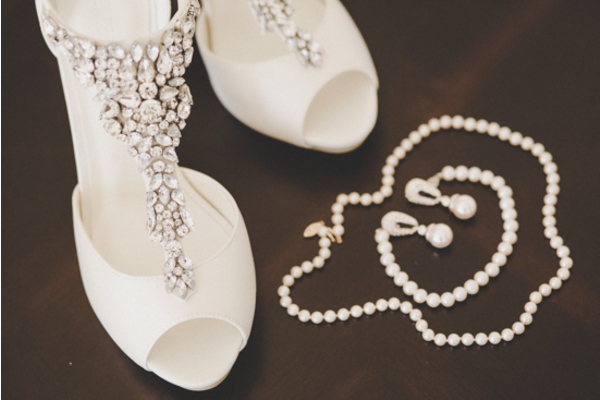 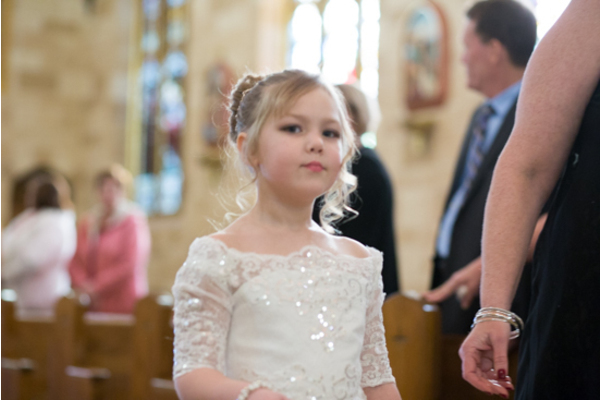 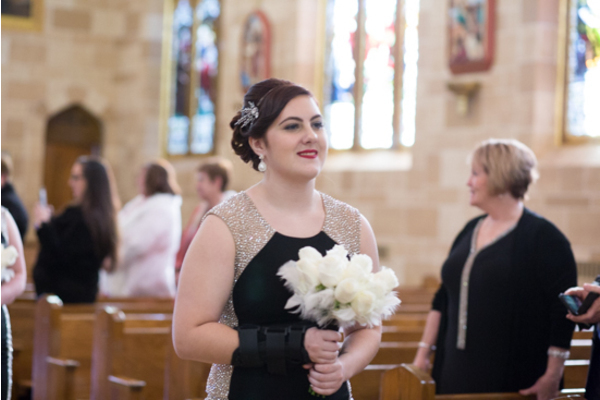 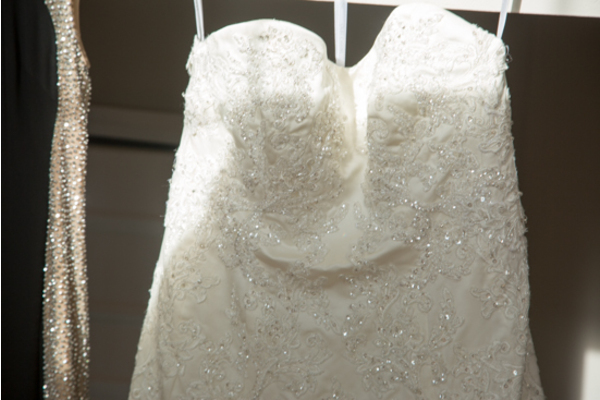 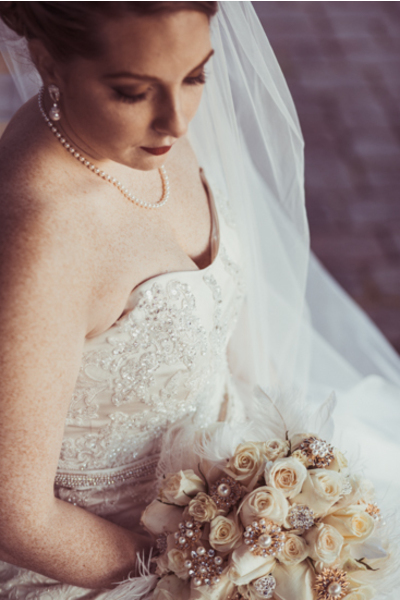 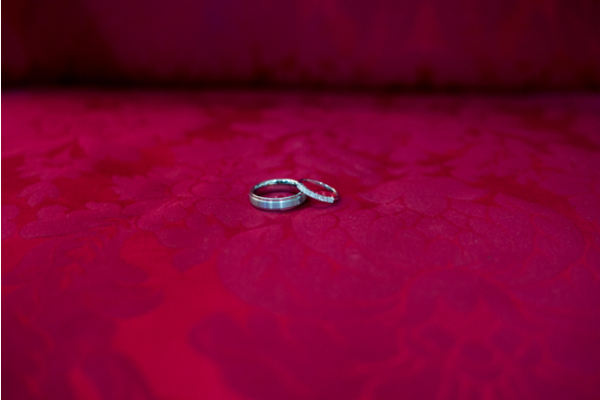 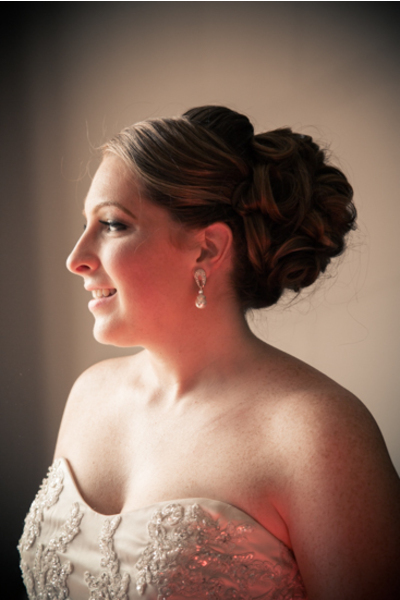 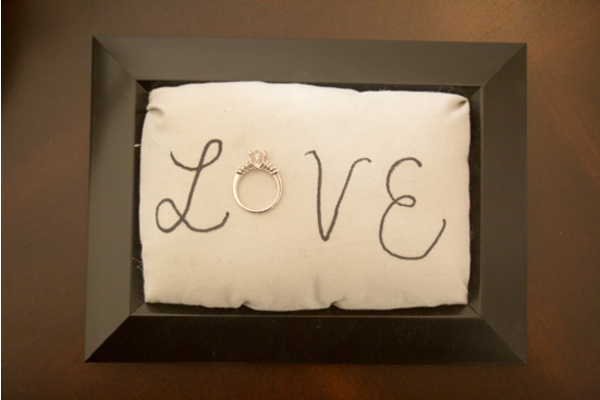 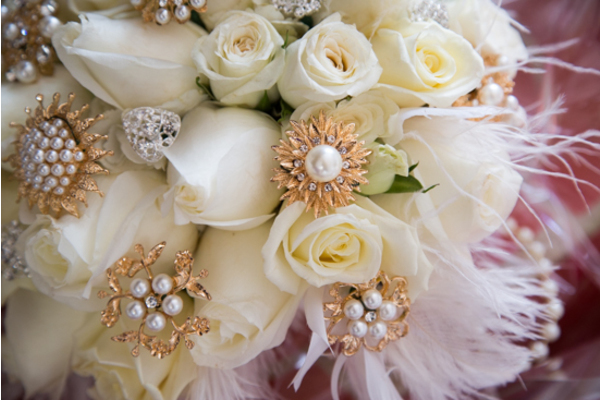 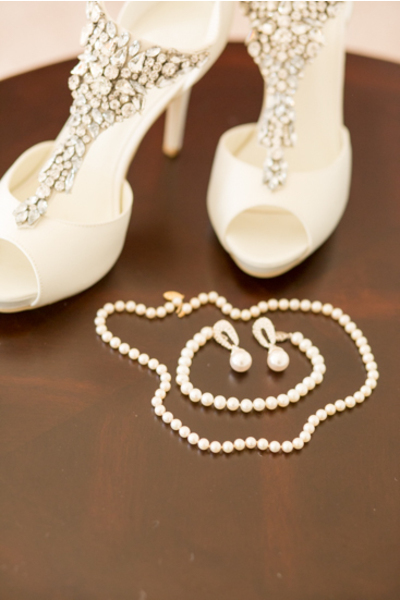 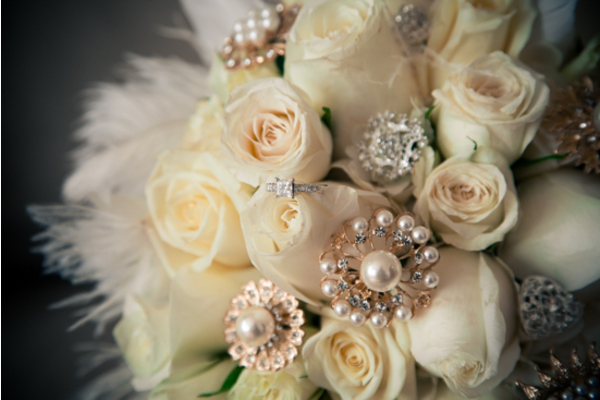 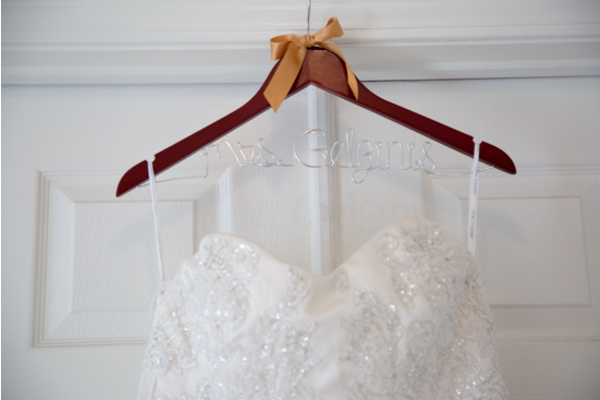 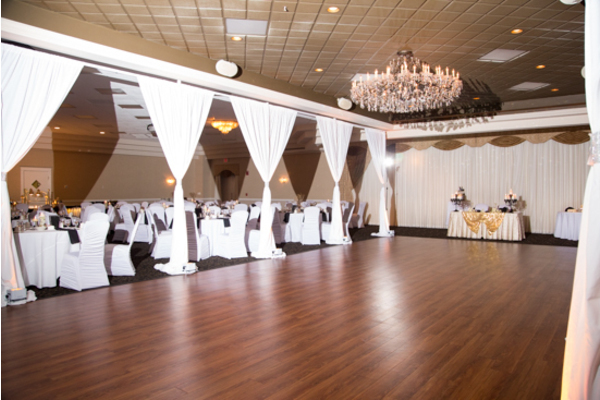 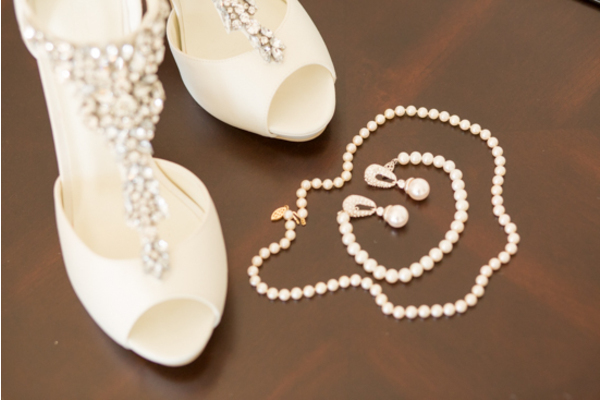 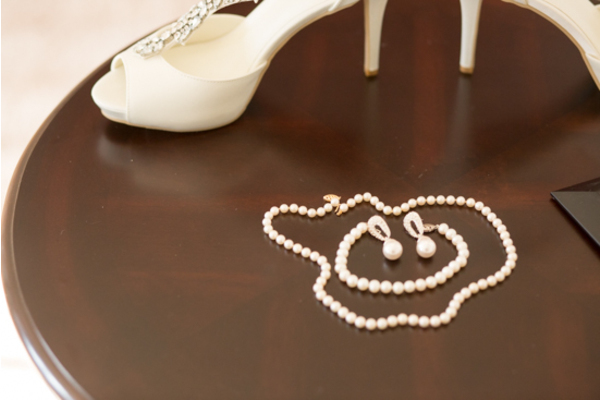 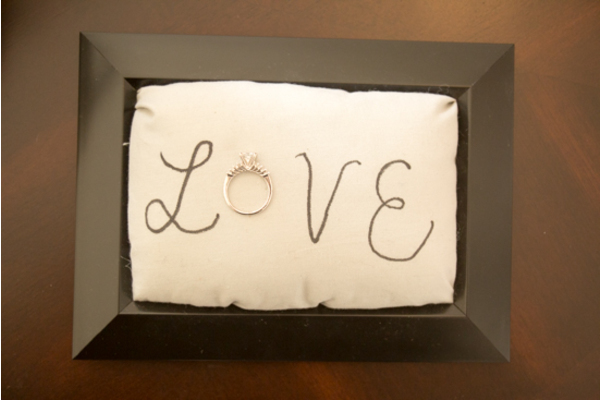 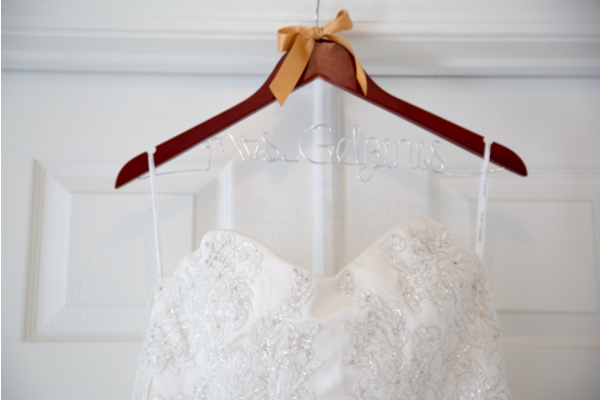 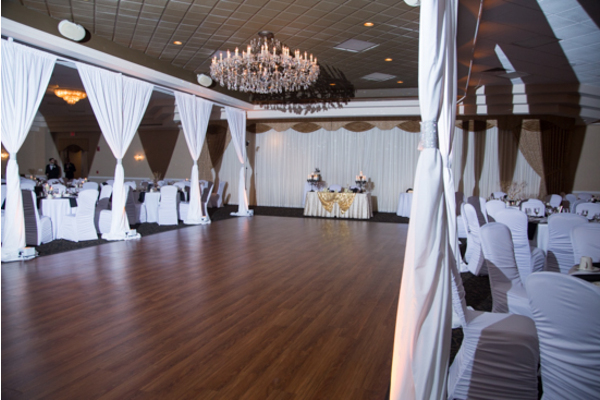 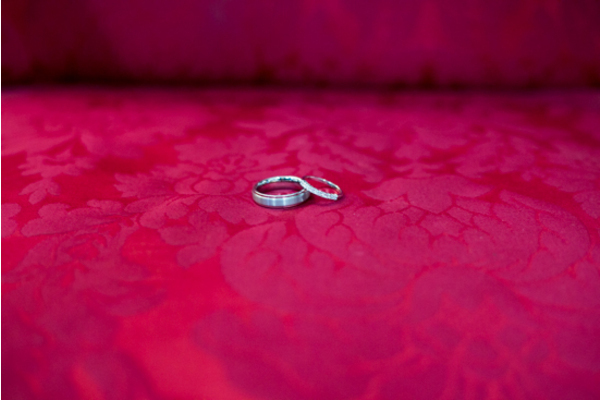 Alicia walked down the aisle gracefully and with a shining smile on her face as she locked eyes with her groom. 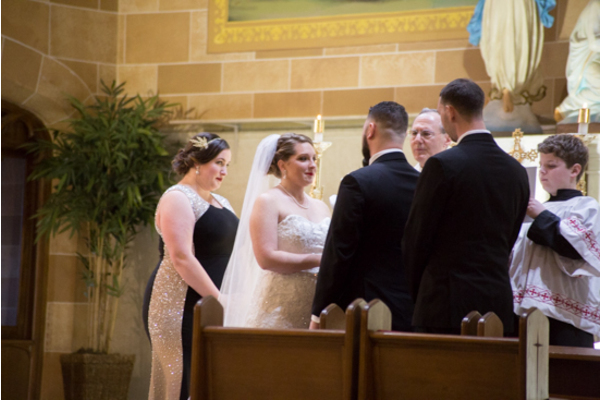 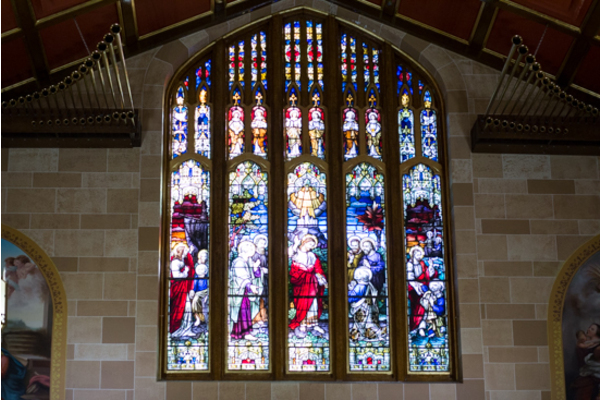 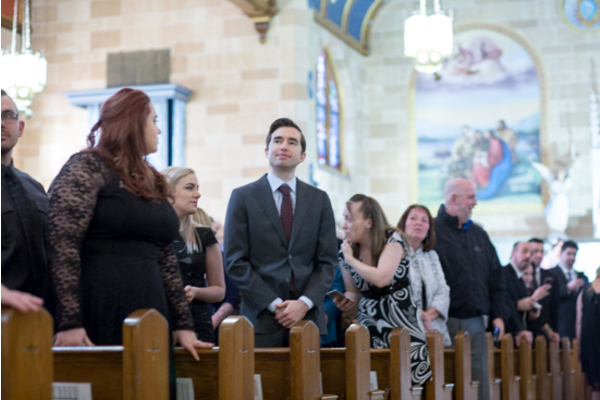 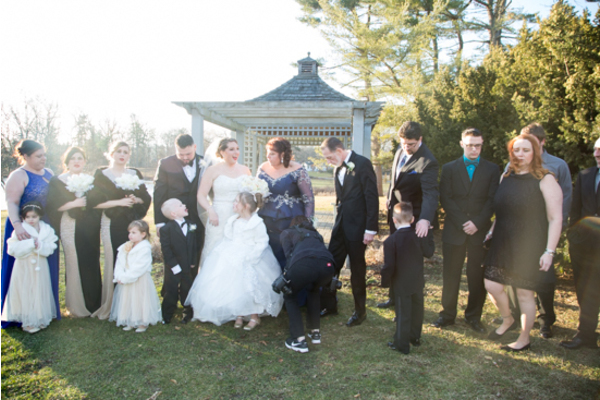 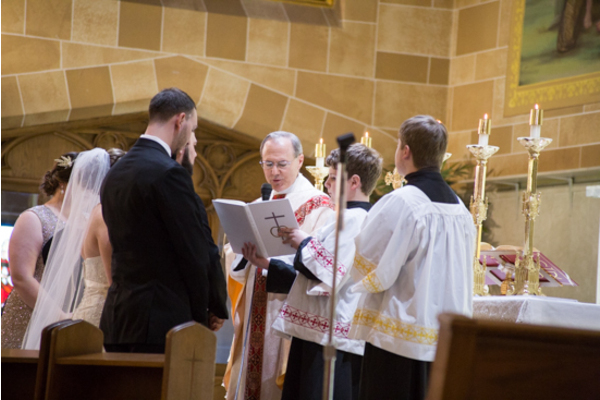 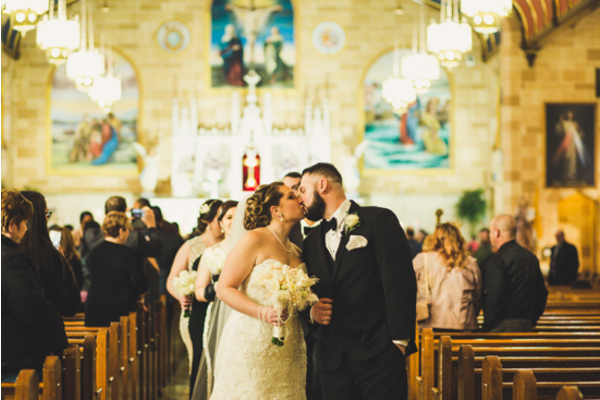 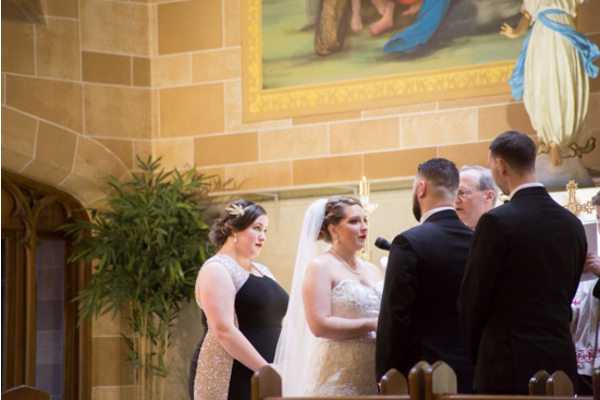 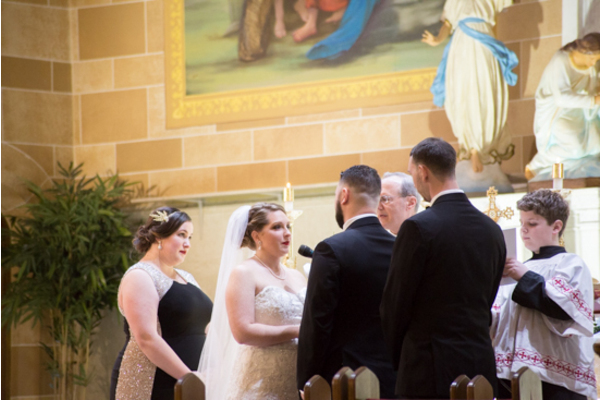 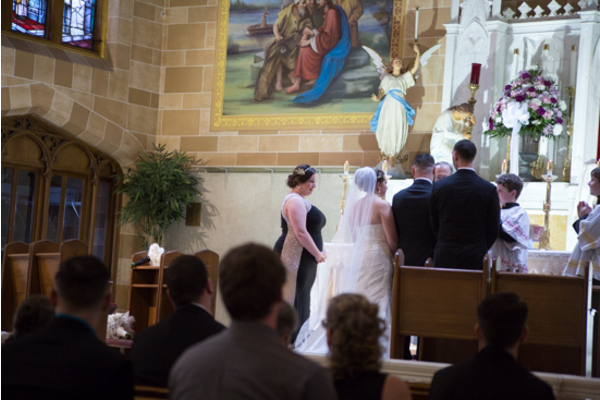 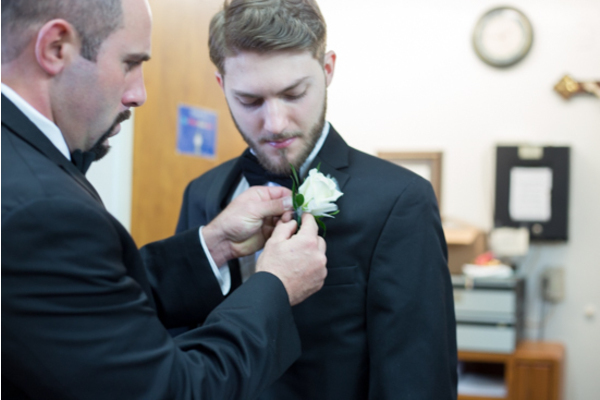 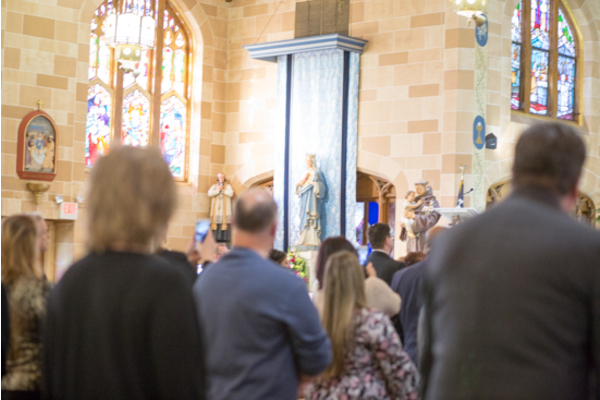 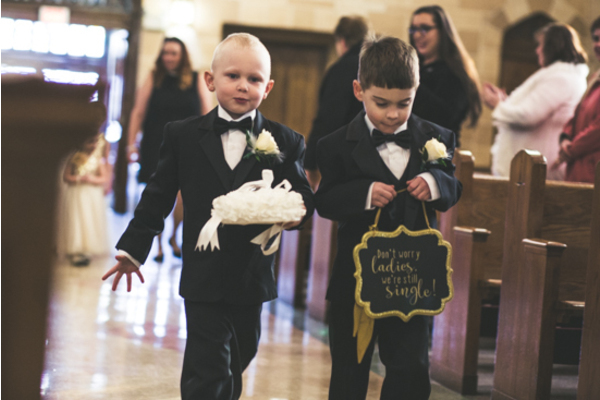 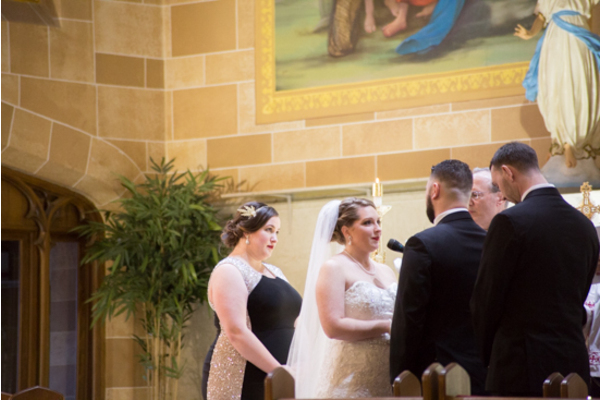 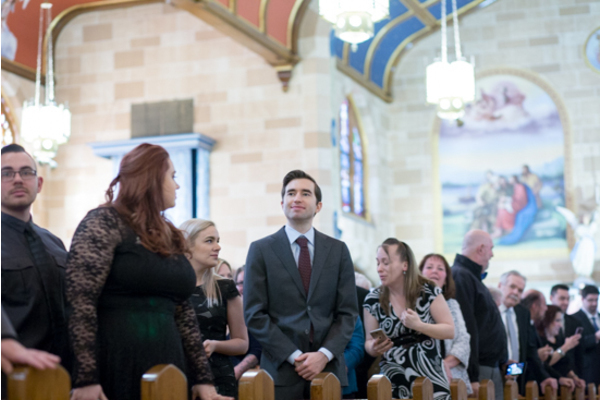 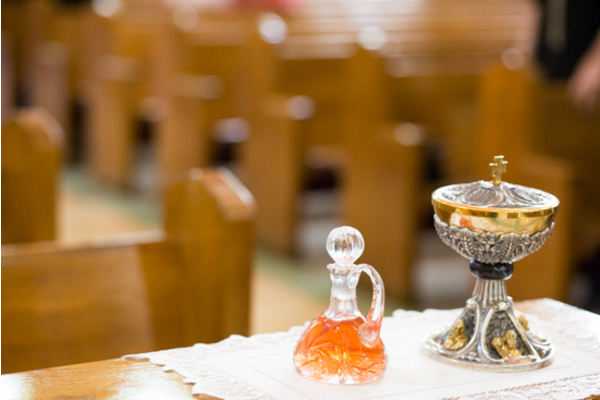 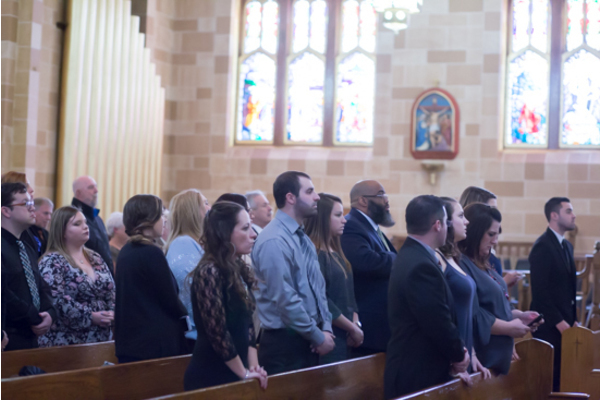 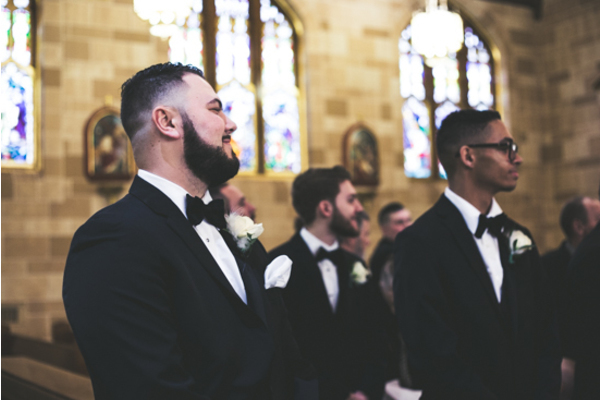 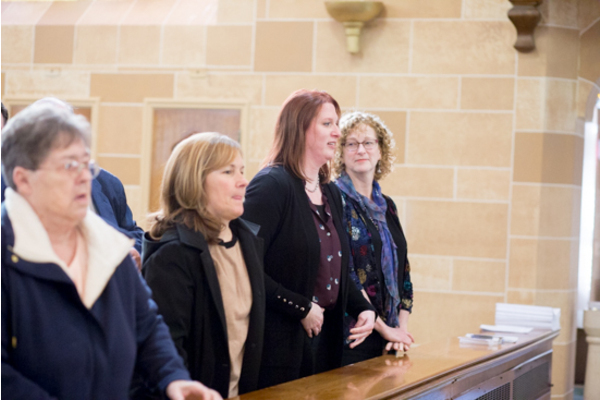 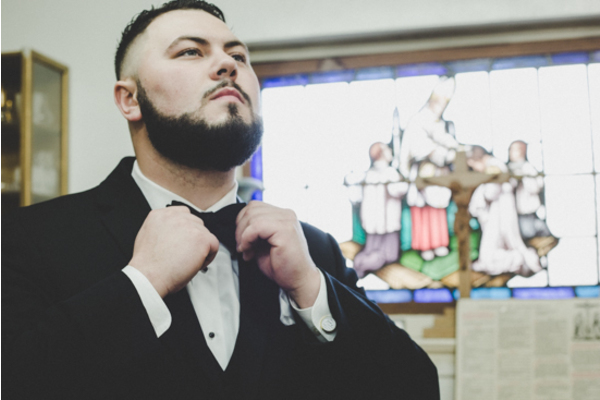 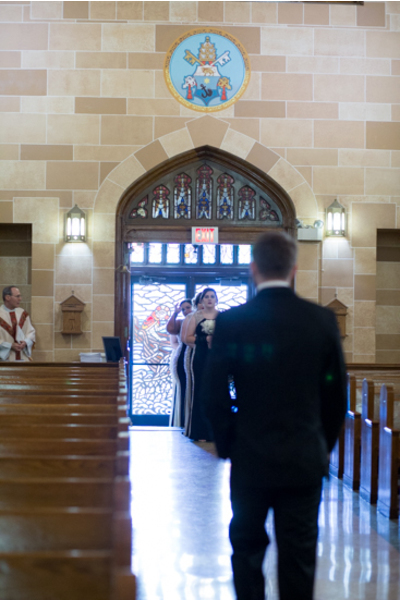 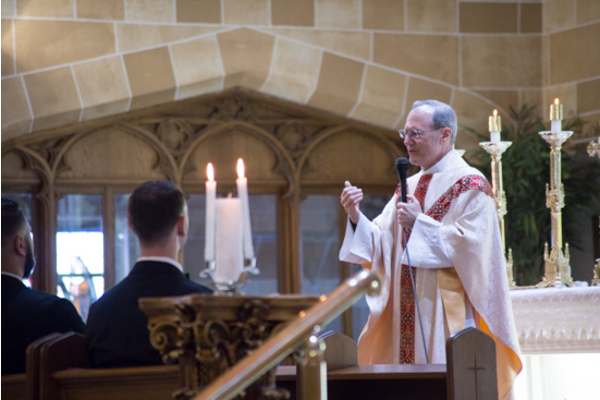 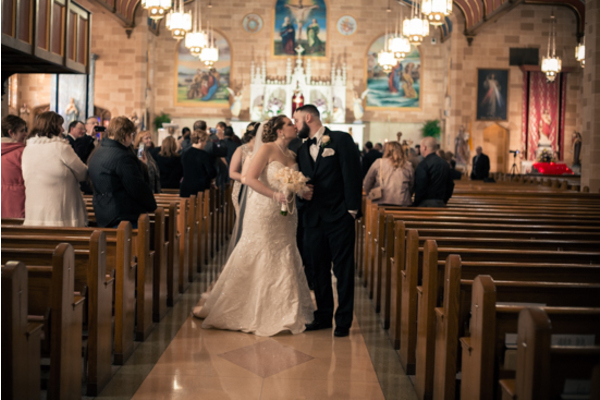 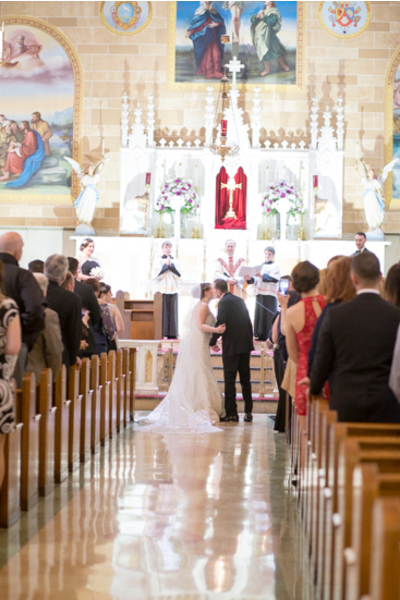 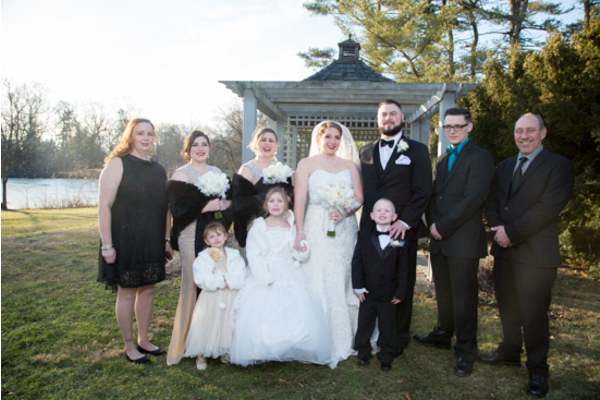 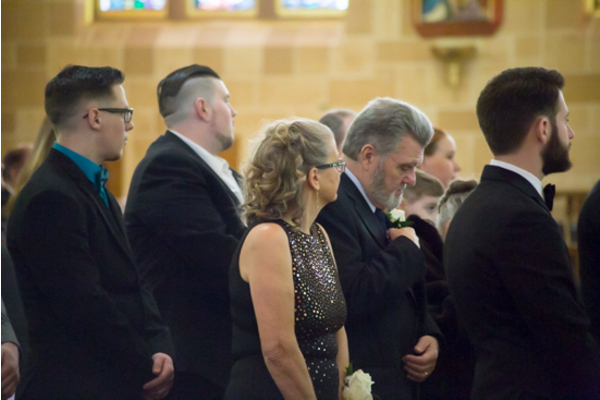 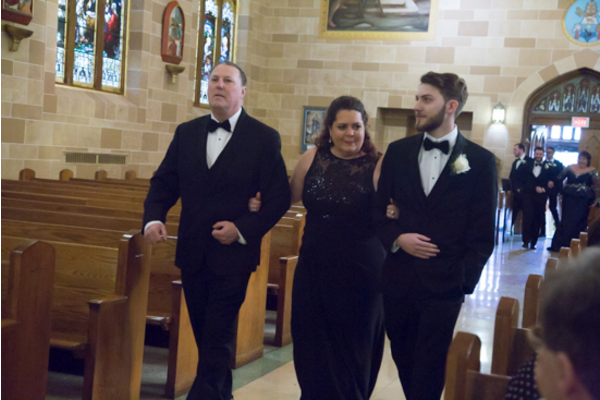 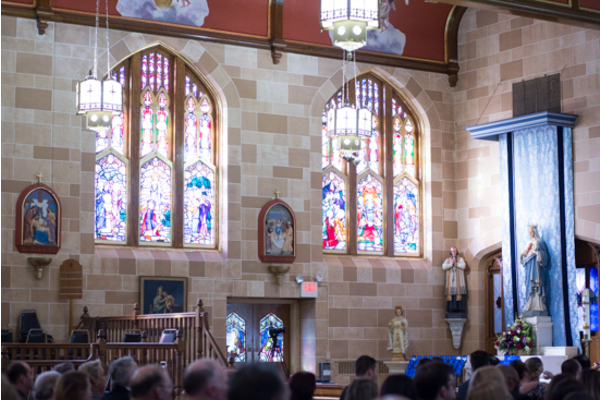 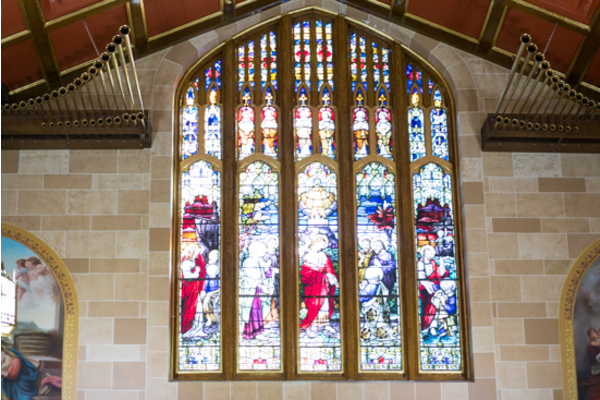 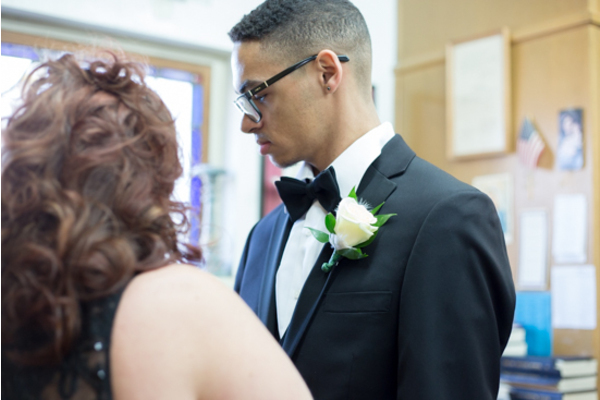 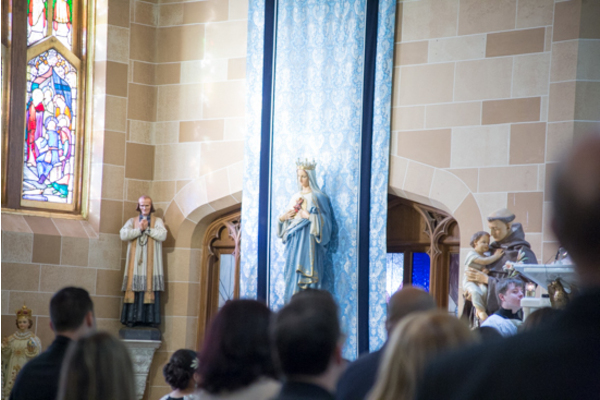 The guests gathered in a church to see the bride and groom say their “I Do’s.” The lovely couple walked down the aisle for the first time as Mr. and Mrs. and shared a kiss! 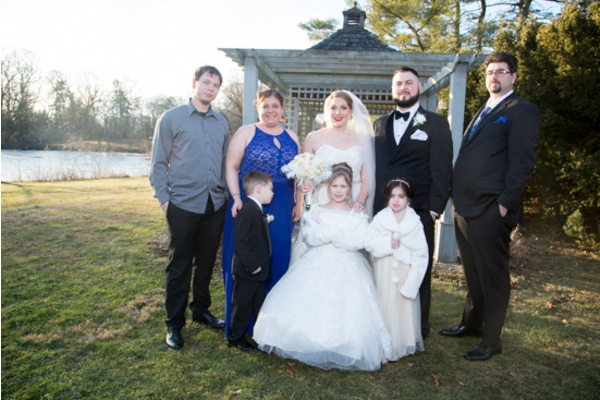 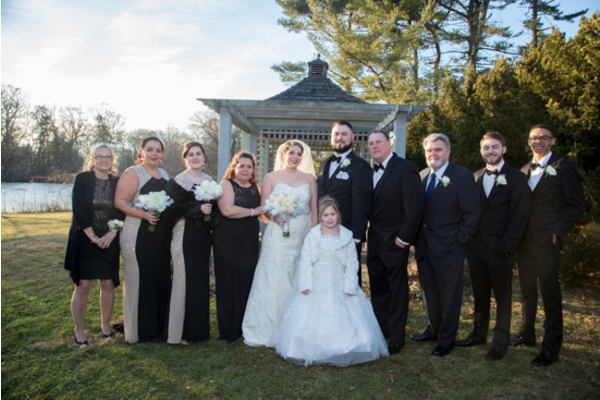 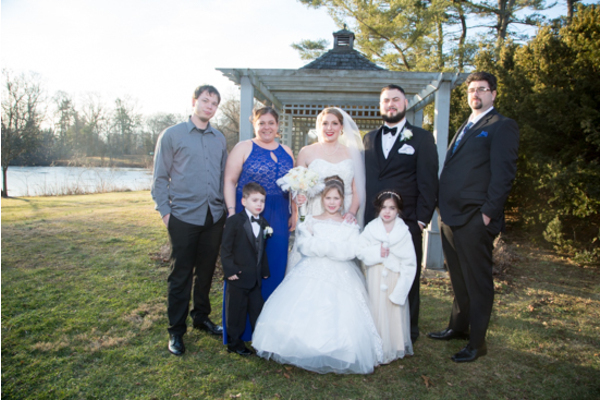 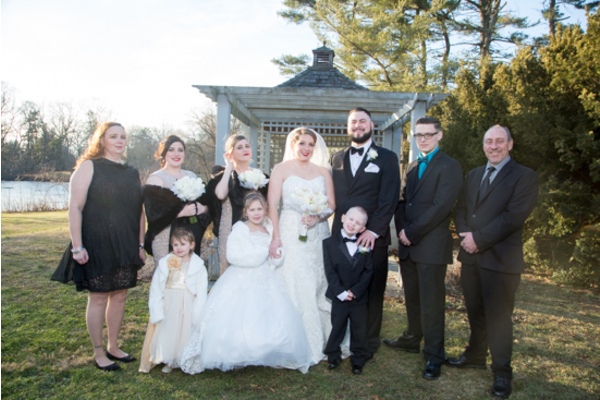 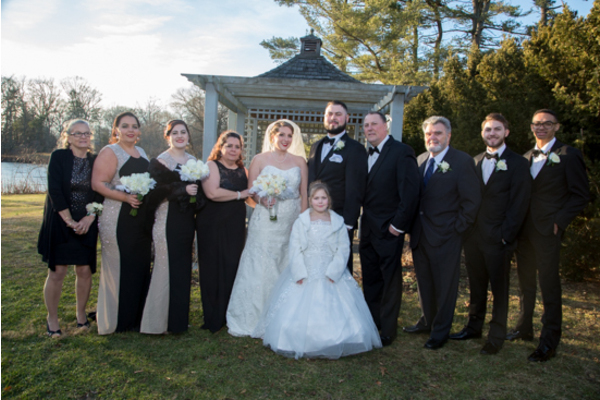 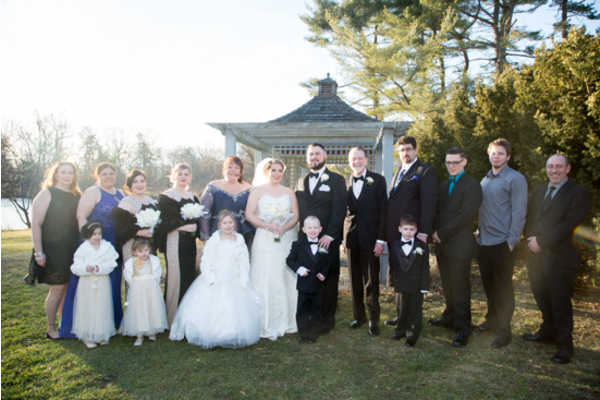 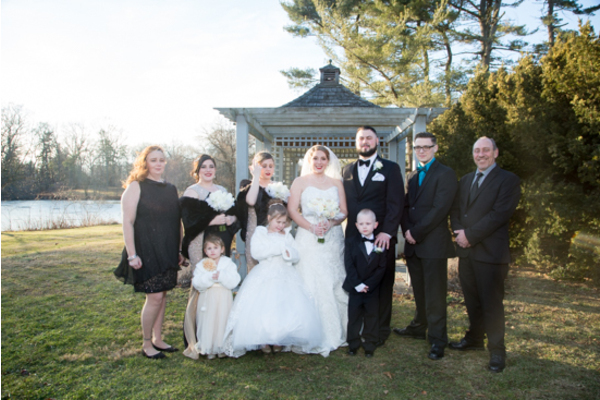 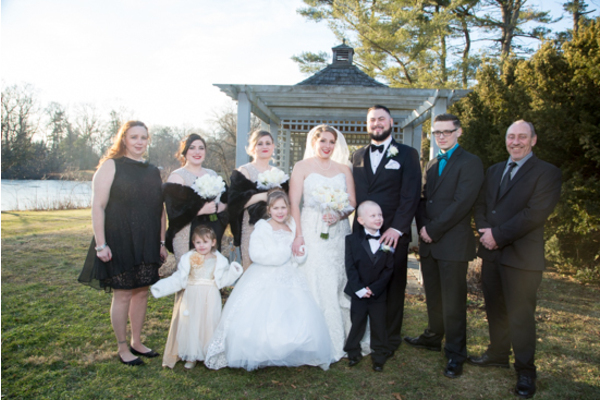 After the ceremony, guests could not wait to pose for pictures with Alicia and Rob for an outdoor photography session at Strawbridge Lake! 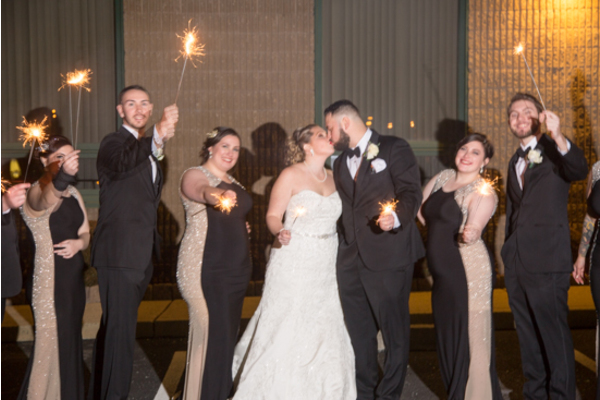 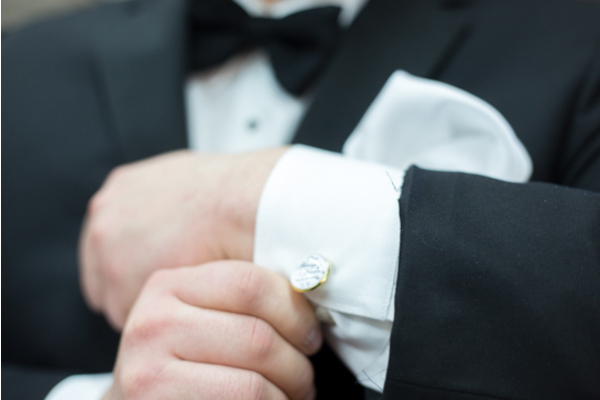 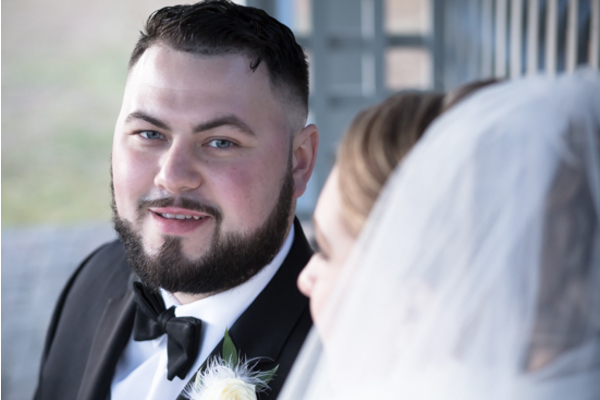 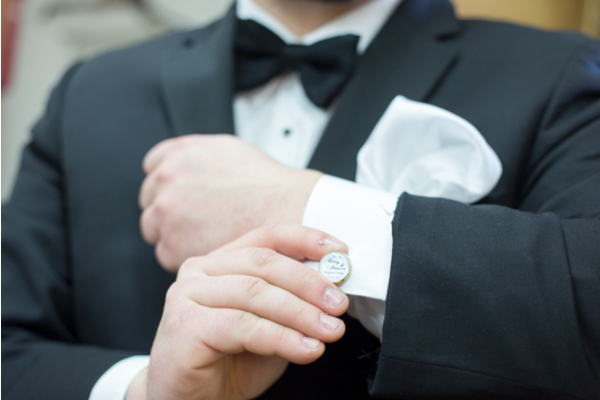 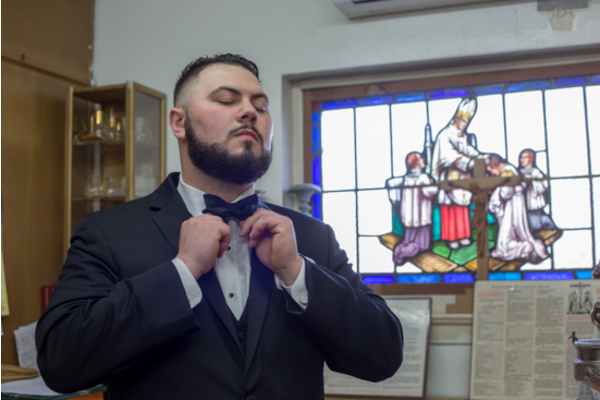 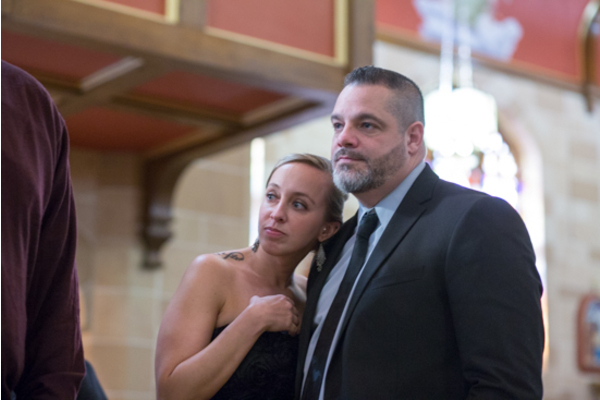 Our two NJ Wedding Photographers made sure to capture every candid, romantic moment and detail shot that the couple showed off that day. 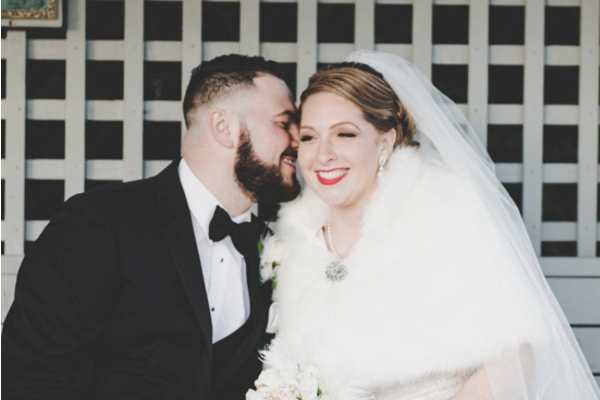 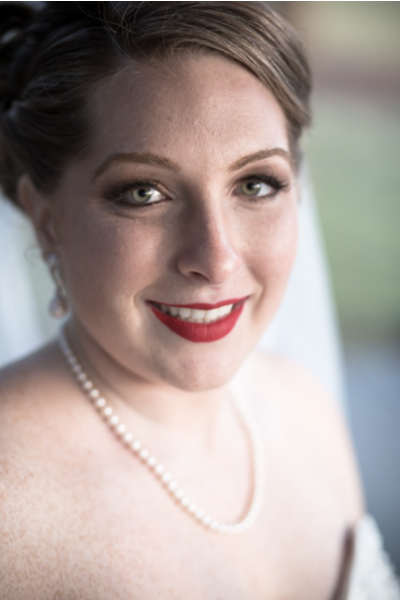 Alicia’s cherry red lipstick stood out in every picture with her lovely husband as her wedding veil danced in the cool air. 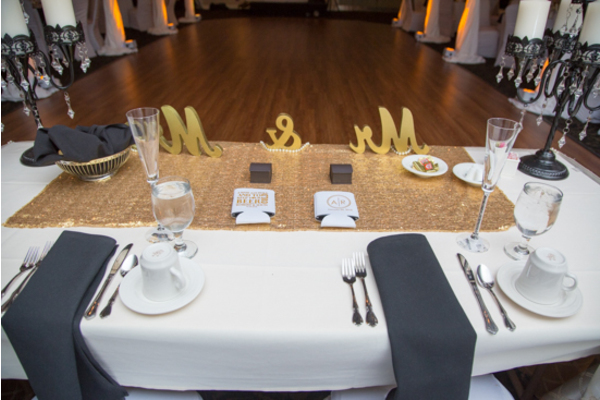 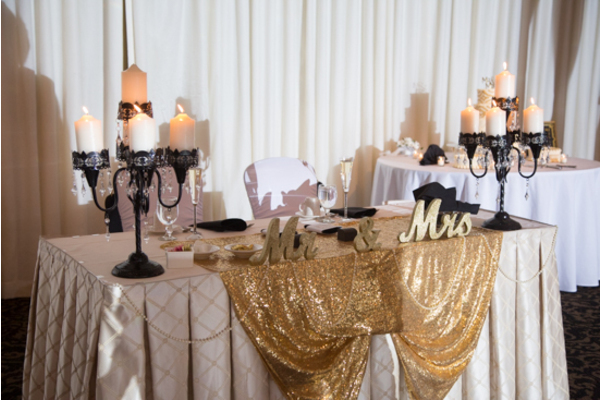 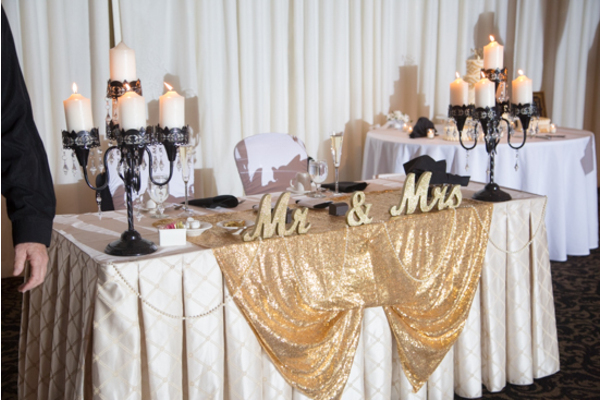 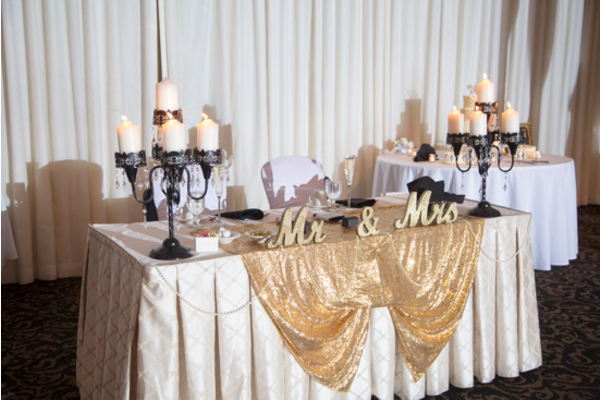 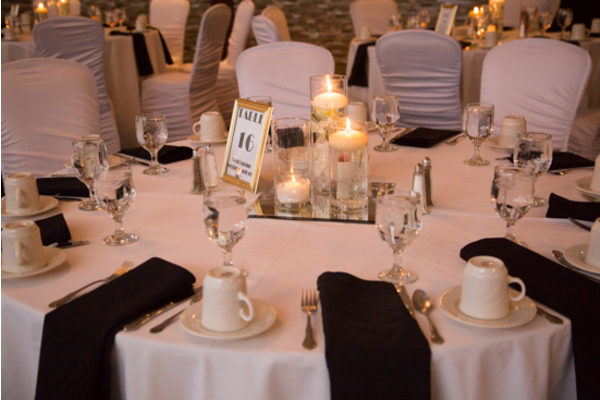 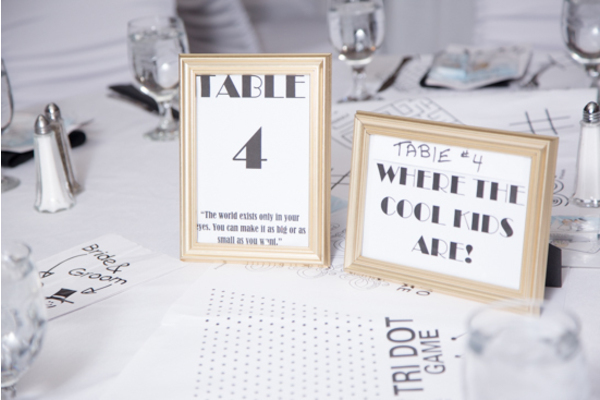 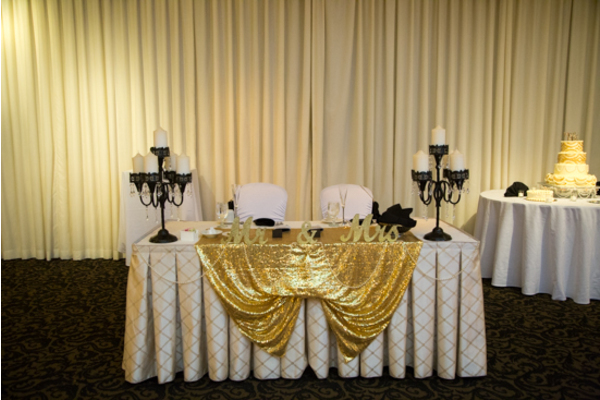 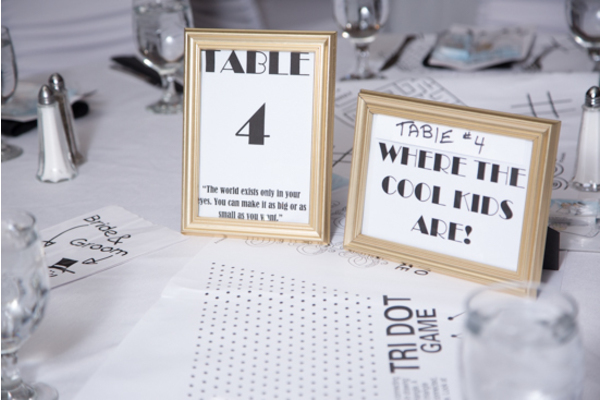 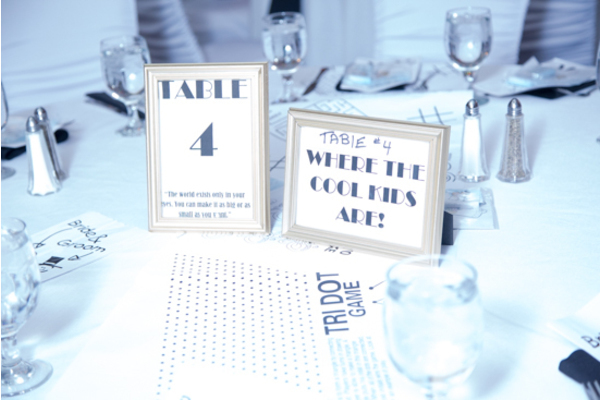 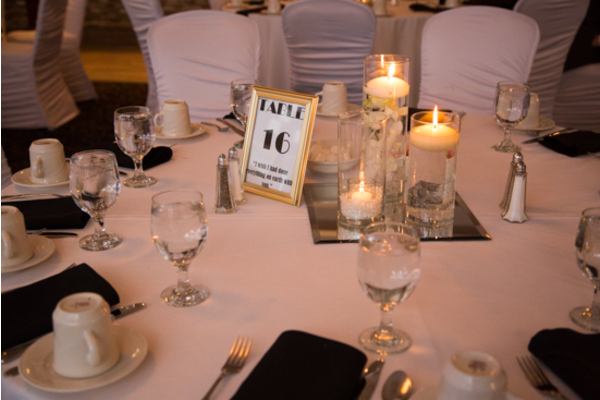 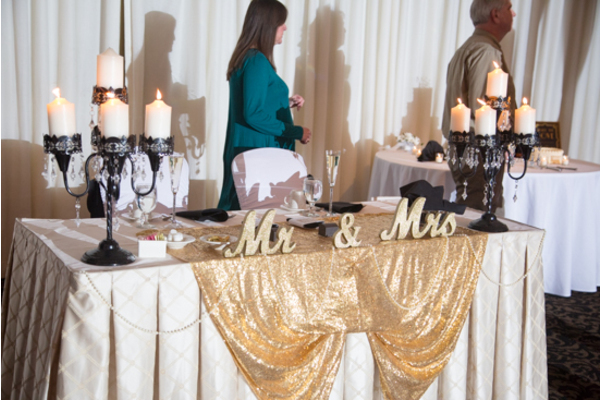 Alicia and Rob were seen at their beautifully decorated sweetheart table making a champagne toast. 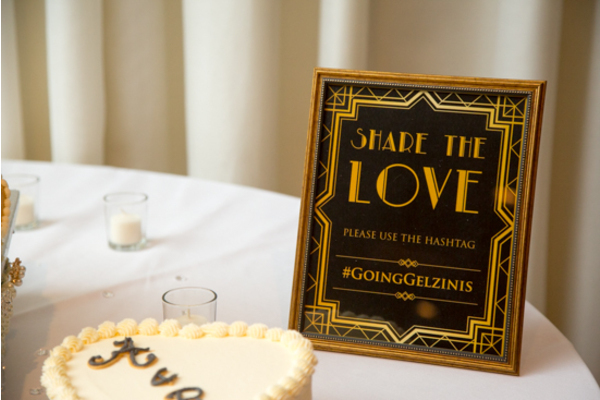 Throughout the night, two special hashtags were used:#GoingGelzinis and#AliciaGotRobbed. 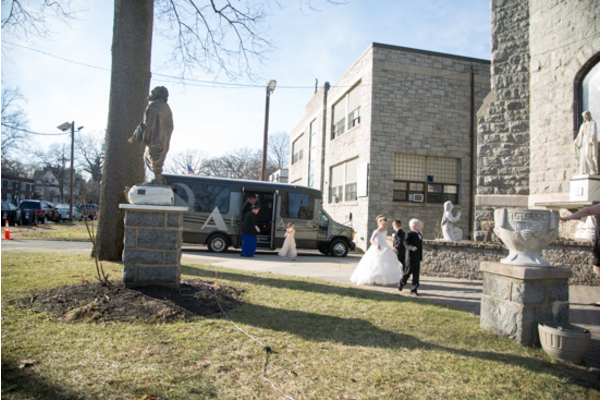 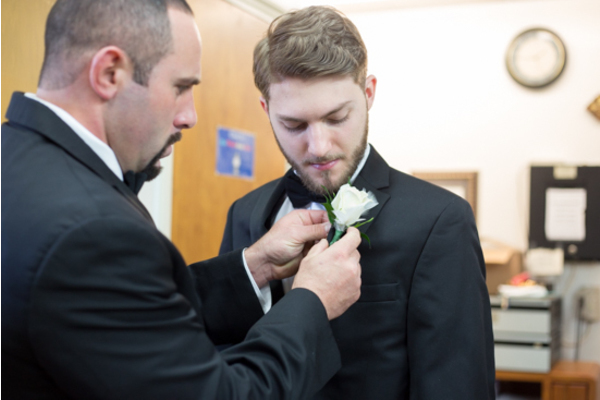 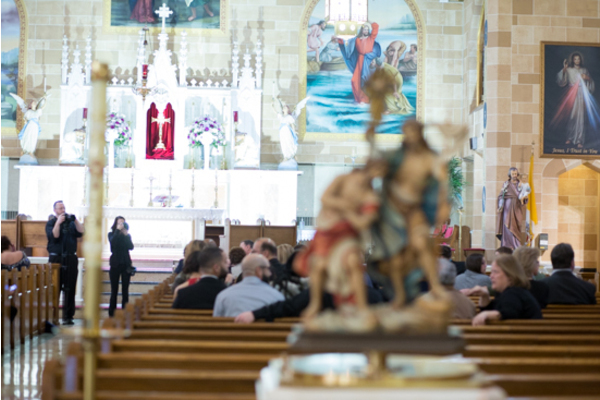 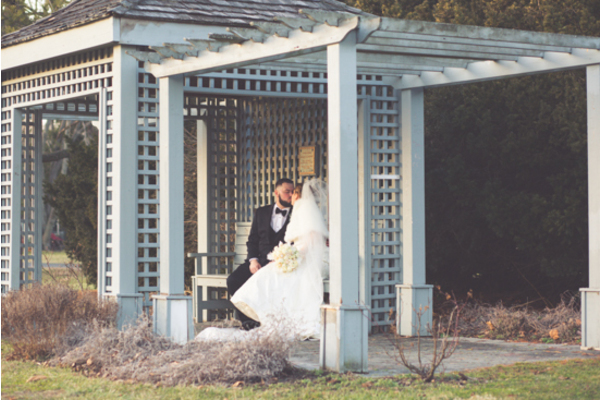 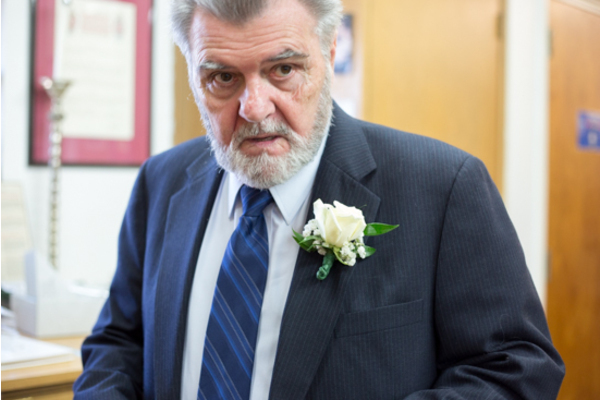 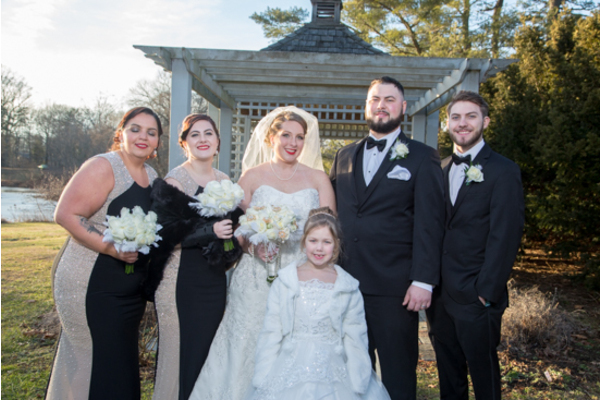 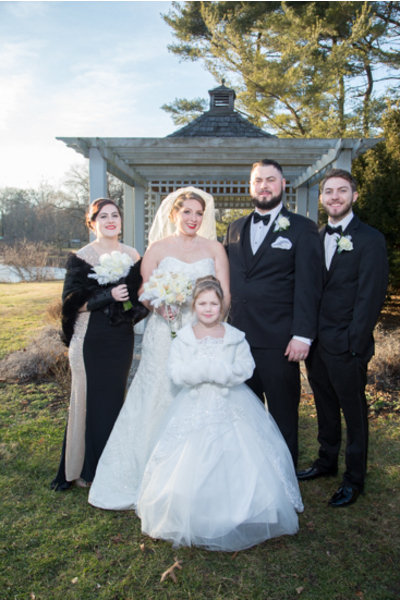 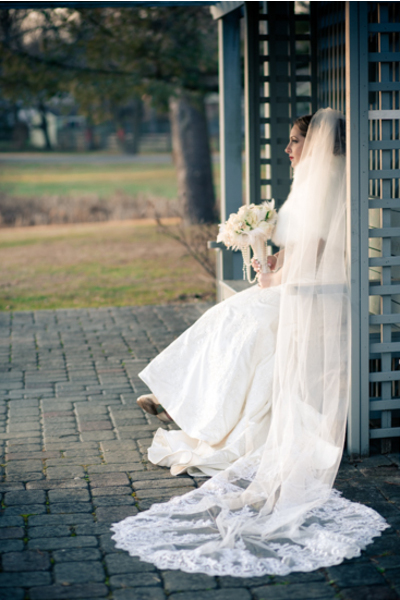 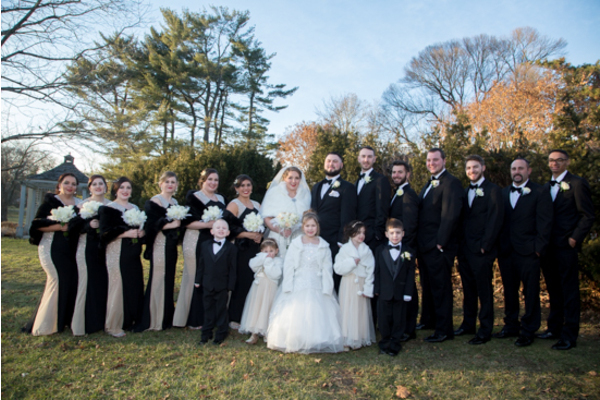 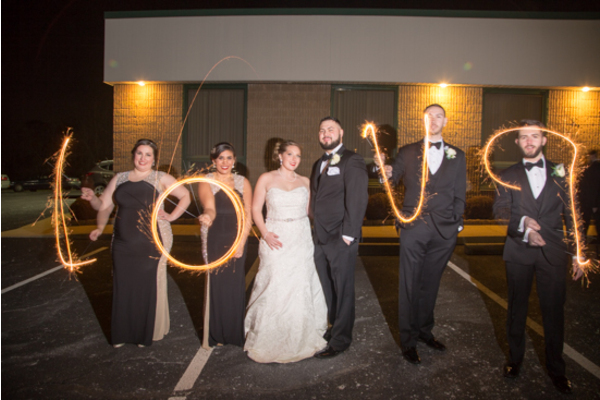 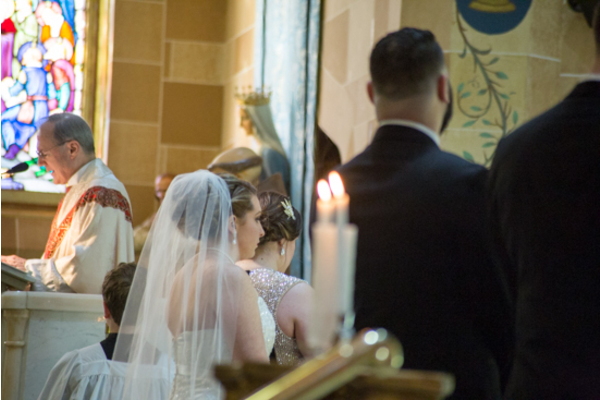 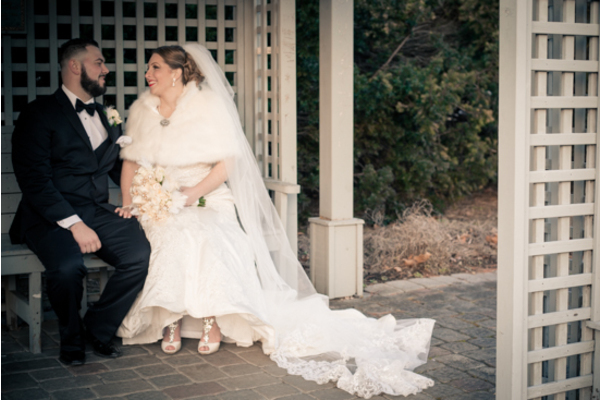 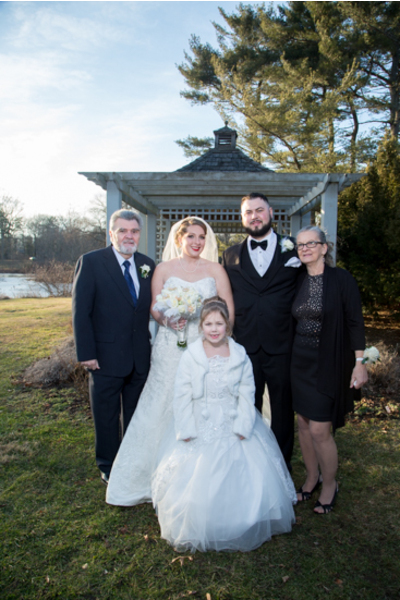 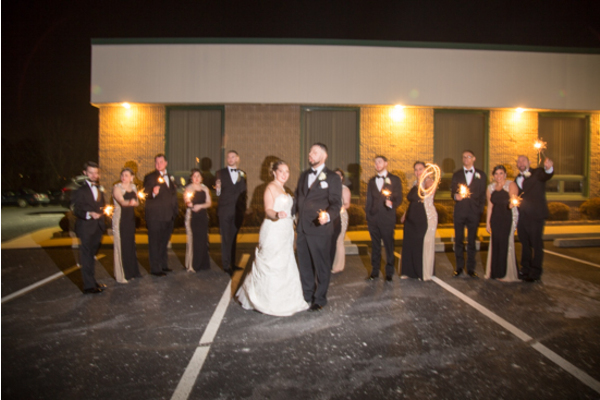 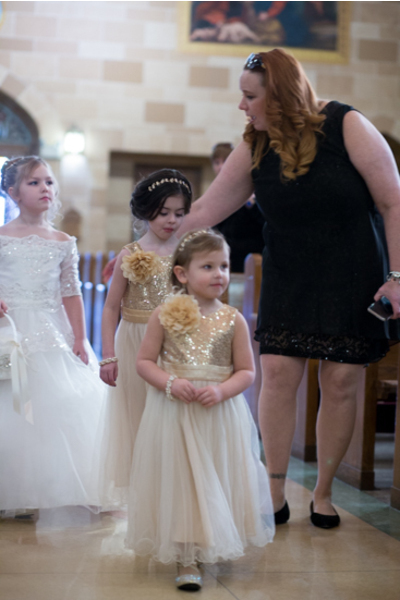 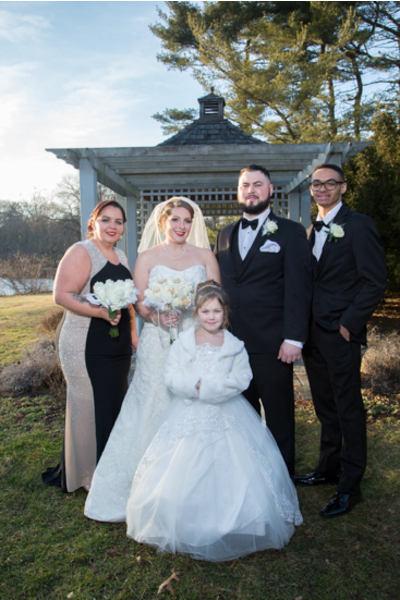 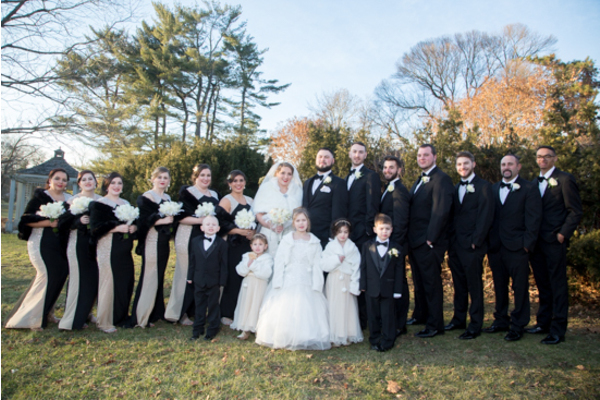 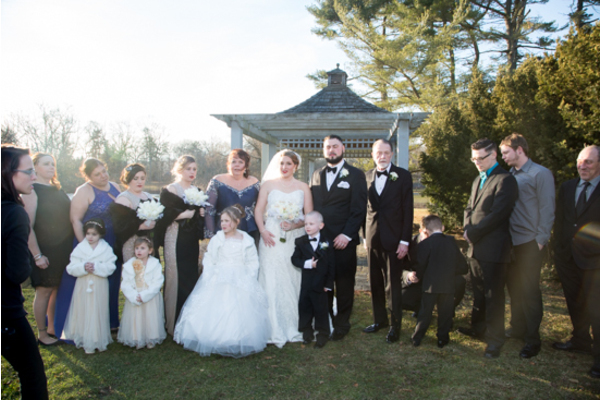 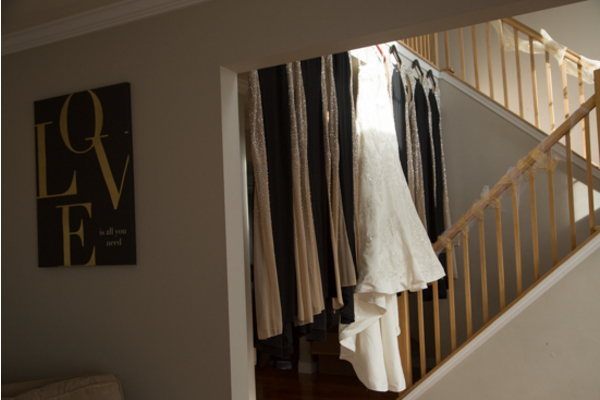 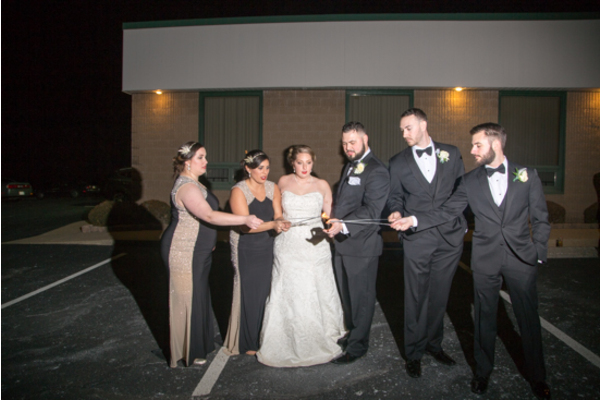 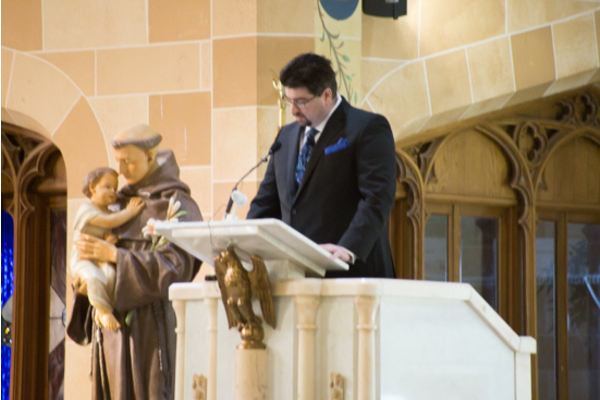 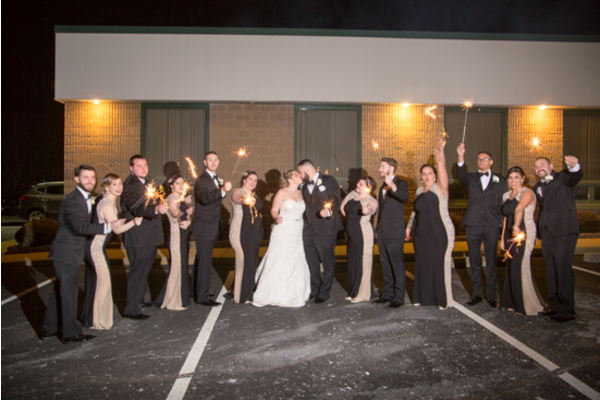 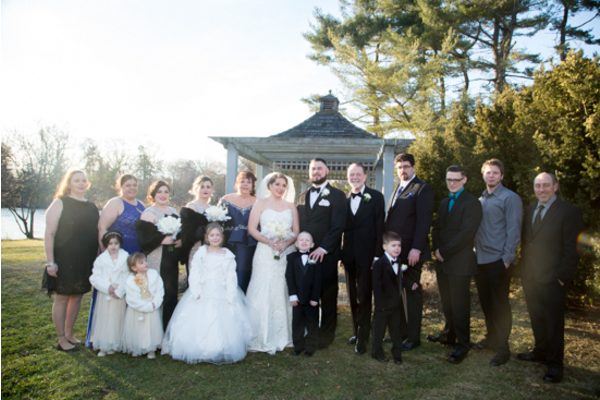 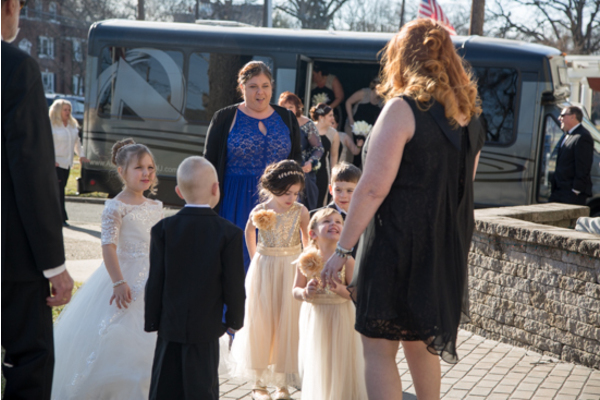 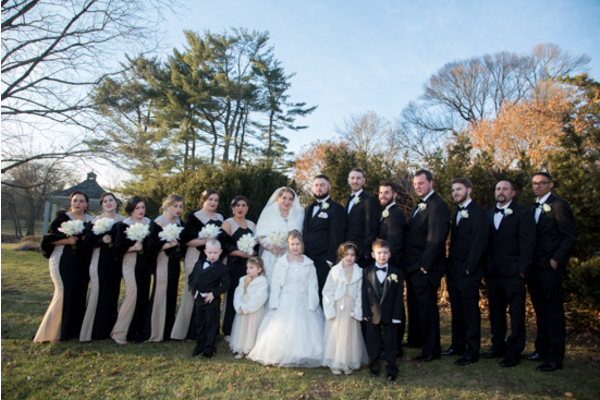 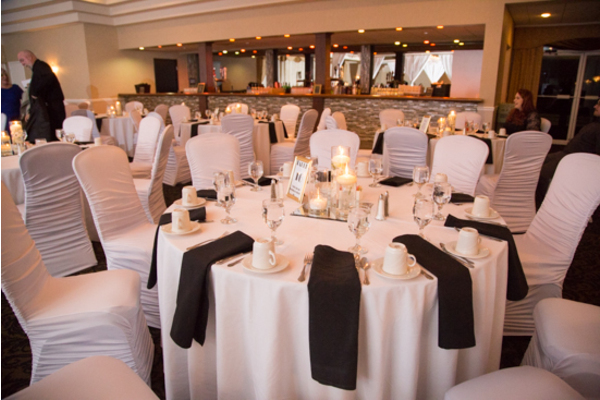 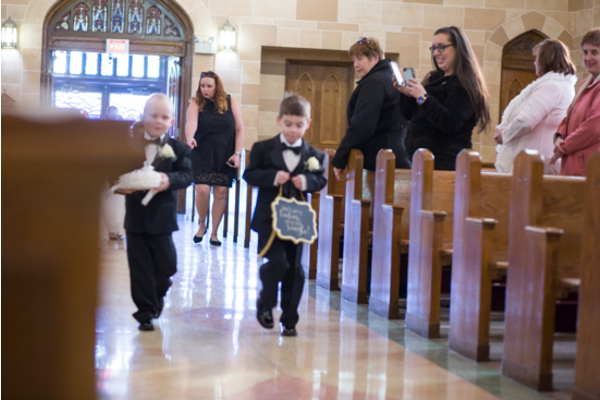 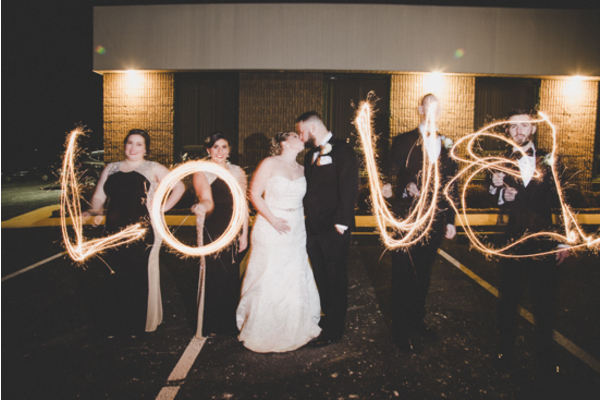 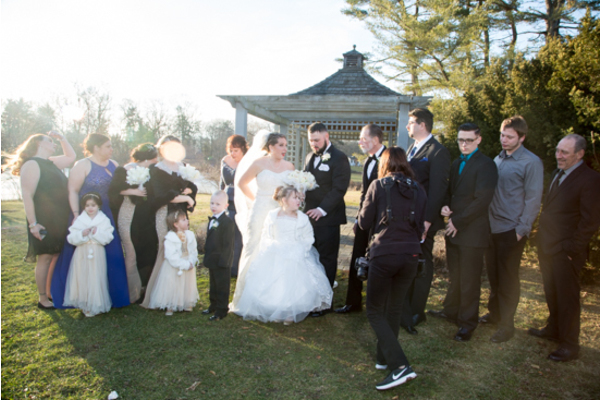 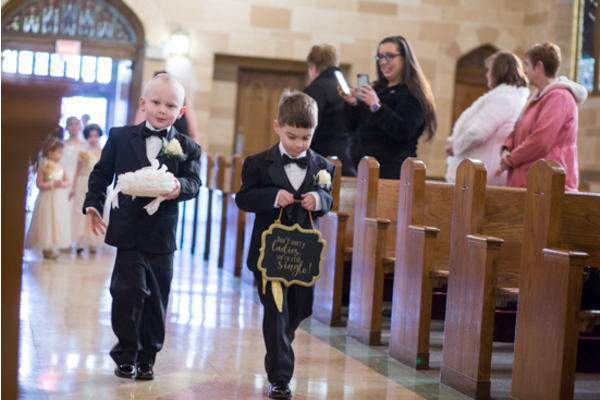 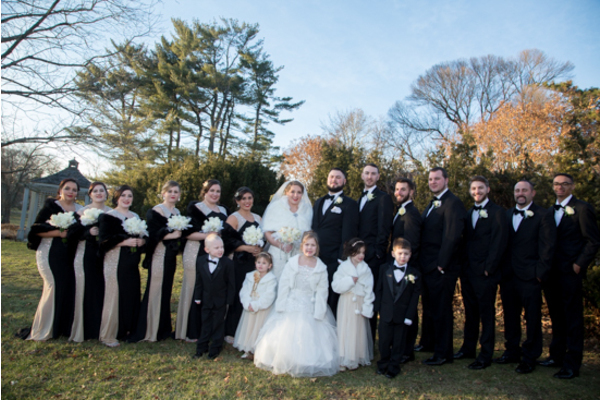 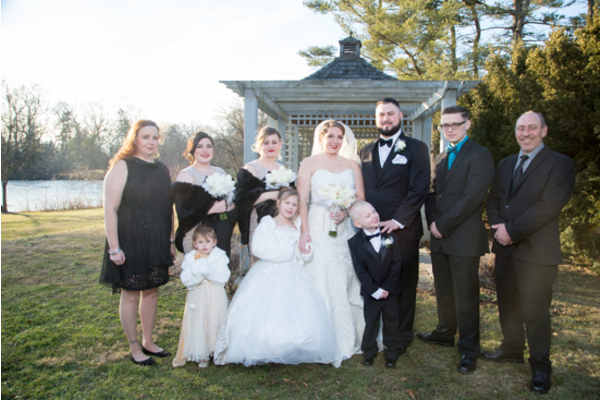 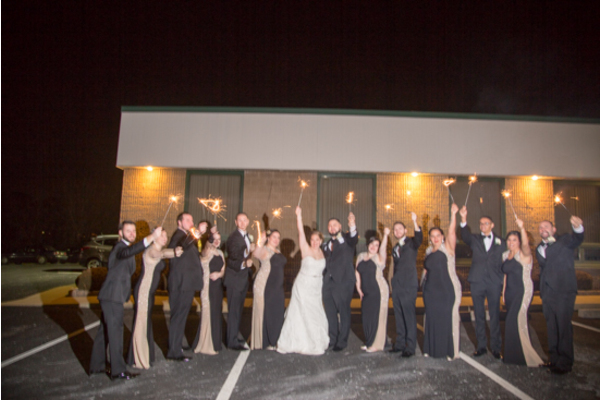 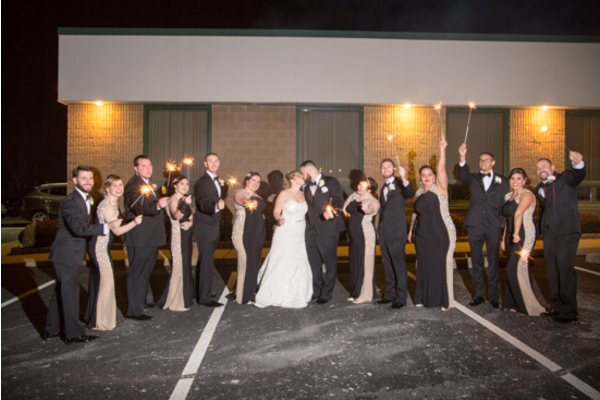 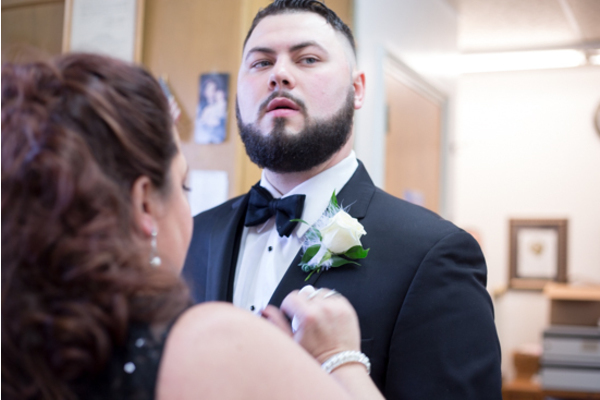 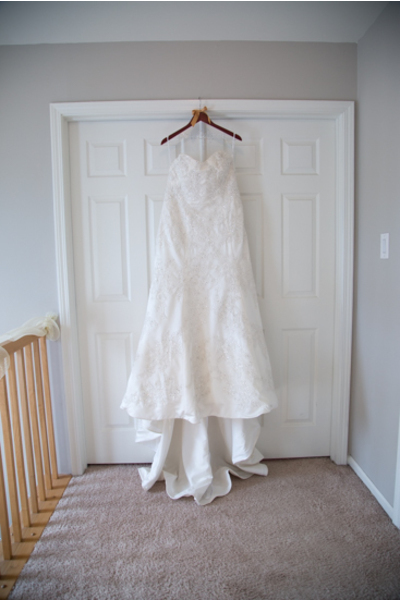 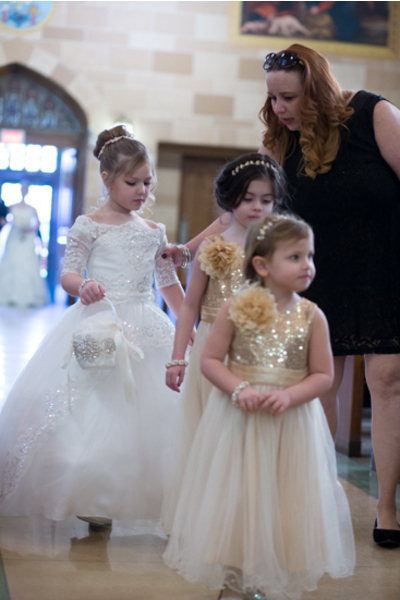 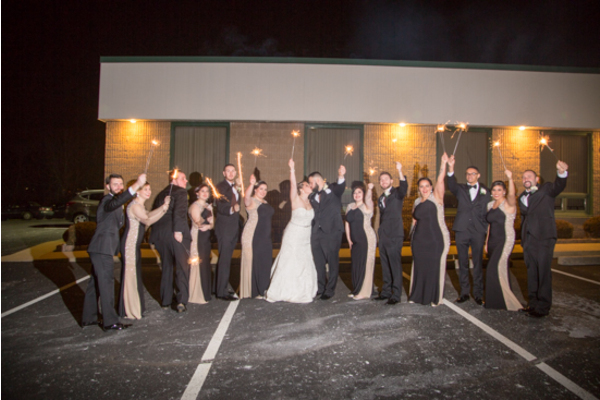 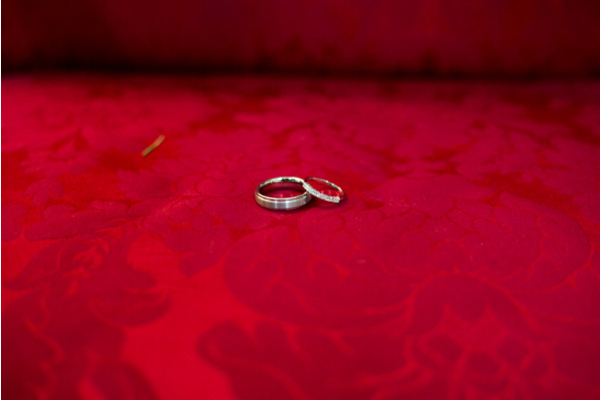 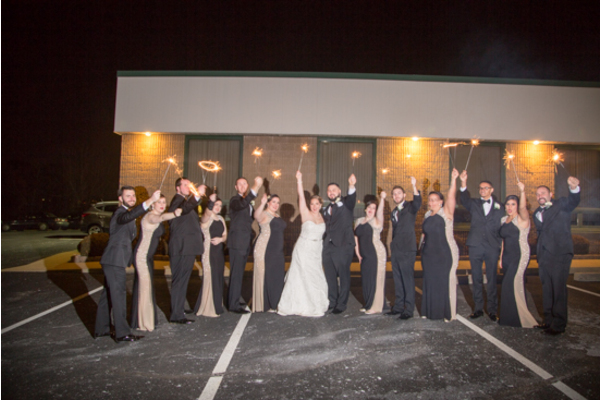 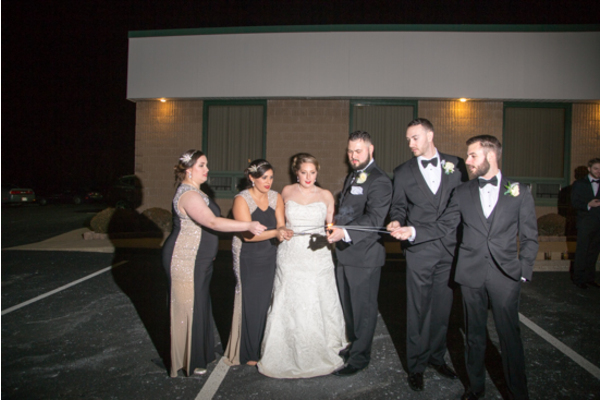 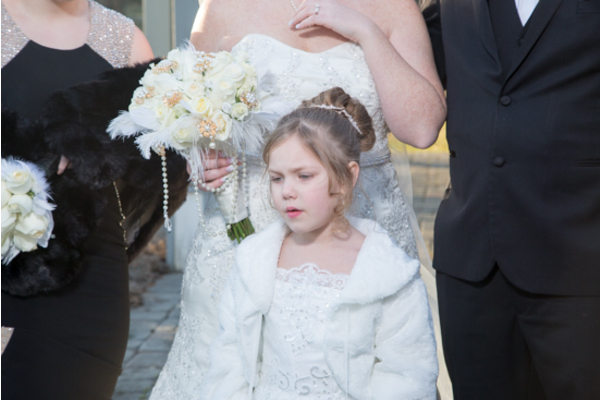 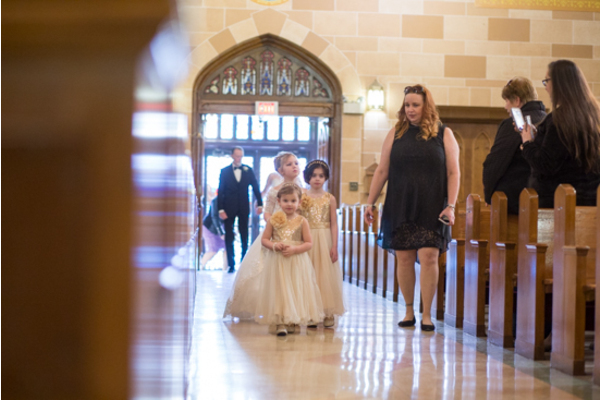 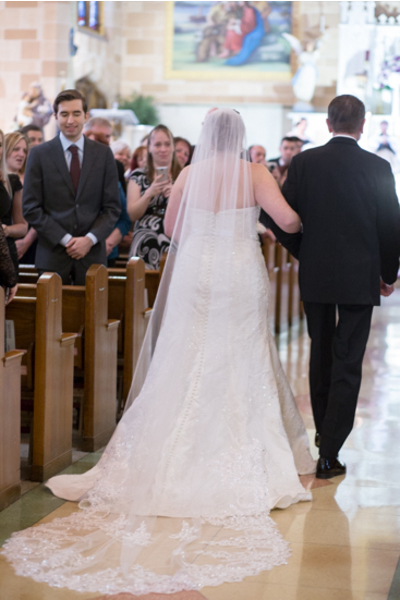 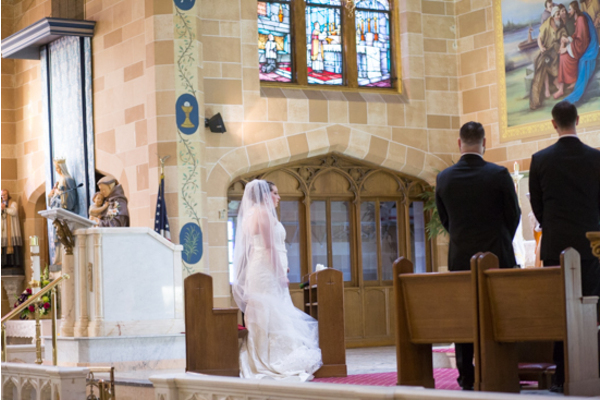 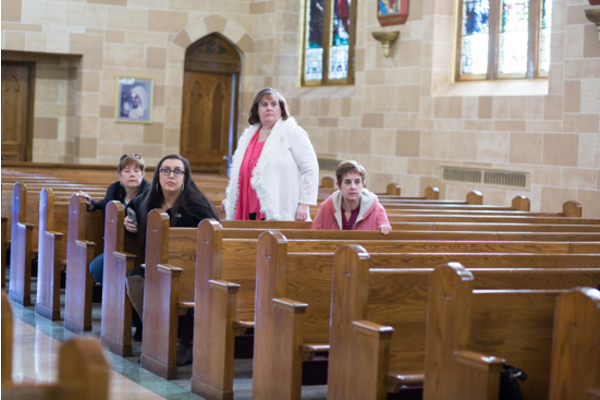 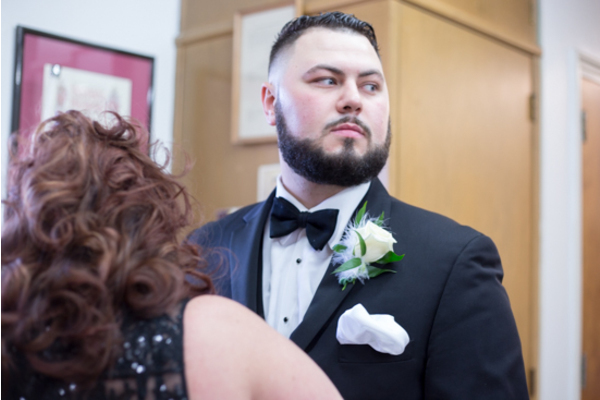 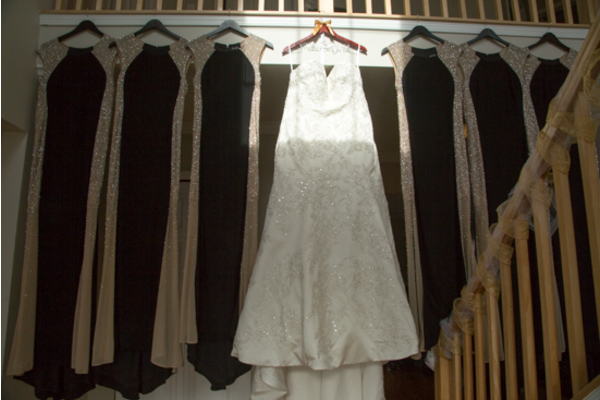 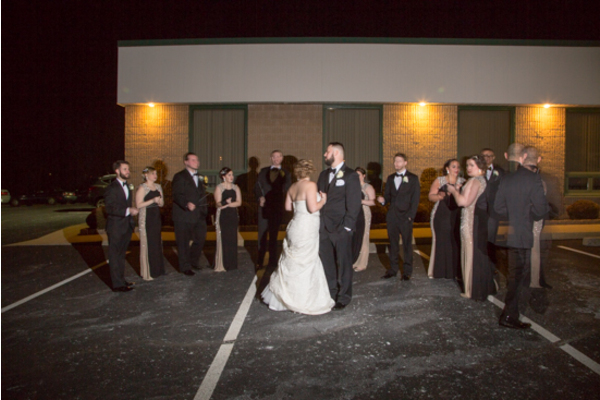 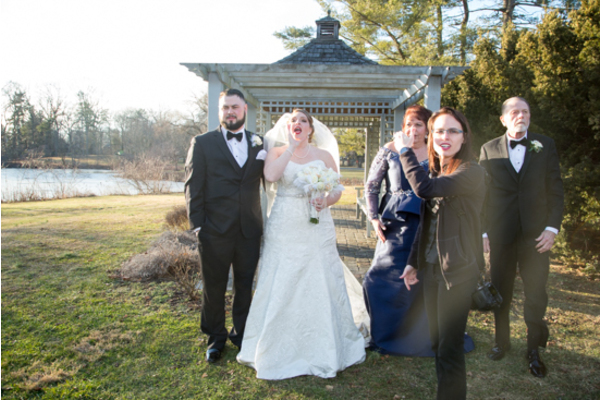 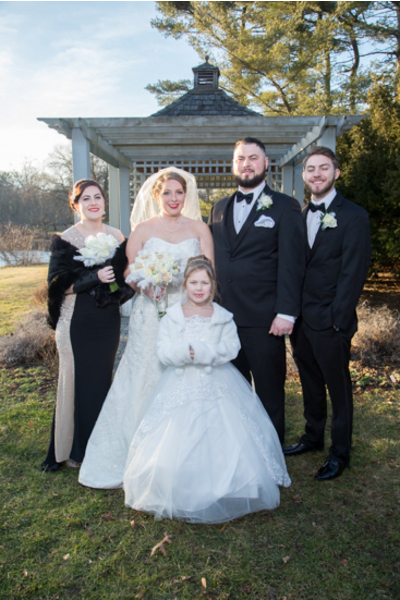 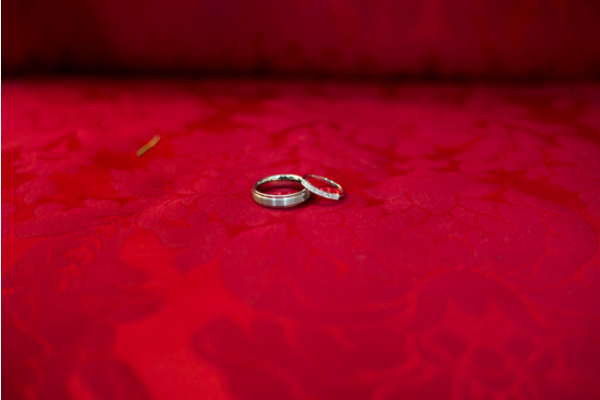 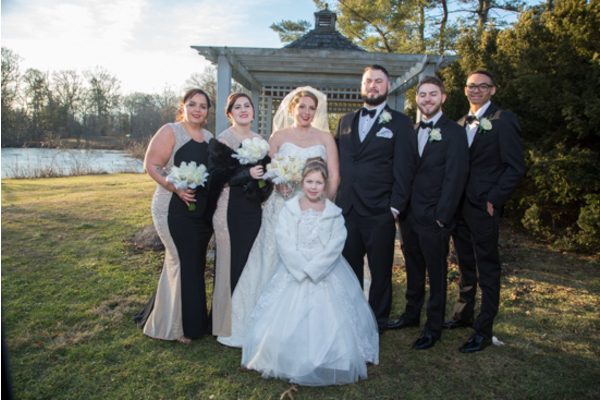 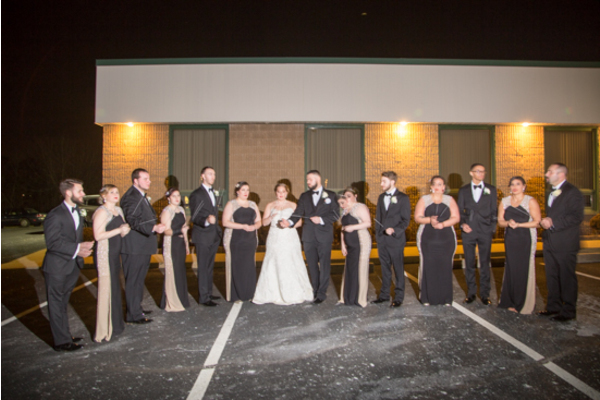 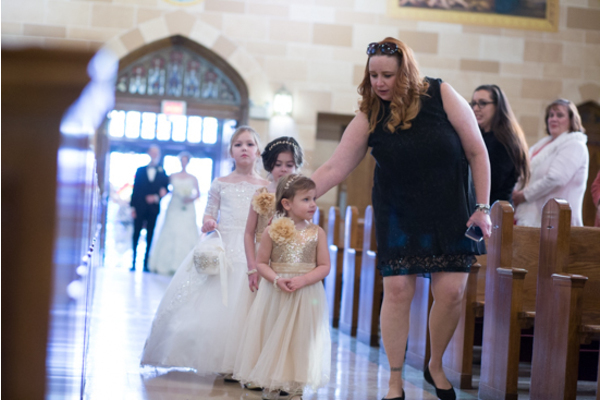 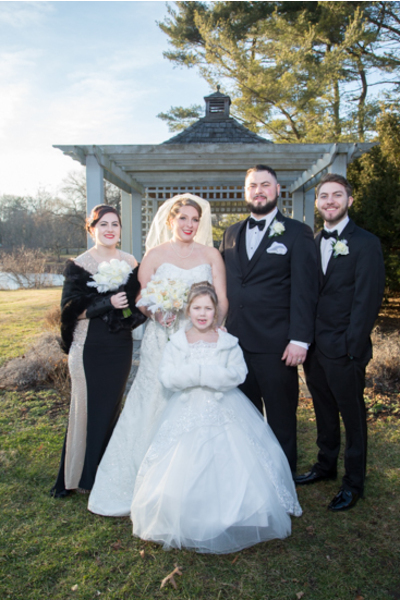 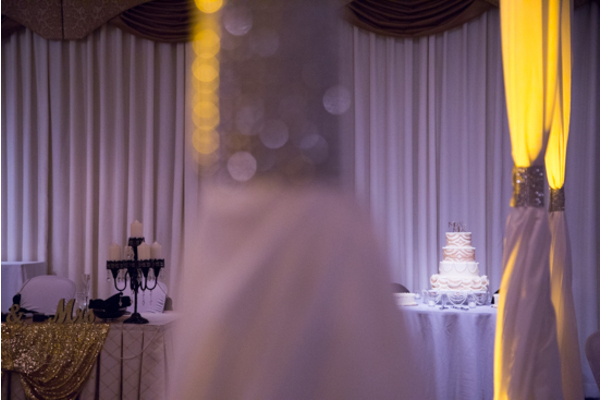 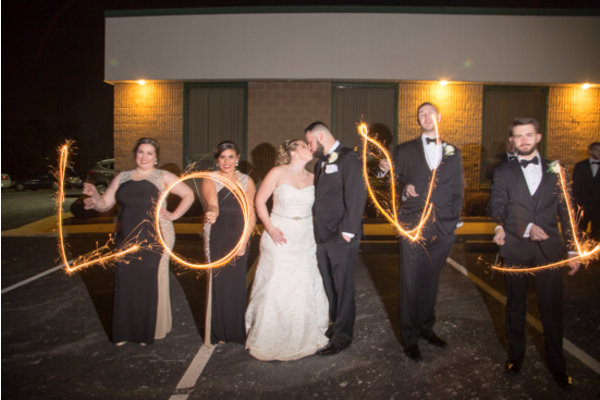 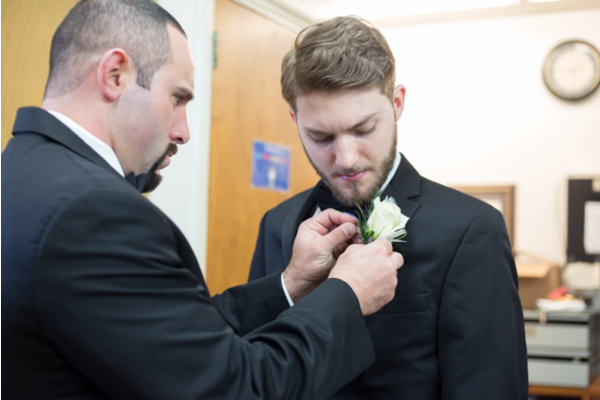 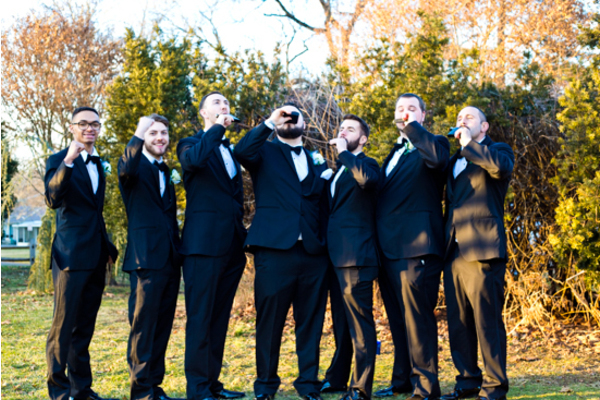 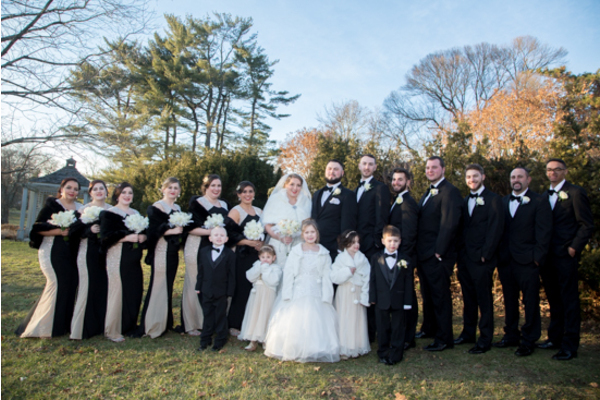 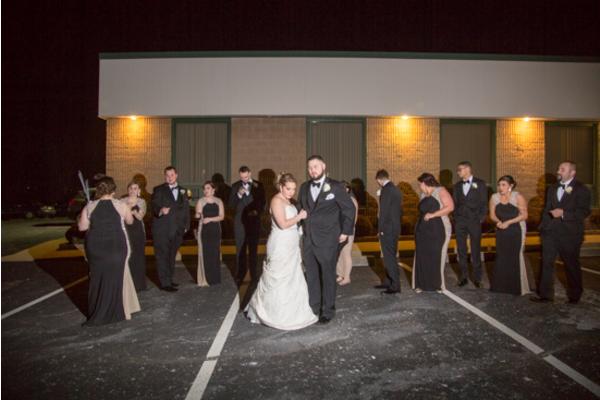 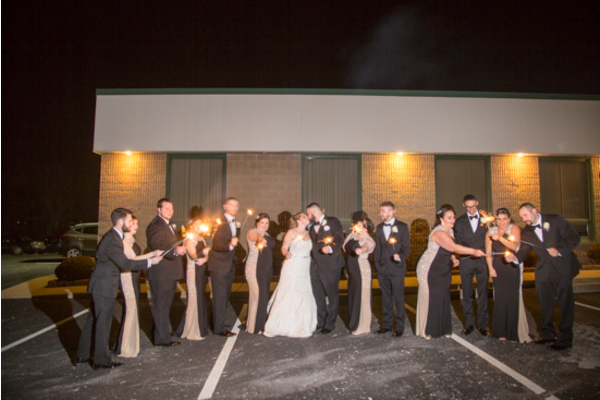 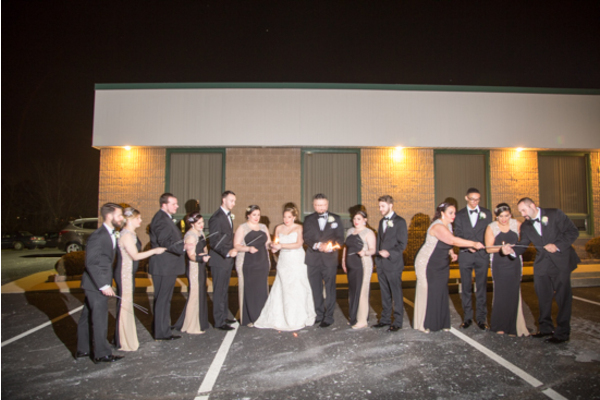 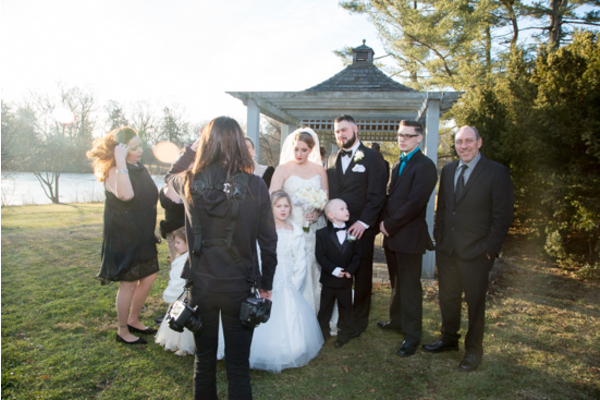 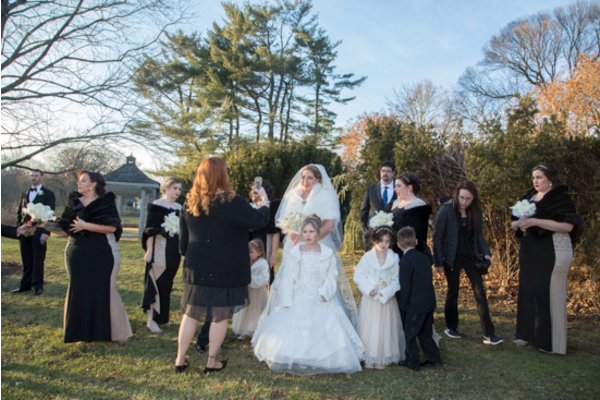 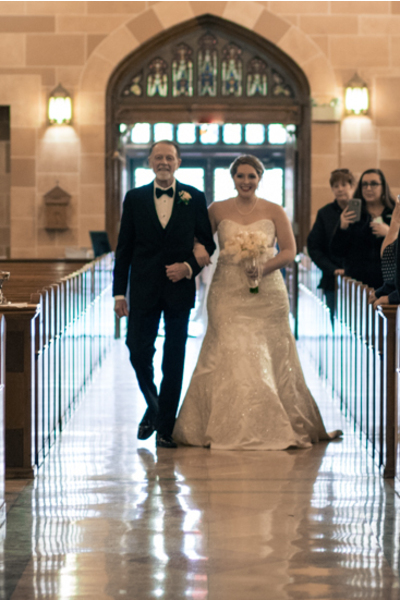 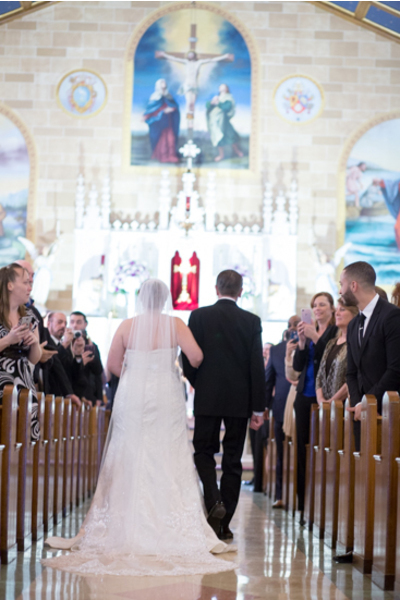 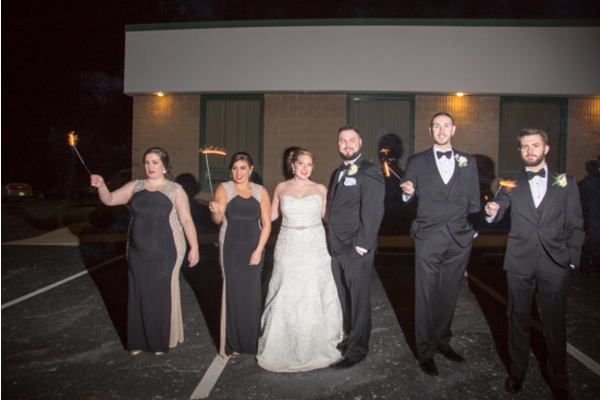 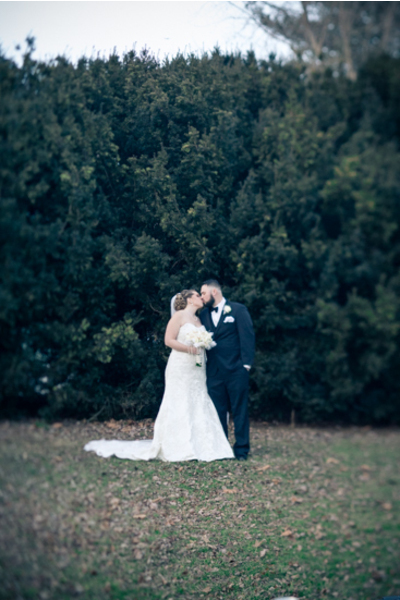 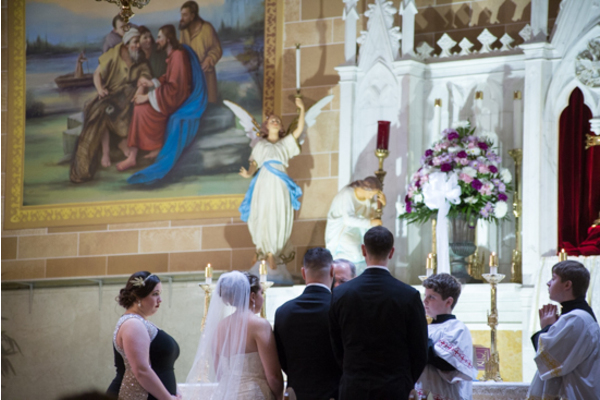 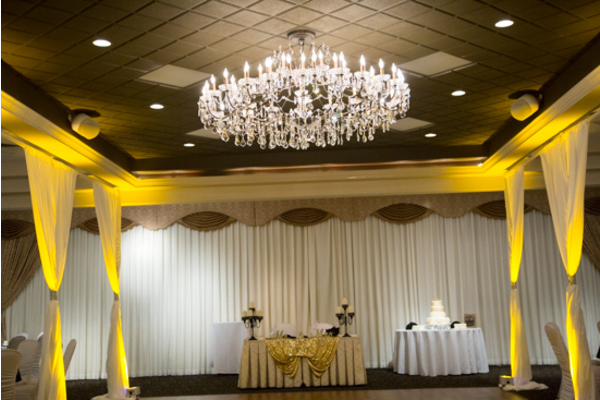 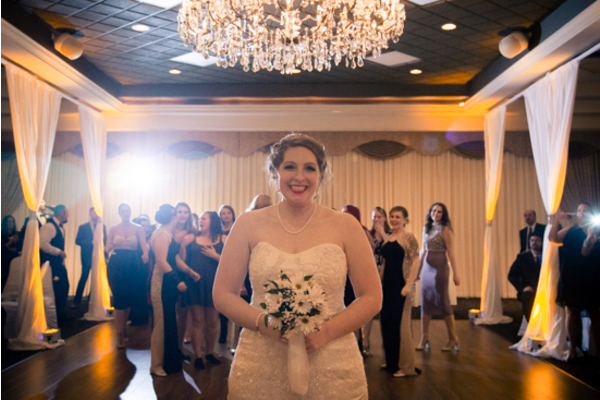 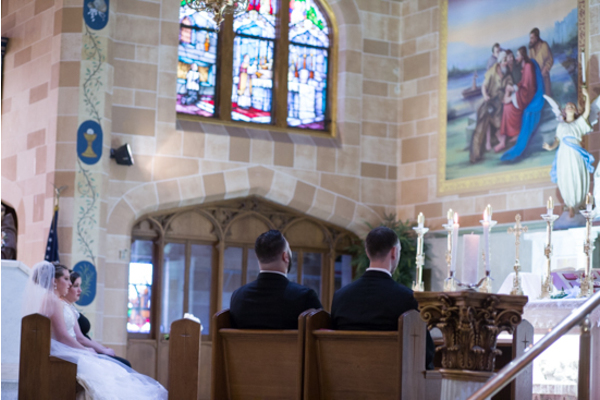 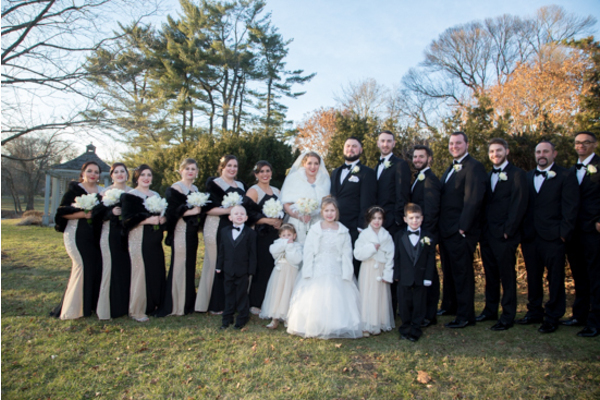 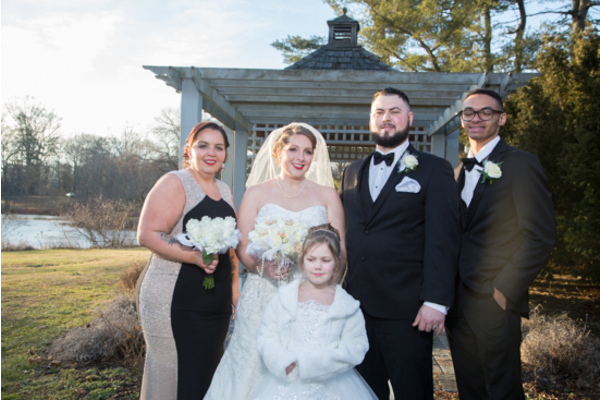 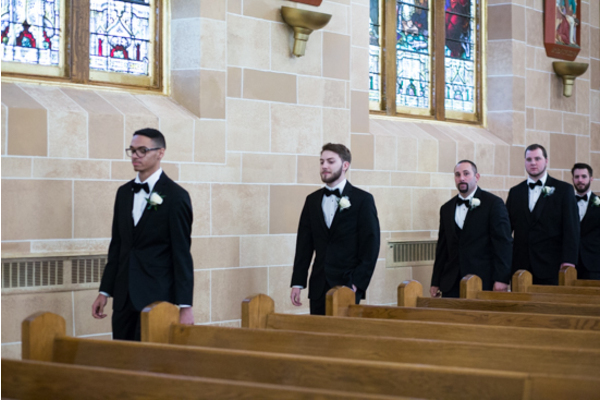 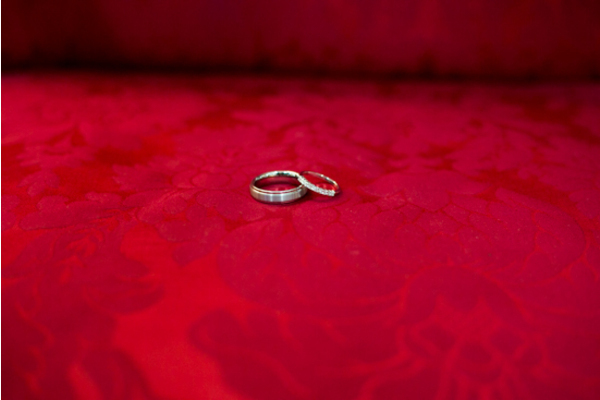 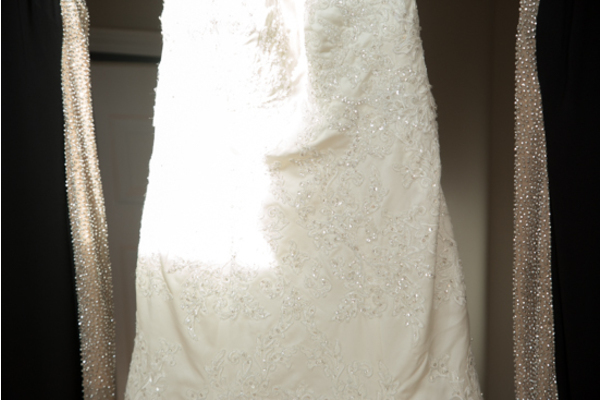 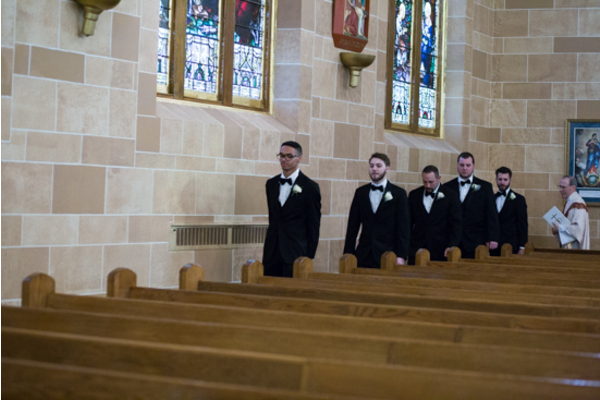 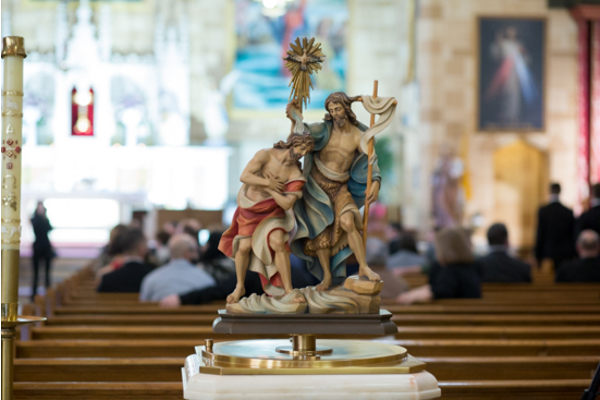 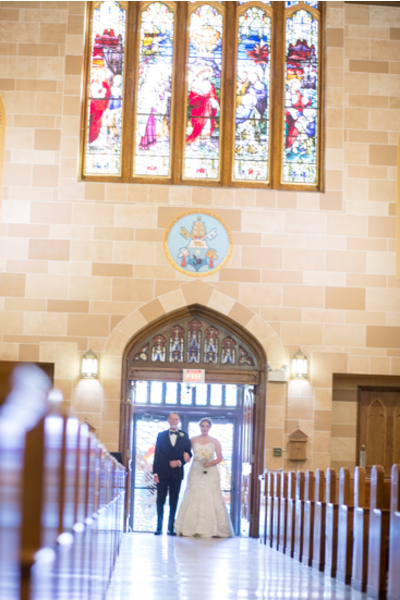 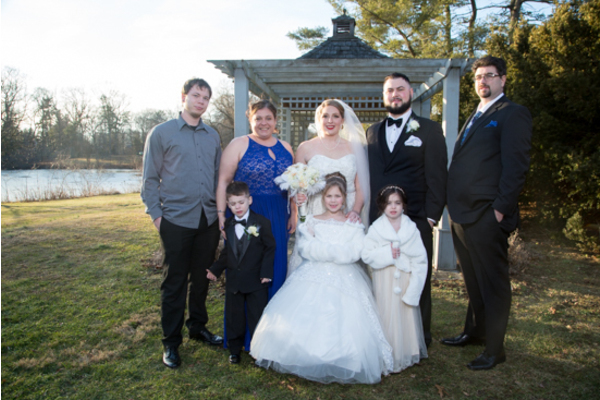 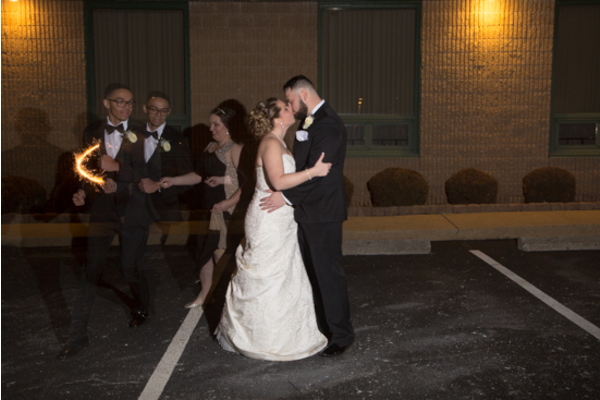 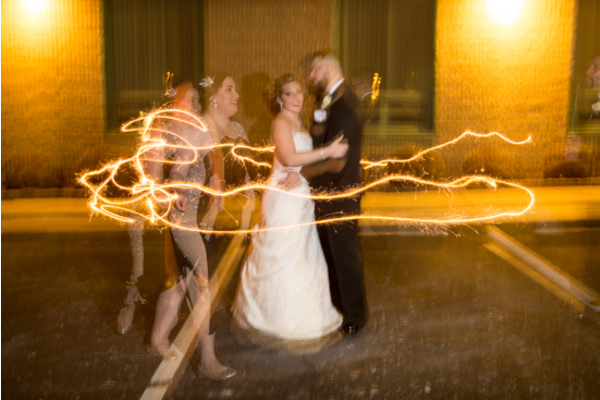 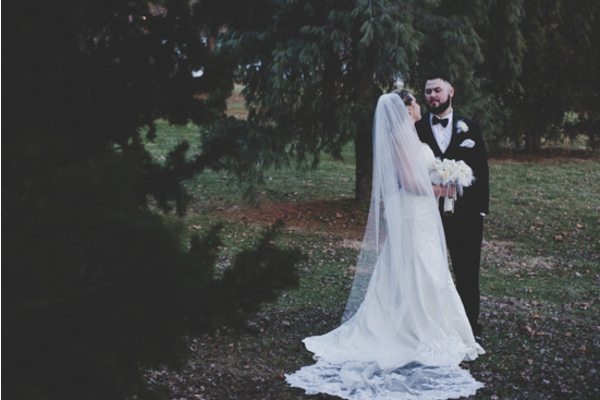 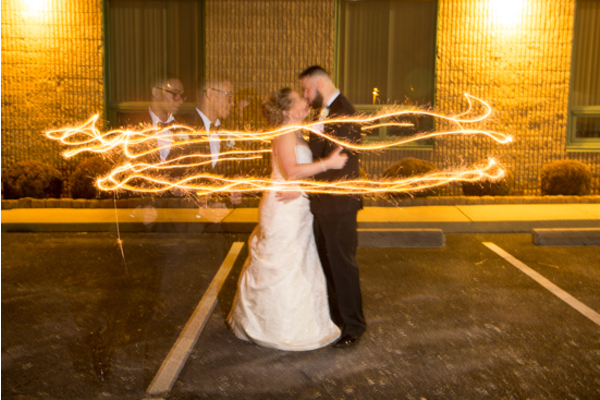 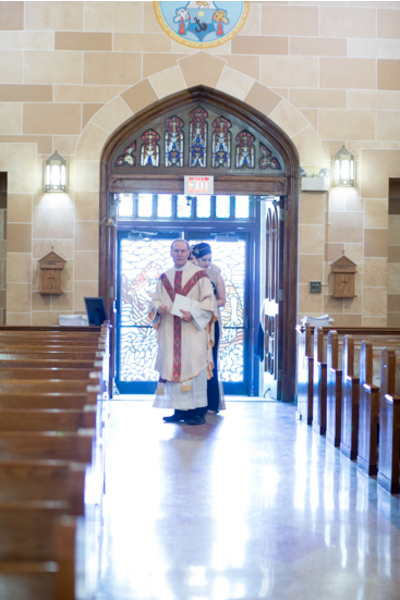 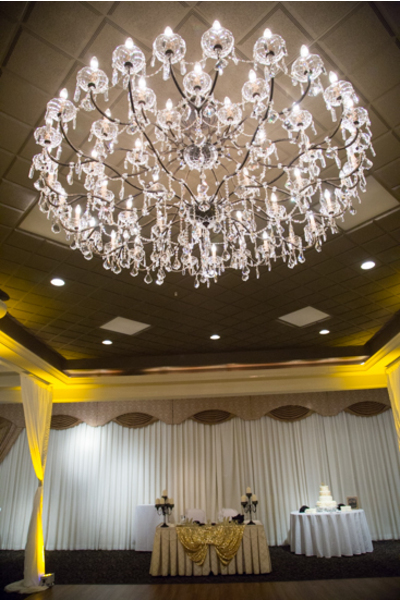 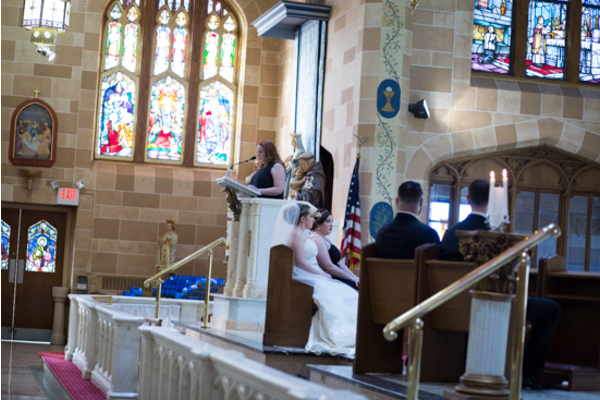 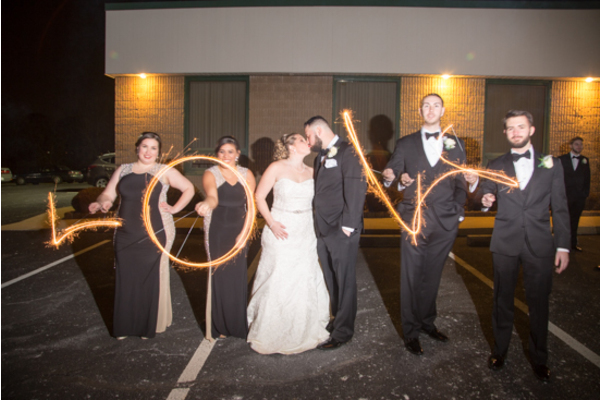 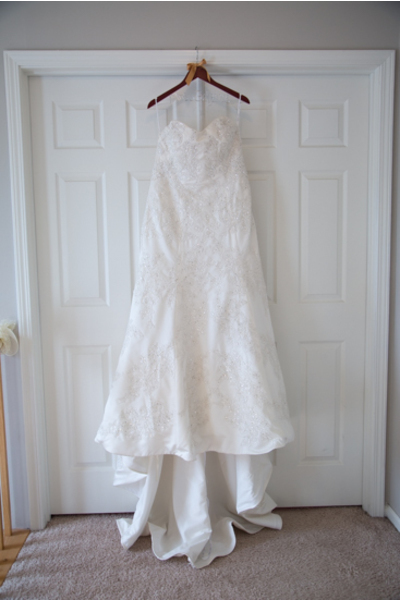 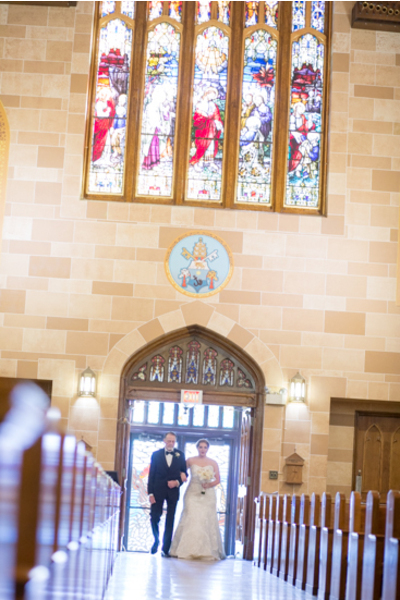 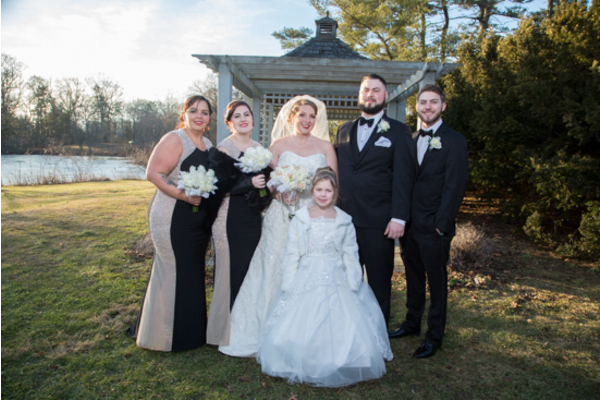 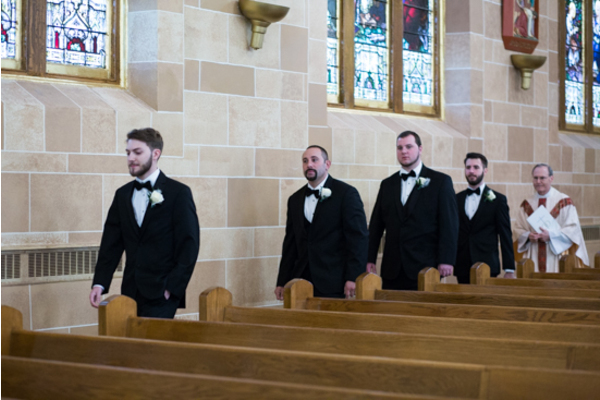 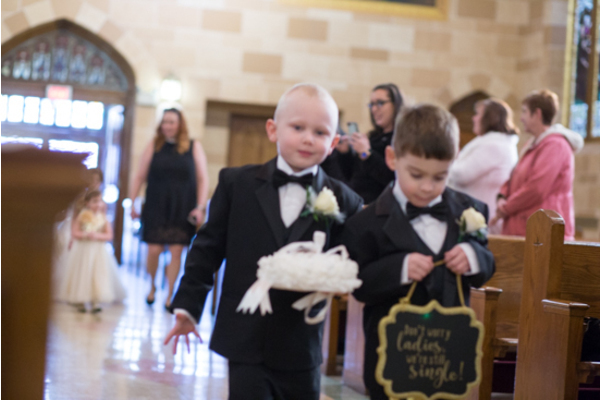 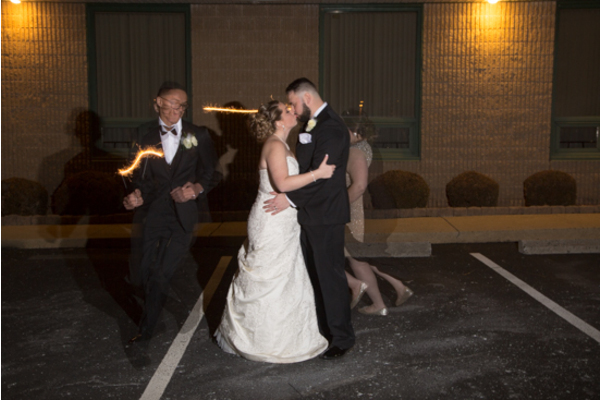 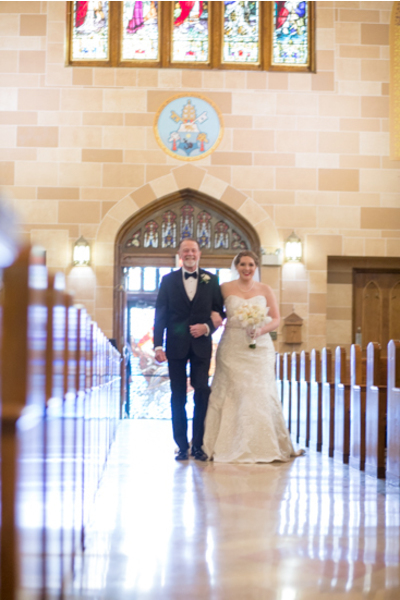 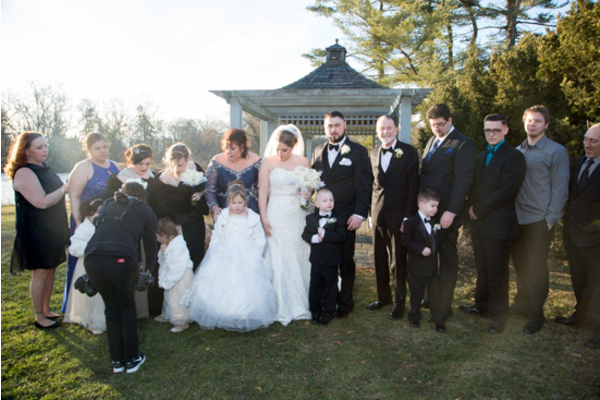 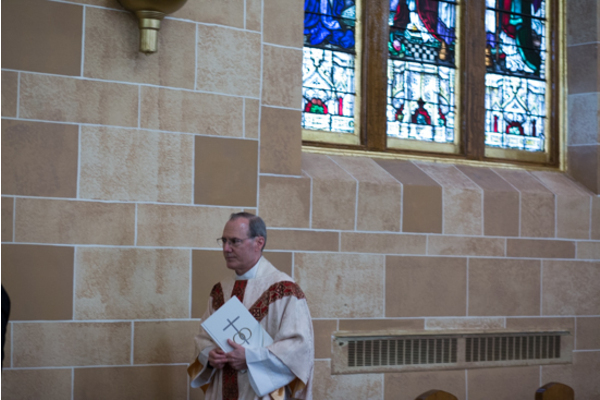 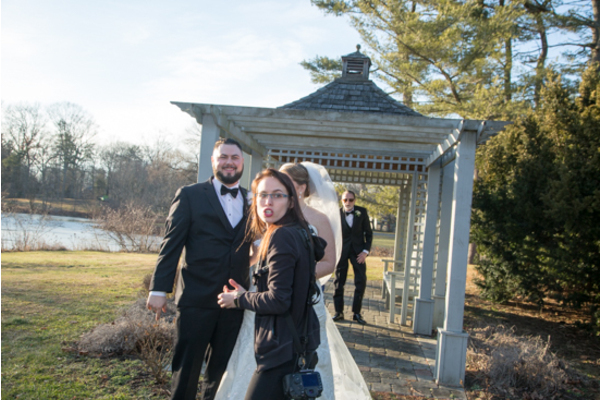 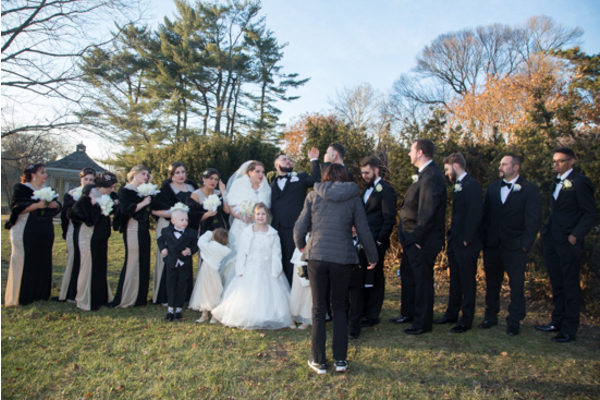 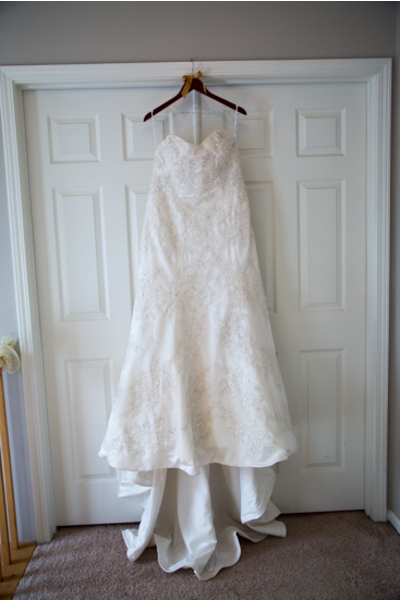 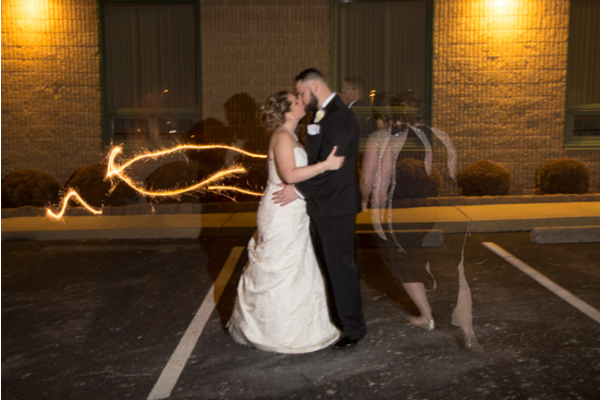 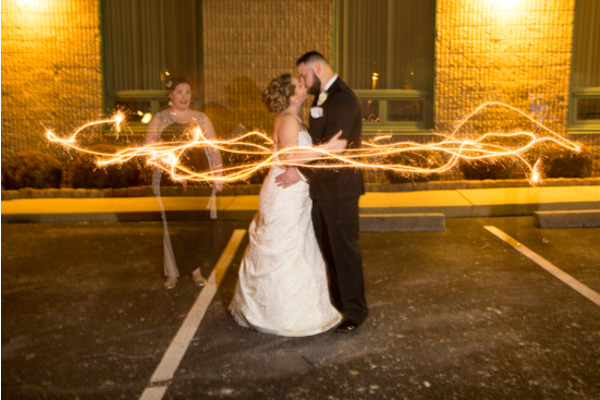 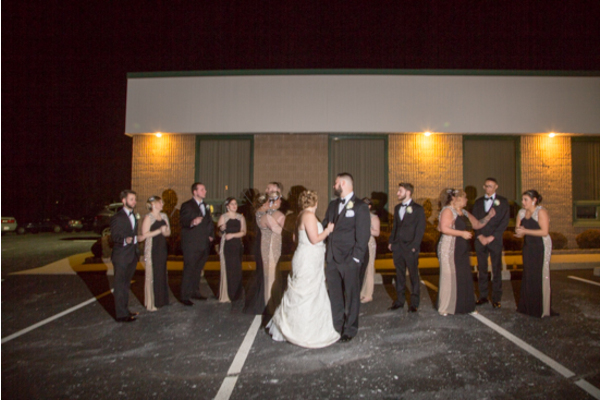 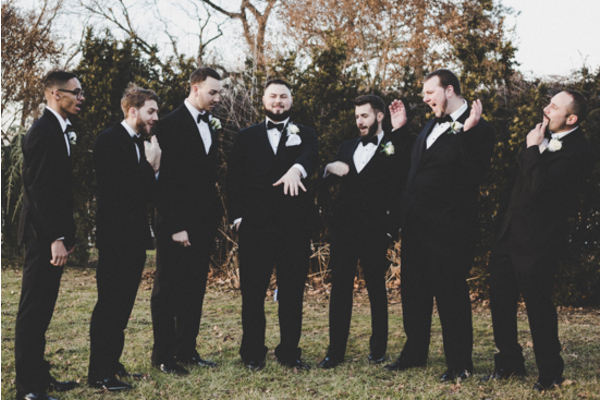 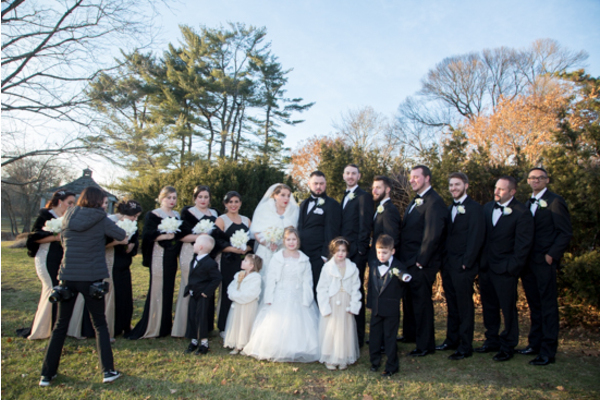 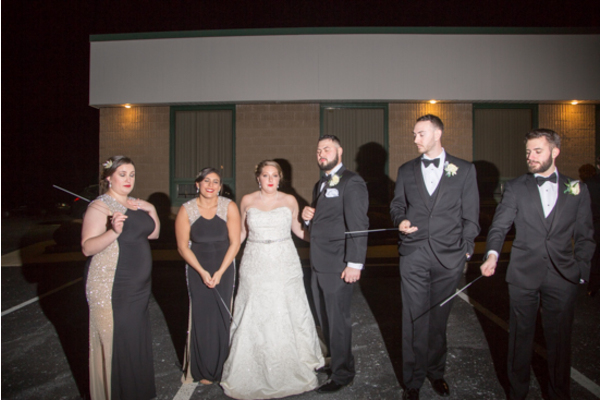 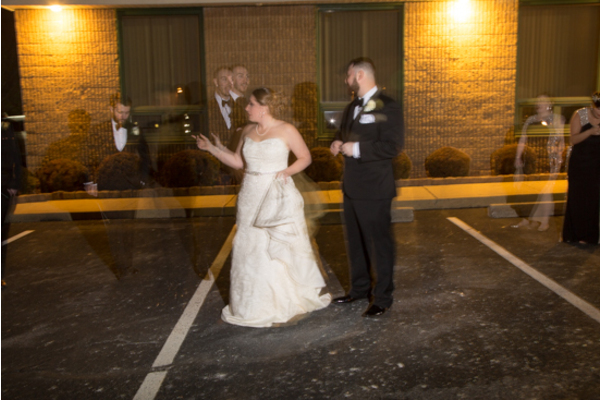 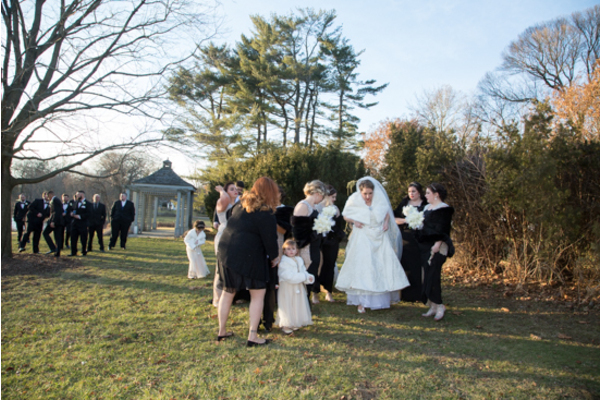 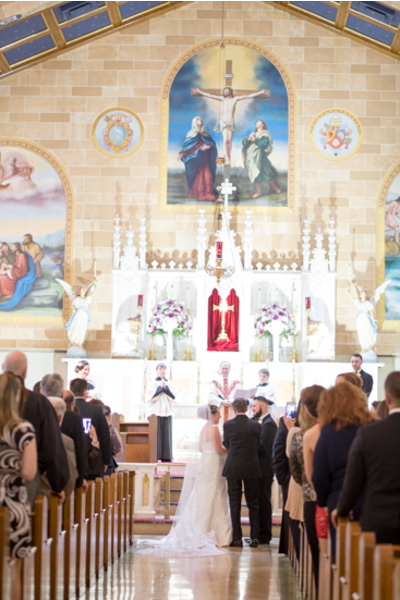 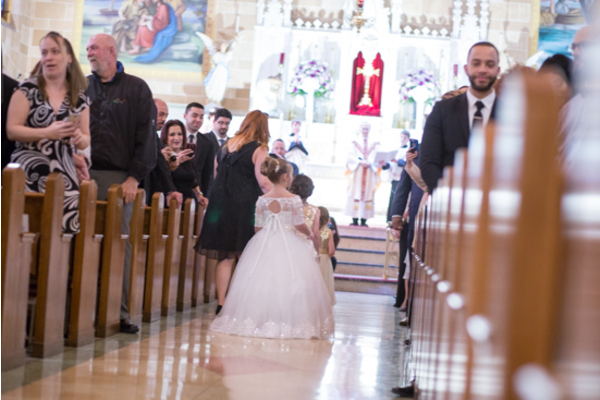 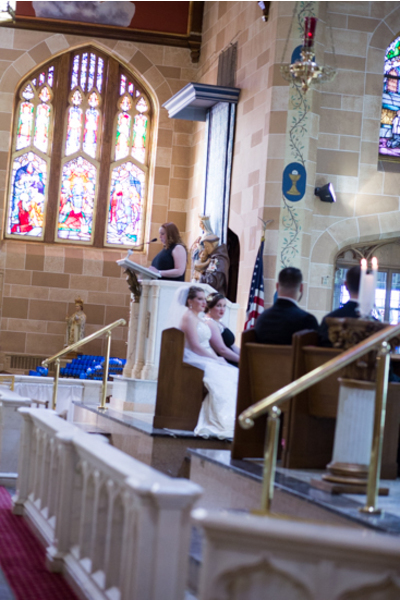 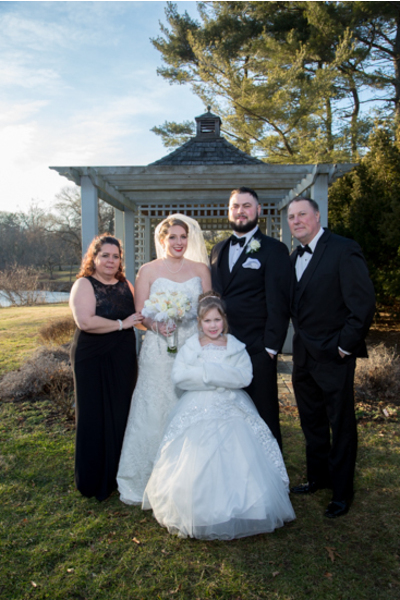 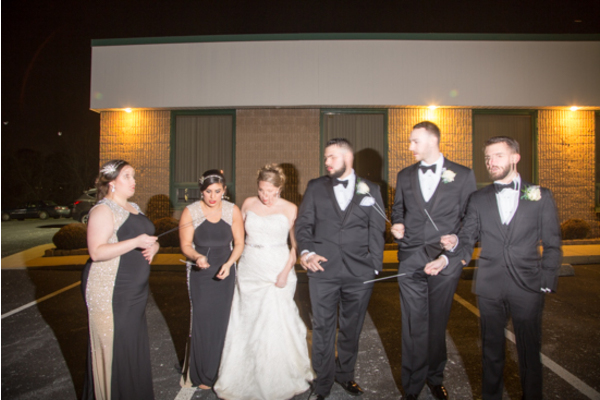 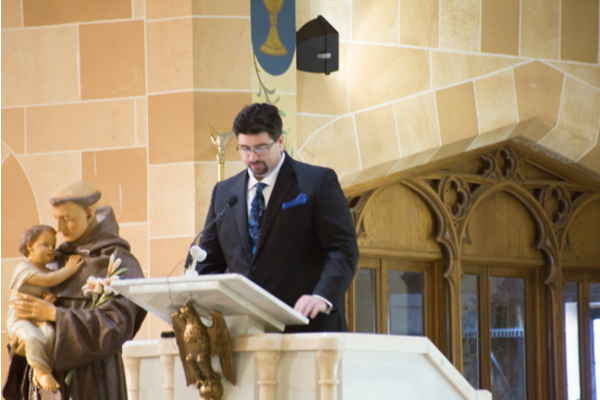 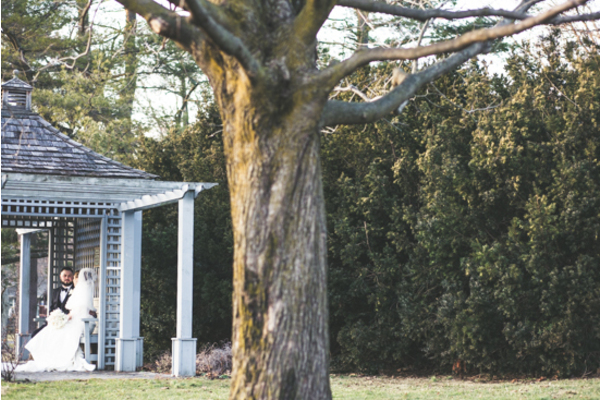 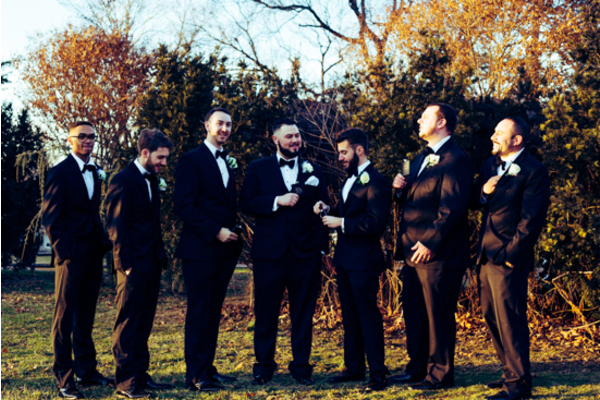 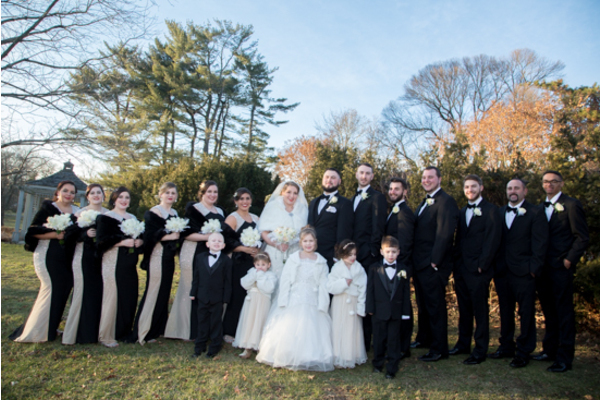 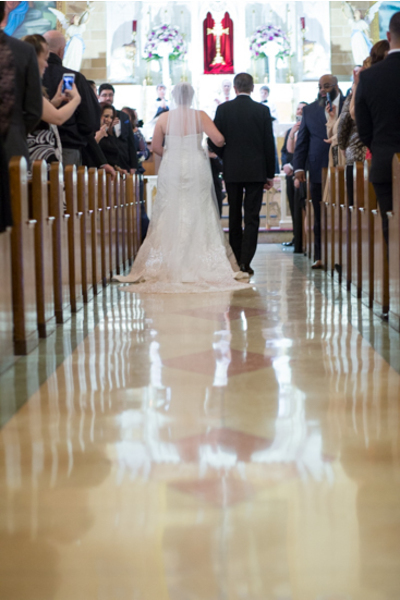 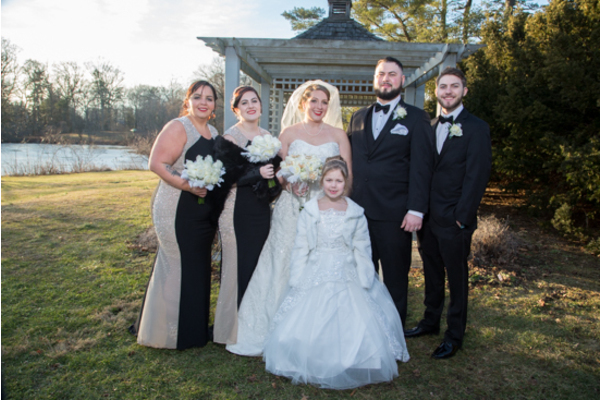 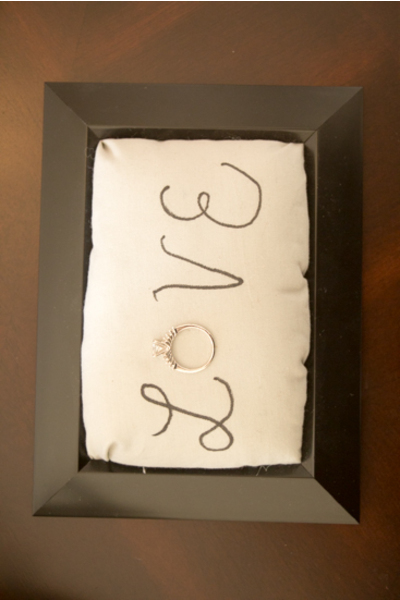 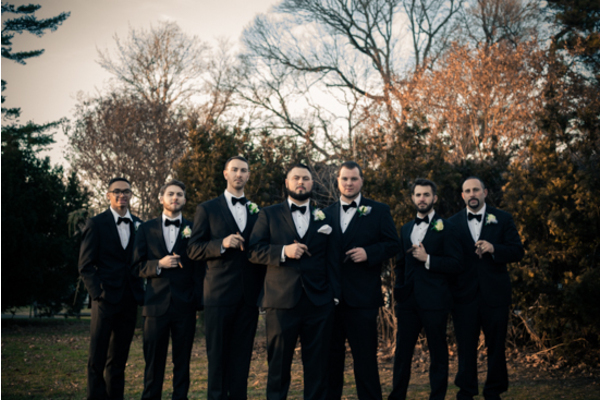 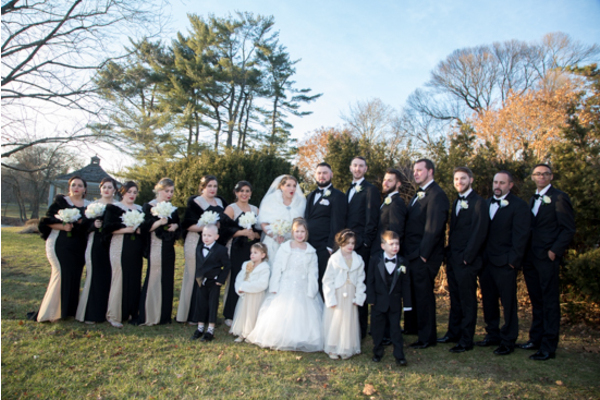 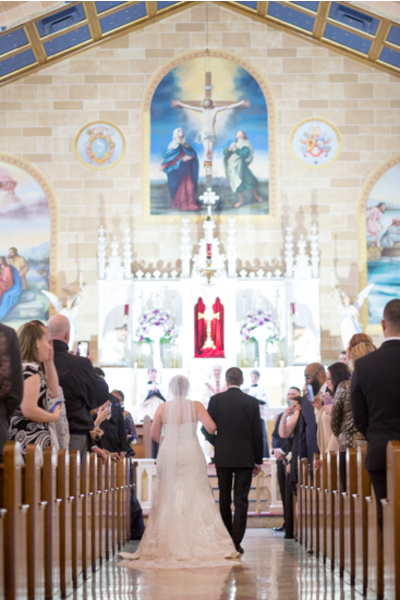 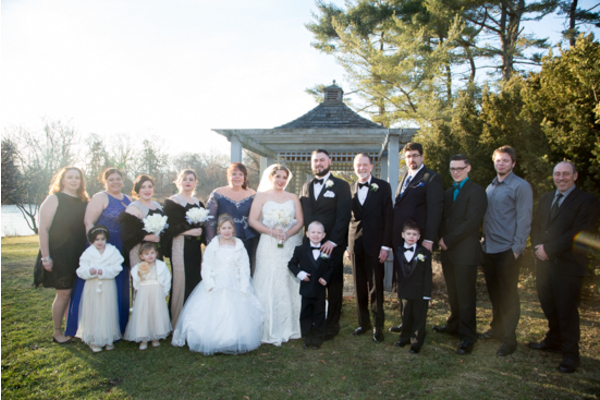 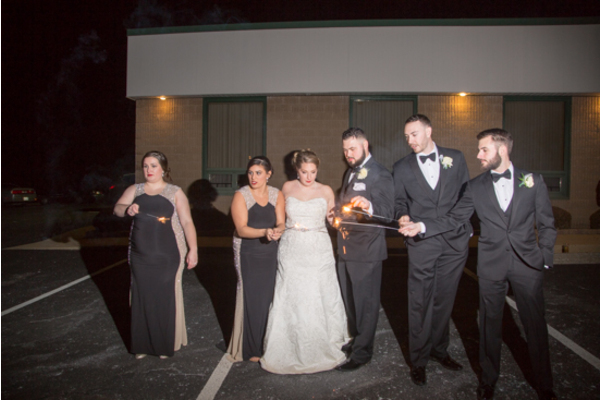 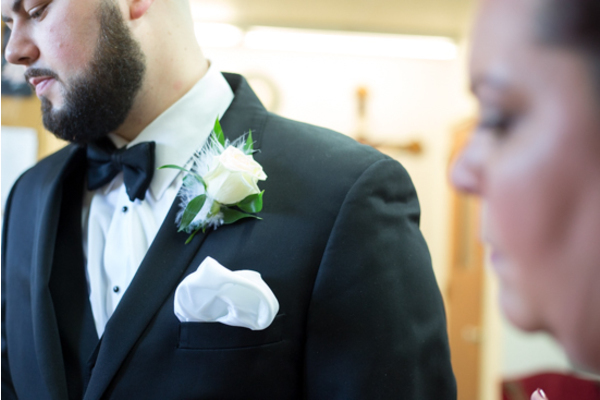 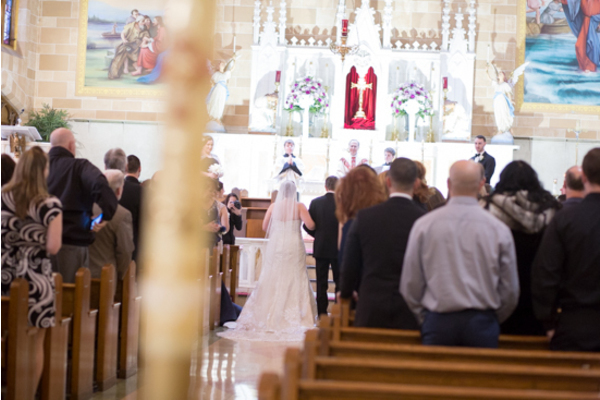 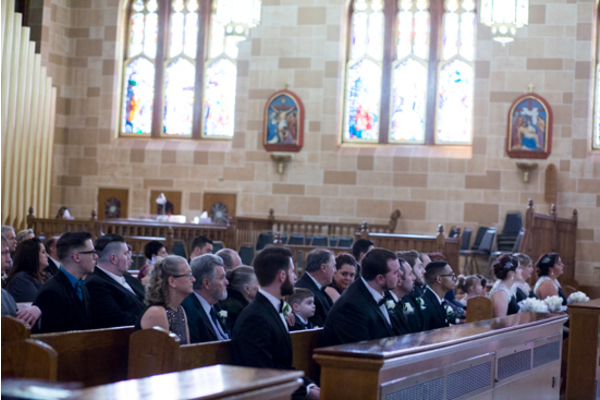 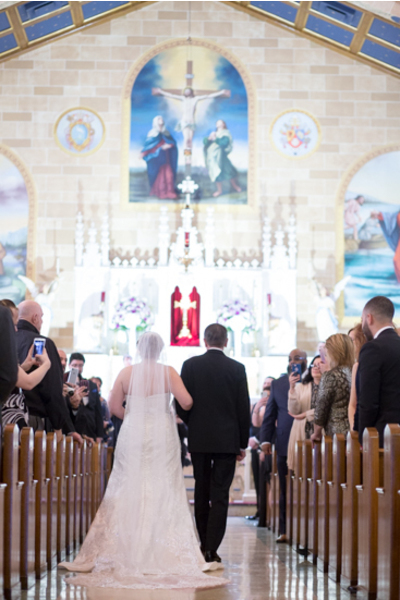 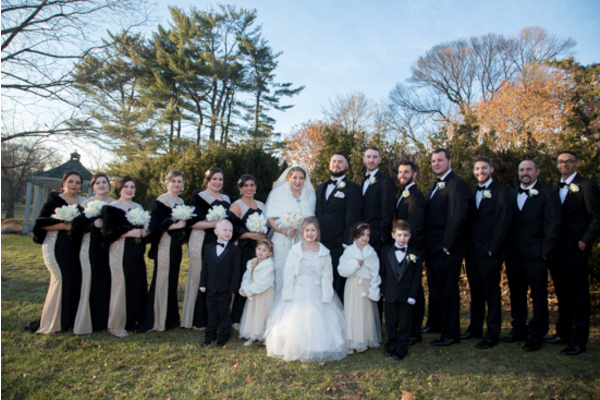 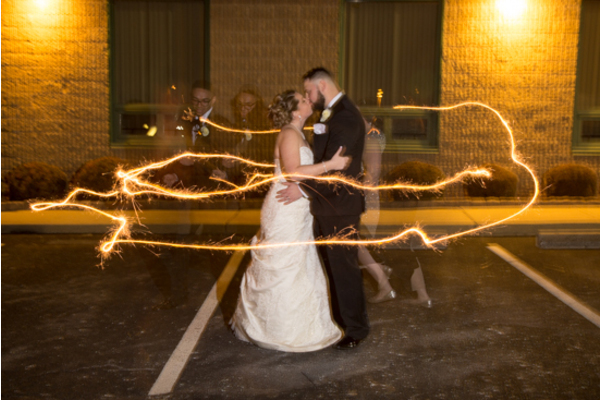 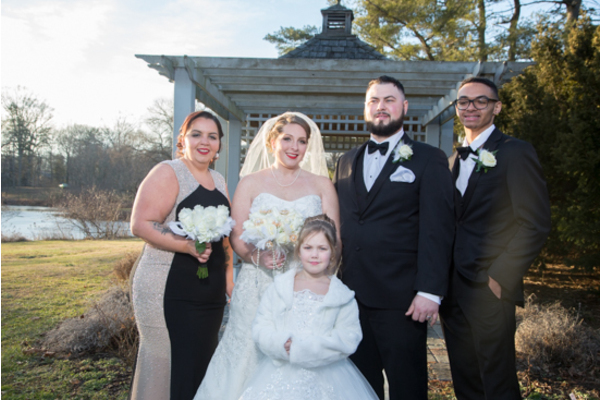 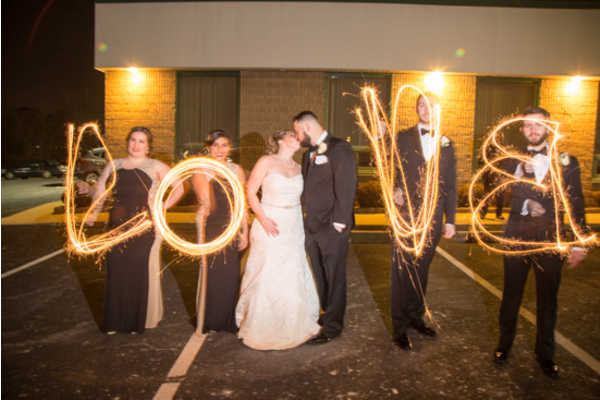 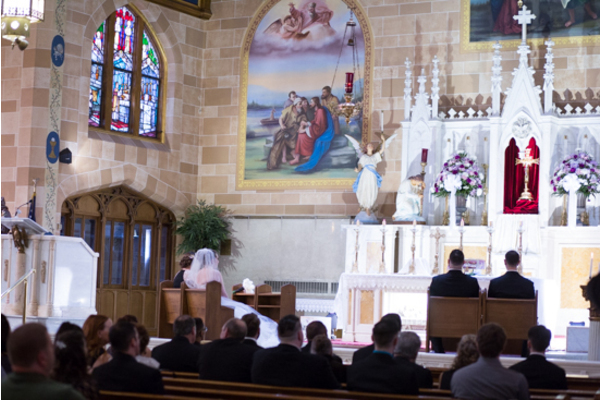 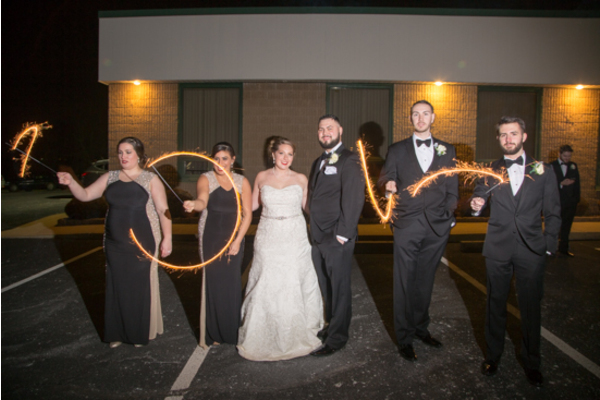 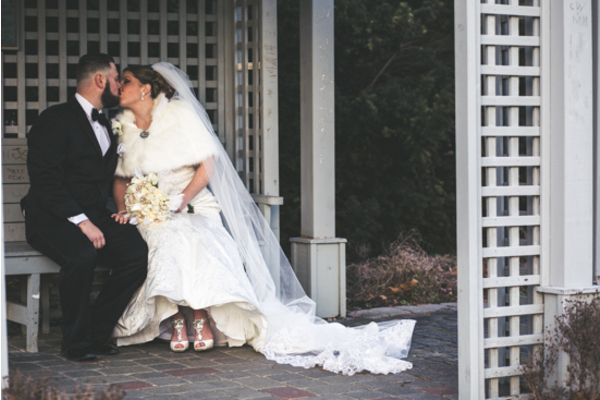 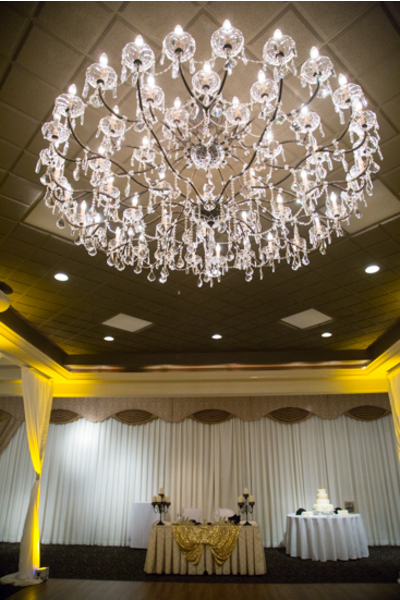 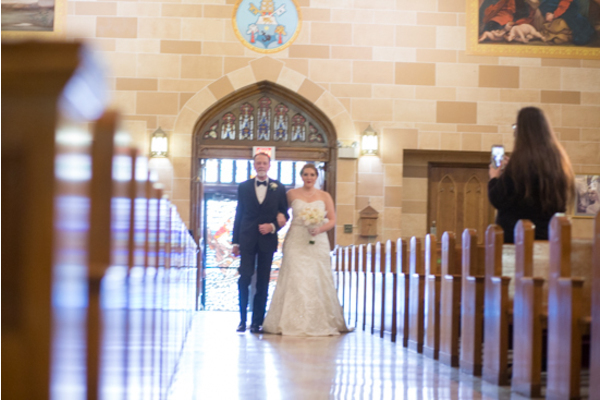 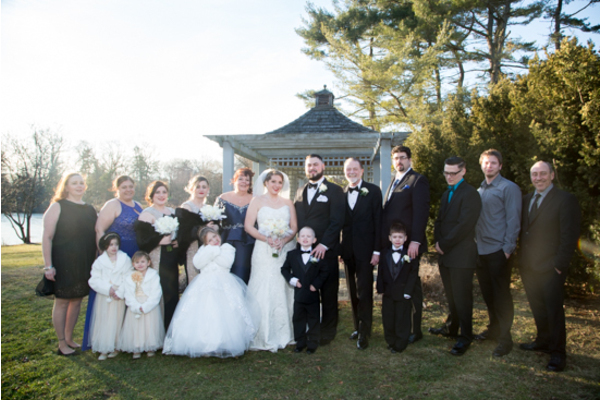 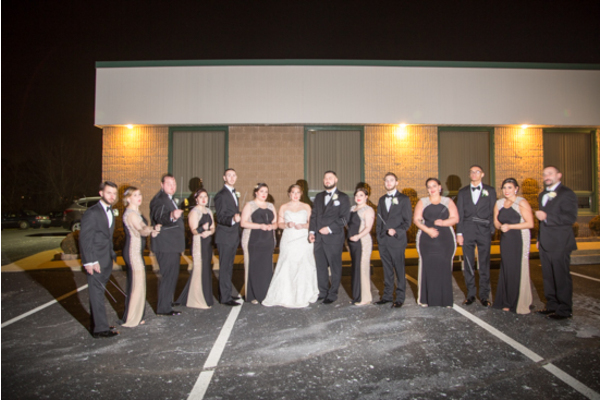 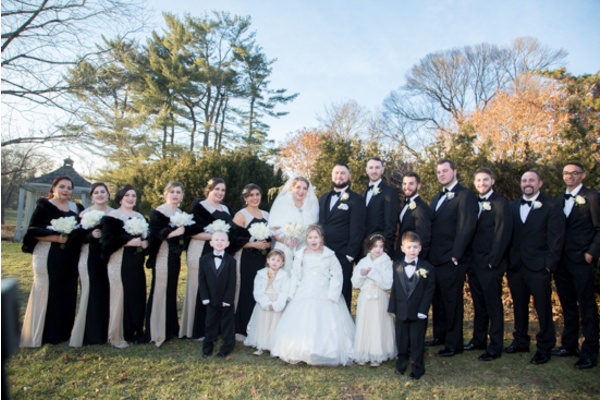 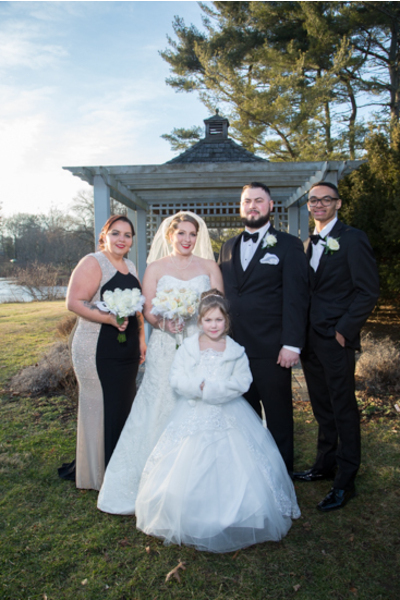 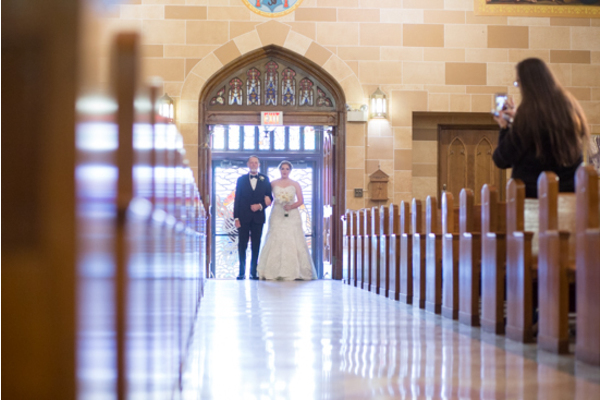 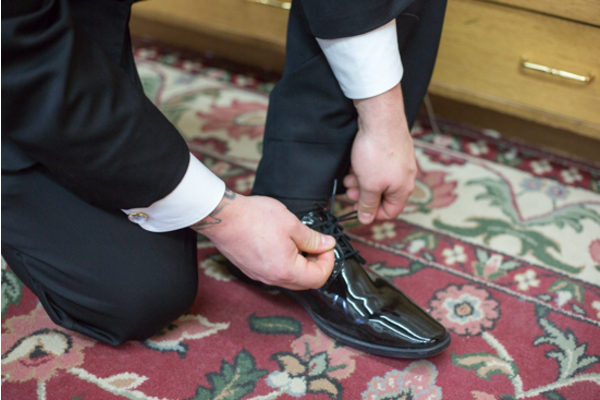 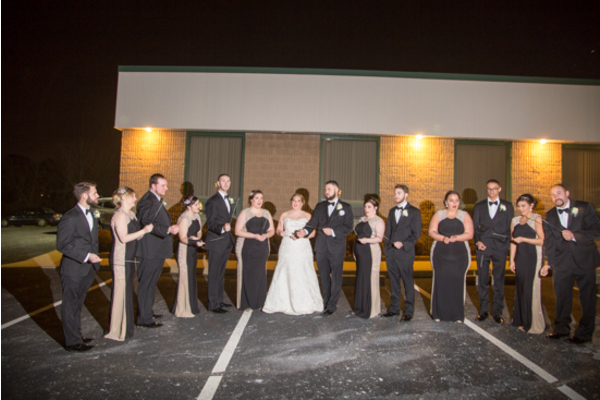 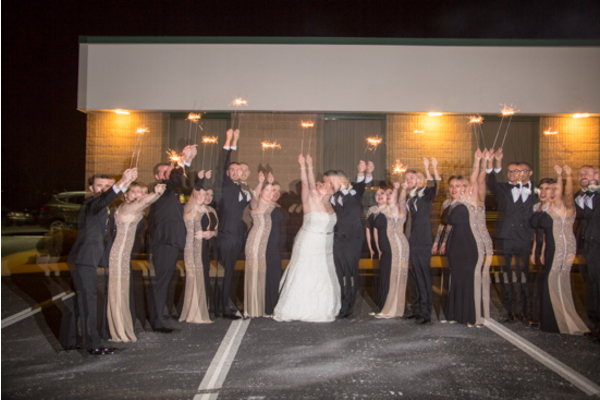 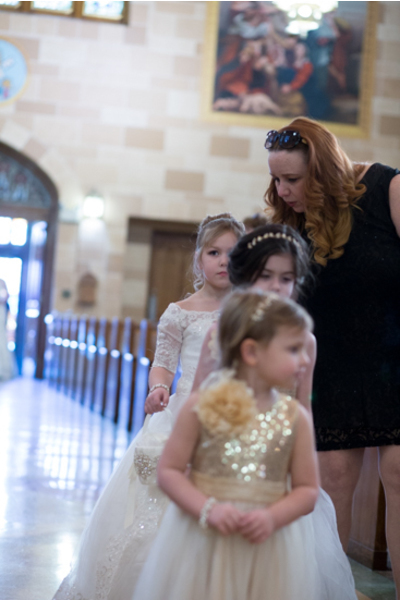 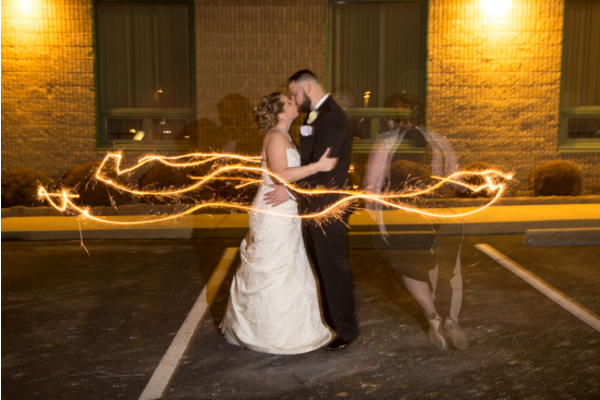 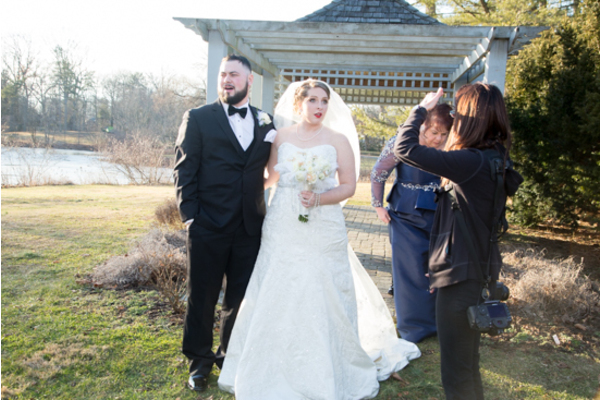 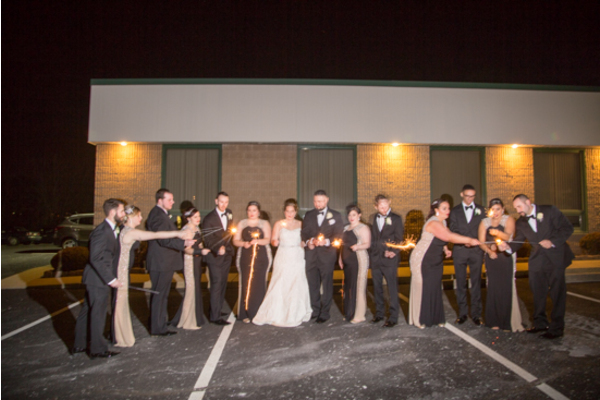 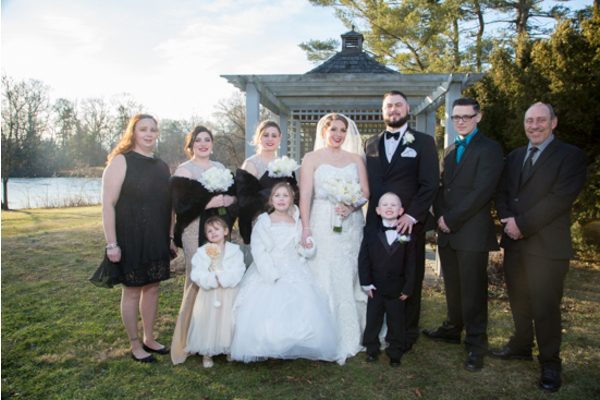 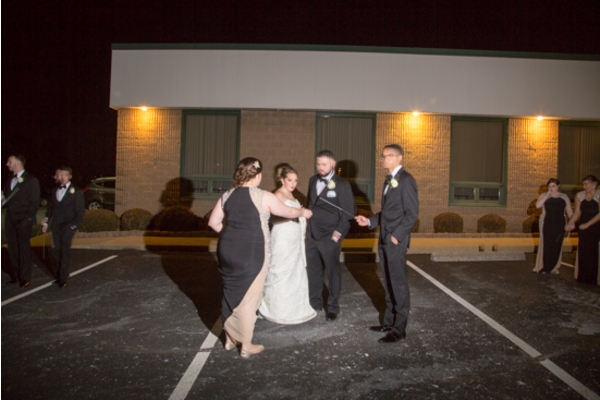 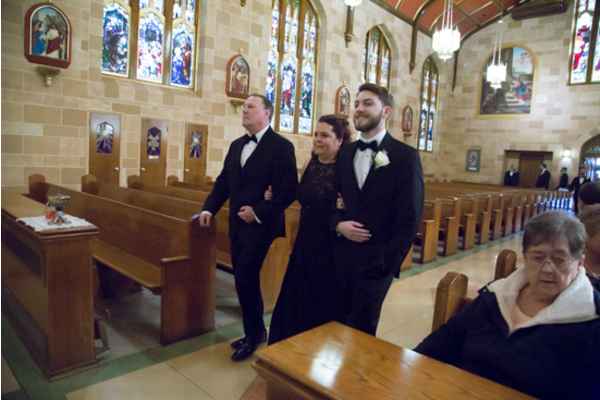 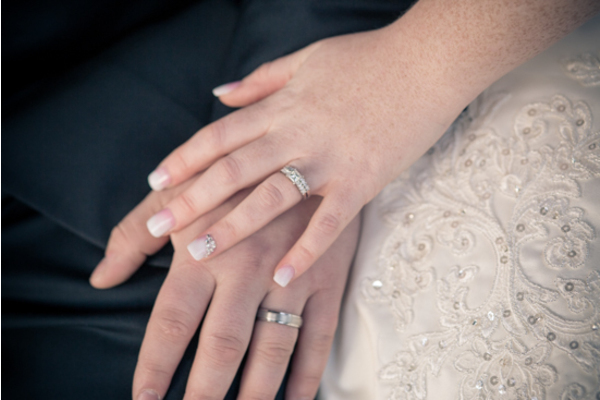 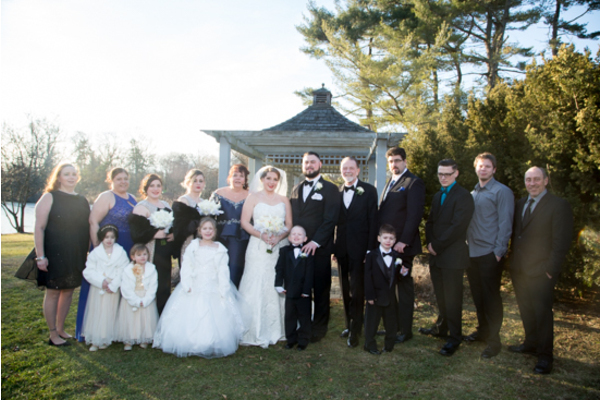 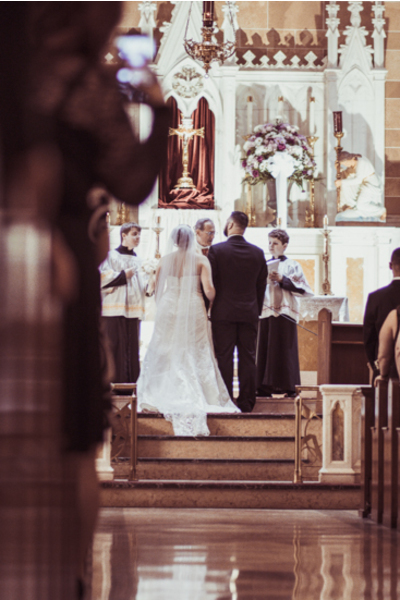 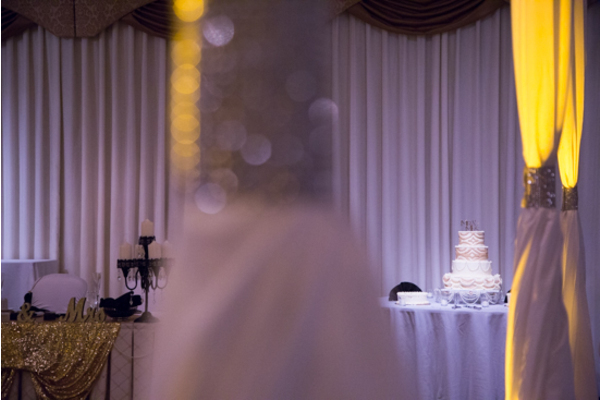 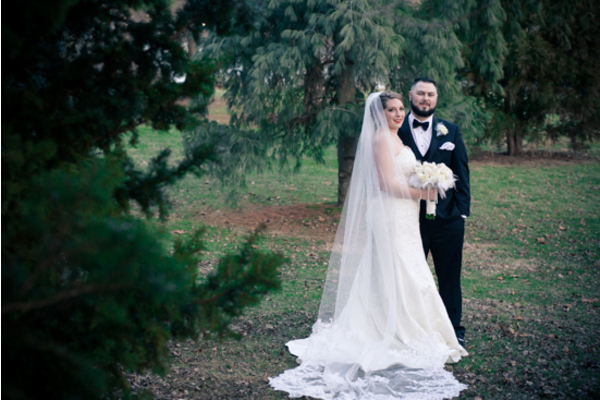 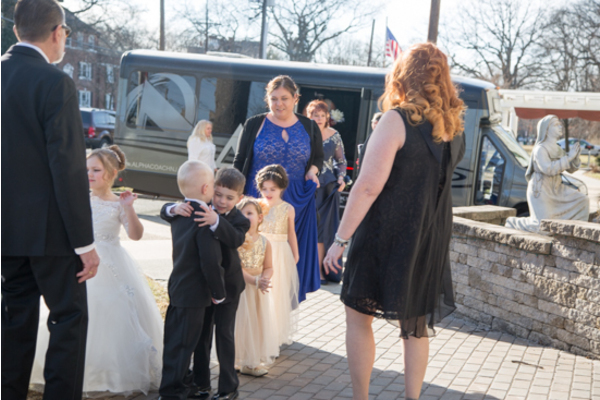 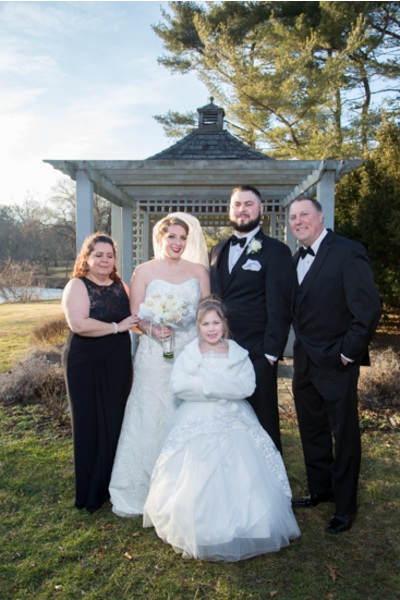 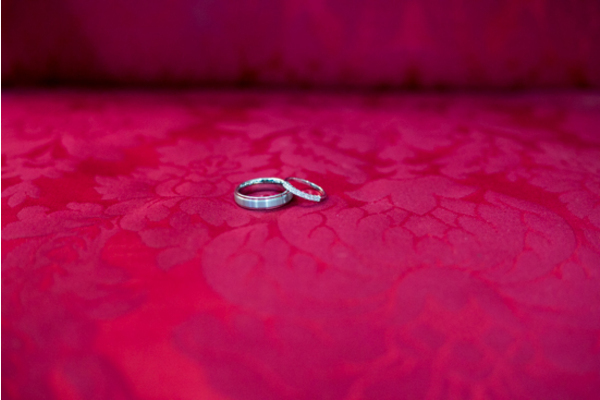 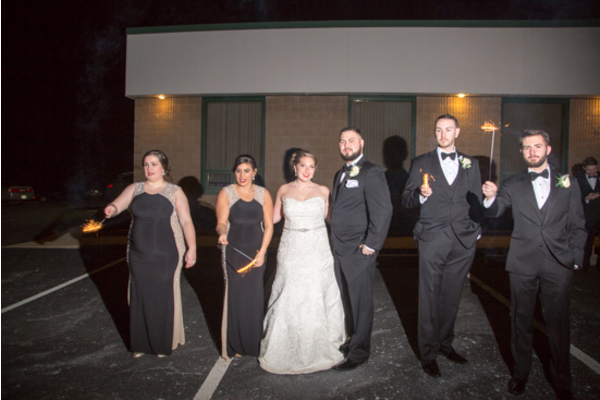 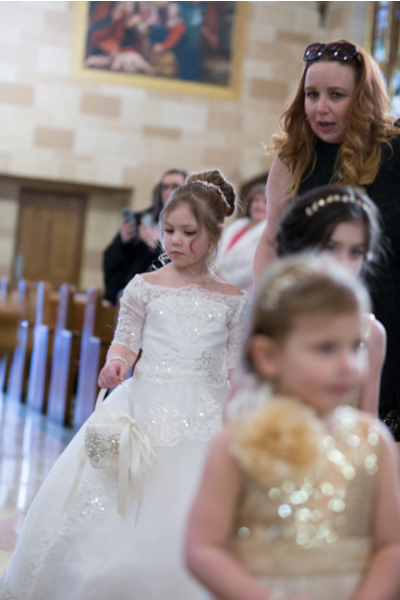 Our NJ Wedding Videographer was excited to capture incredible footage of the special day. 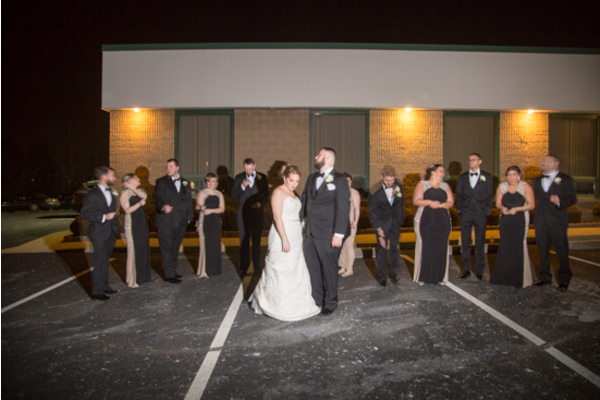 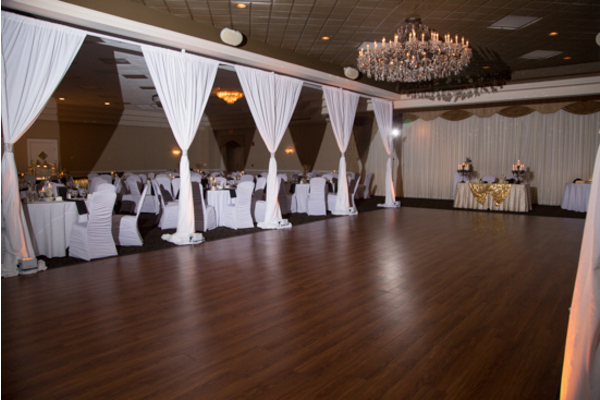 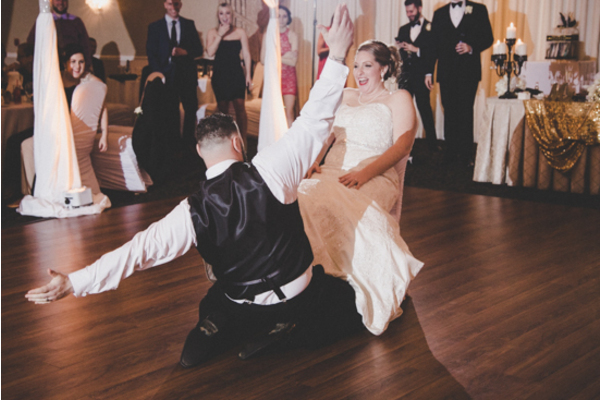 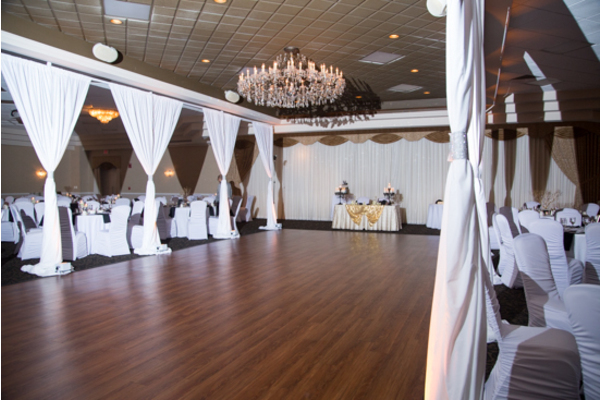 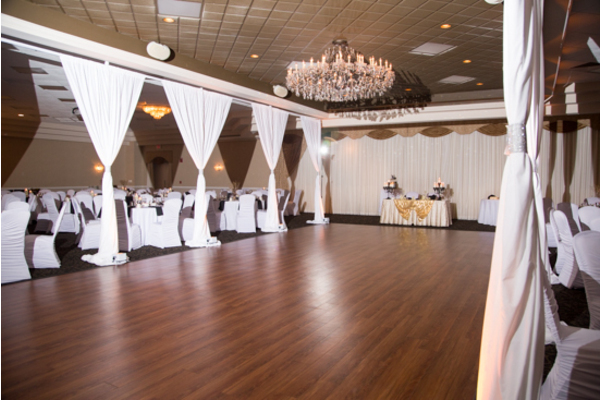 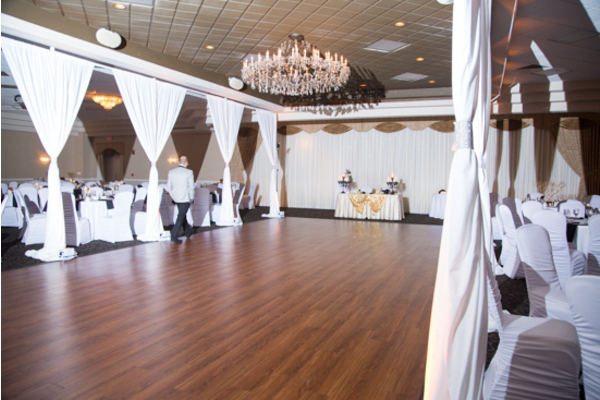 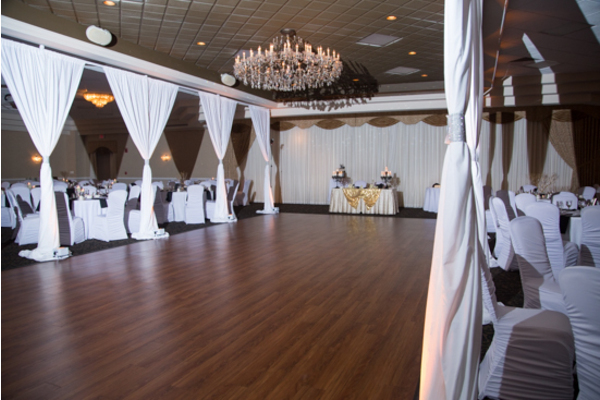 All eyes were on Alicia and Rob as Our NJ Wedding DJ opened up the dance floor with some classic songs! 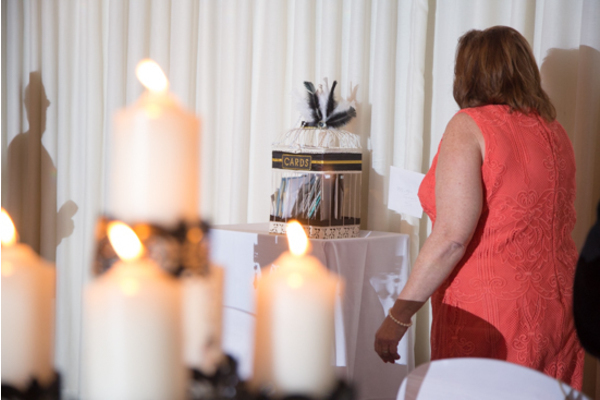 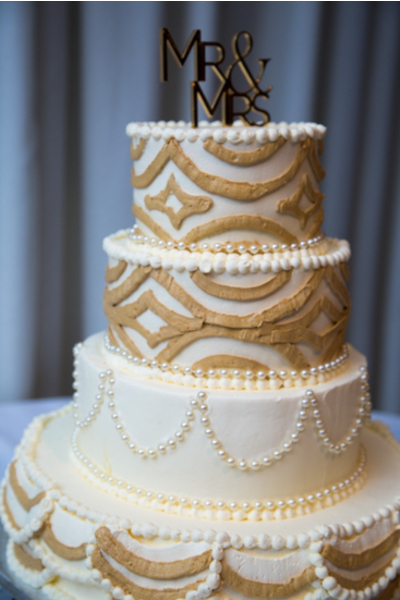 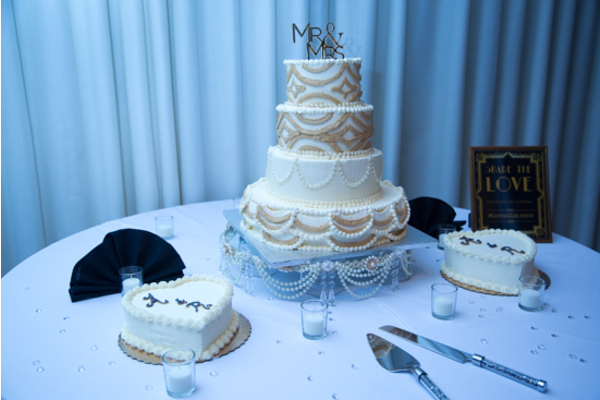 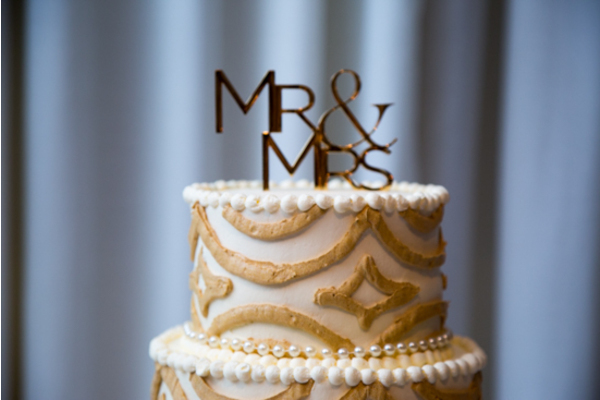 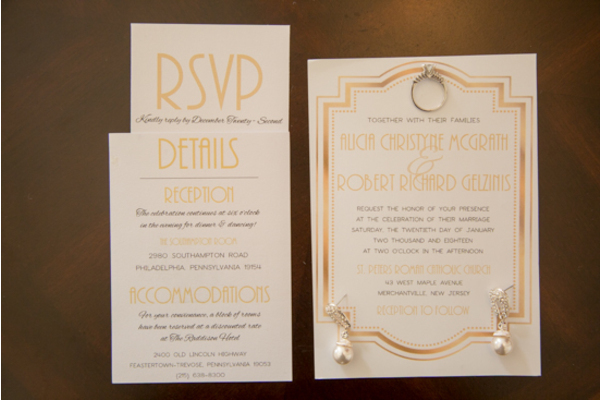 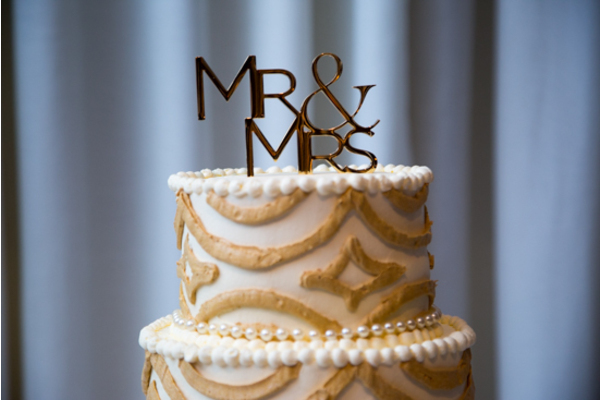 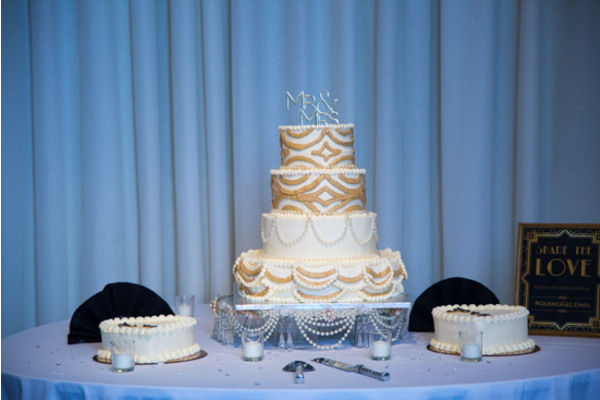 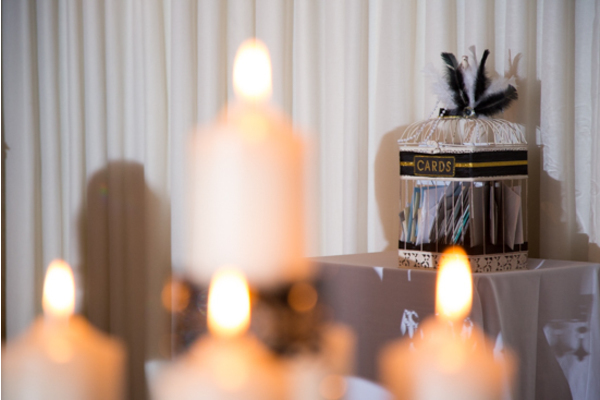 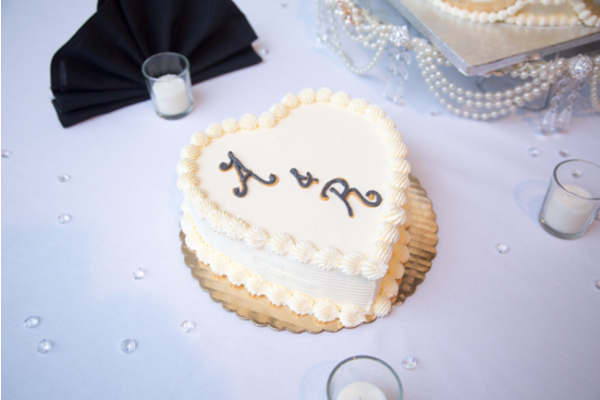 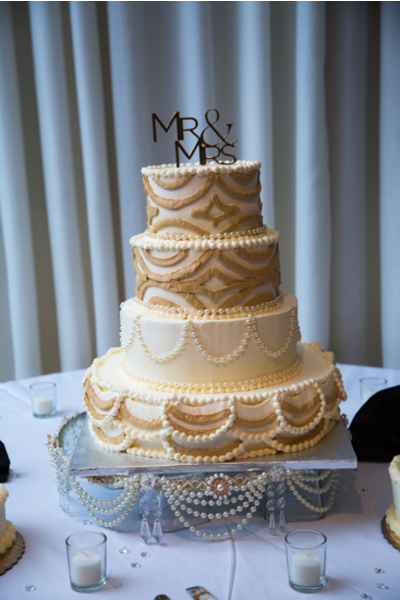 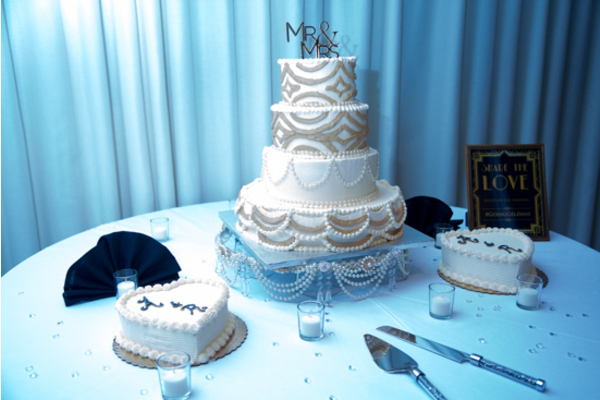 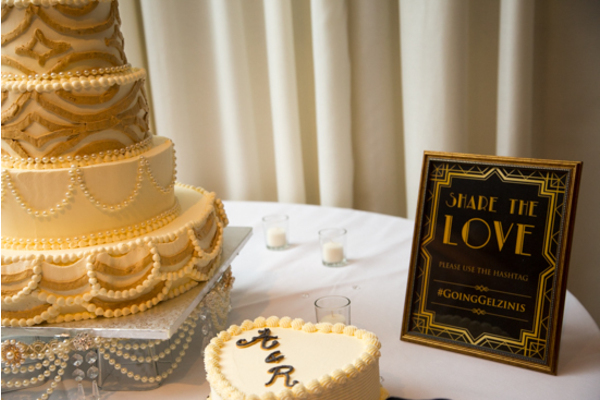 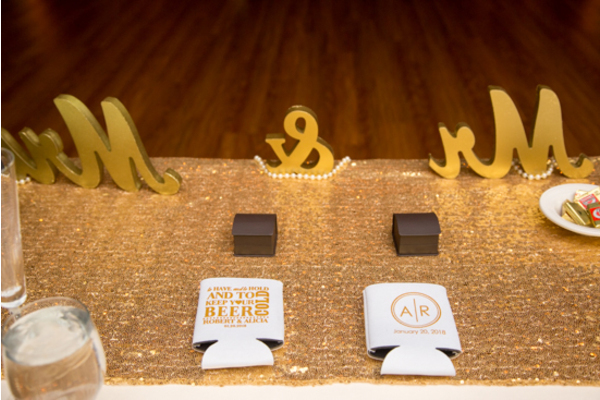 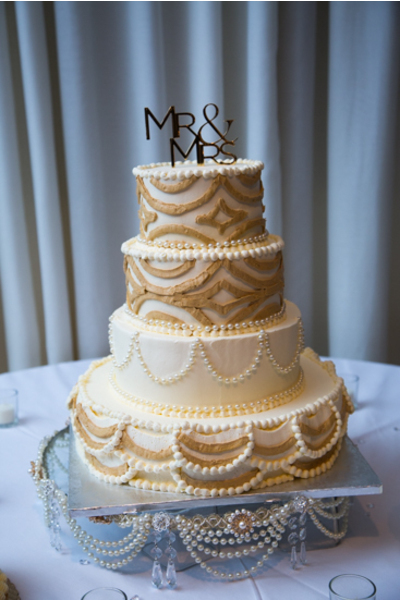 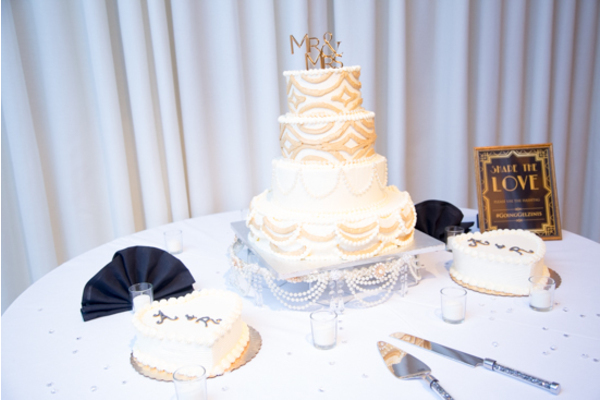 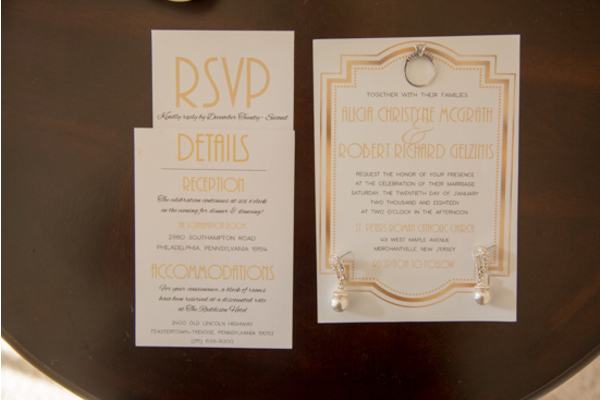 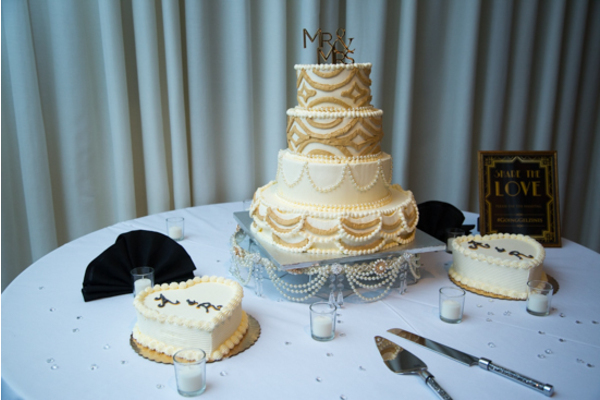 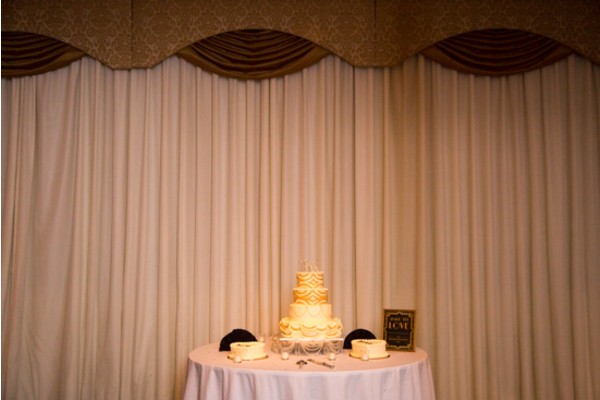 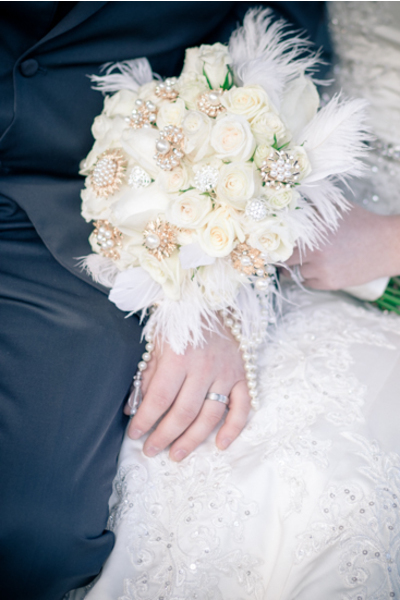 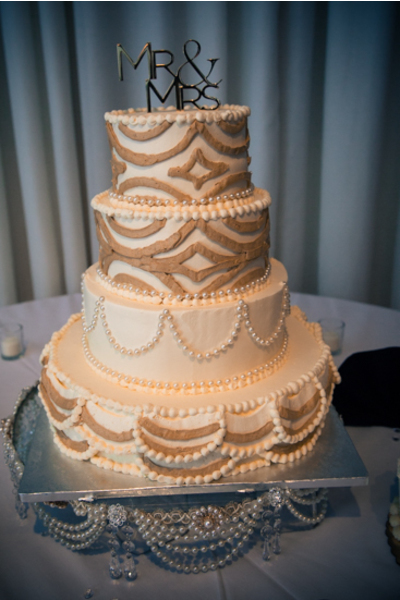 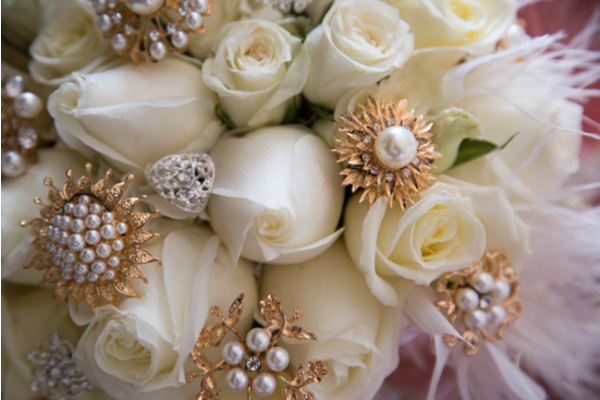 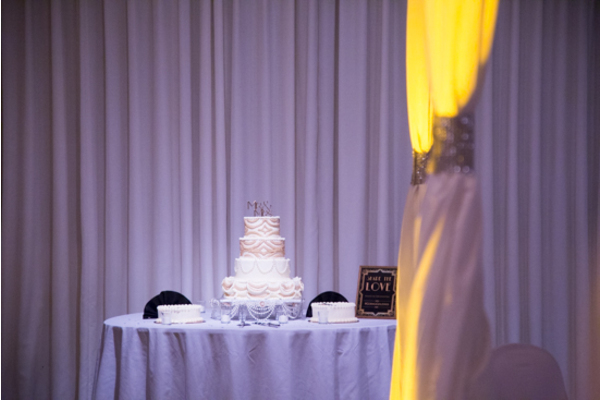 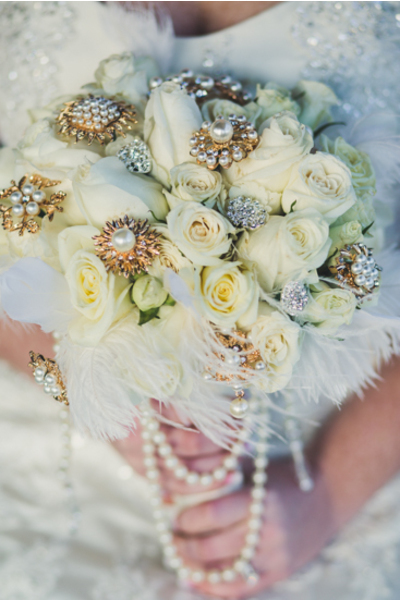 Later that night, Alicia and Rob cut into their detailed pearl and gold wedding cake. 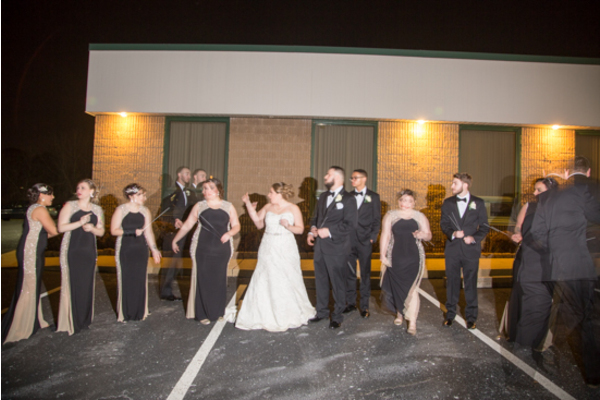 The couple and loved ones danced the rest of the night away! 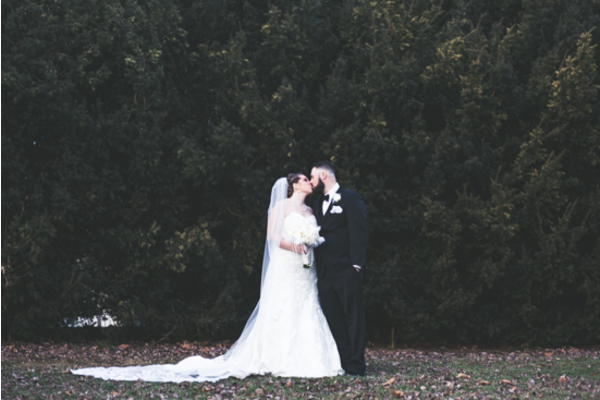 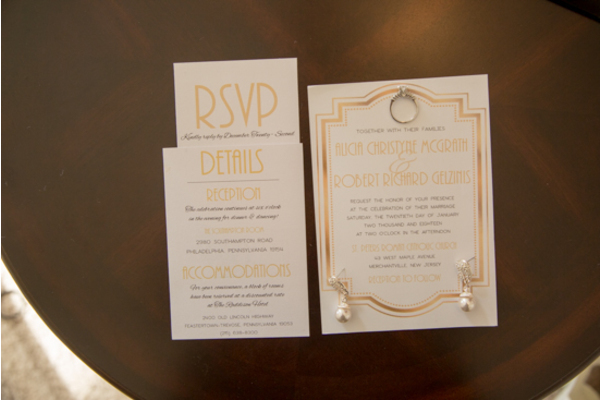 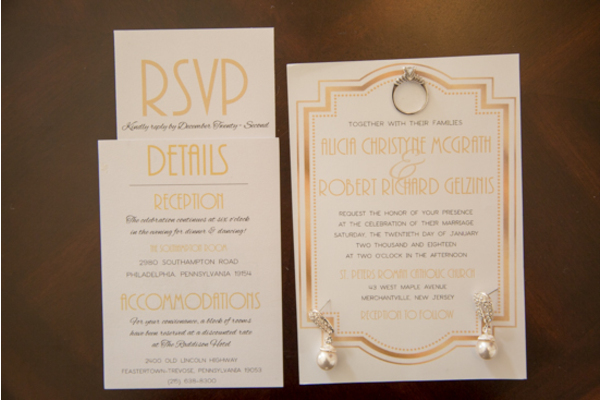 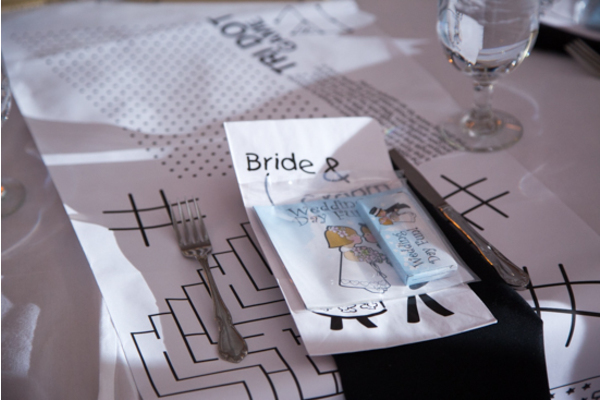 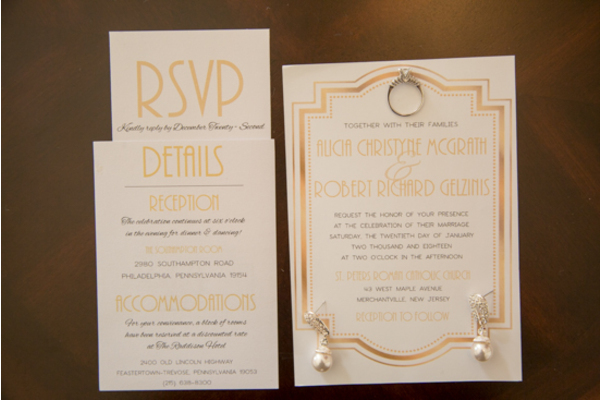 Congratulations again to Alicia and Rob! We wish you the very best in your future together.